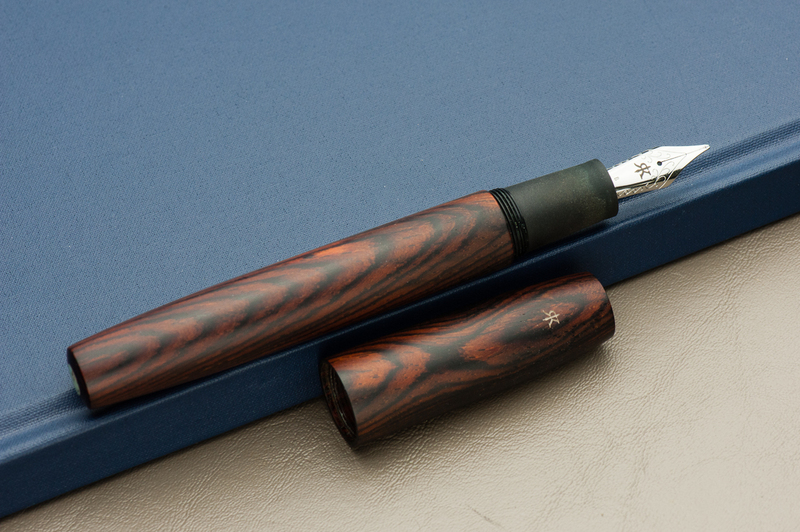 Katherine: I love the materials and finish of this pen. 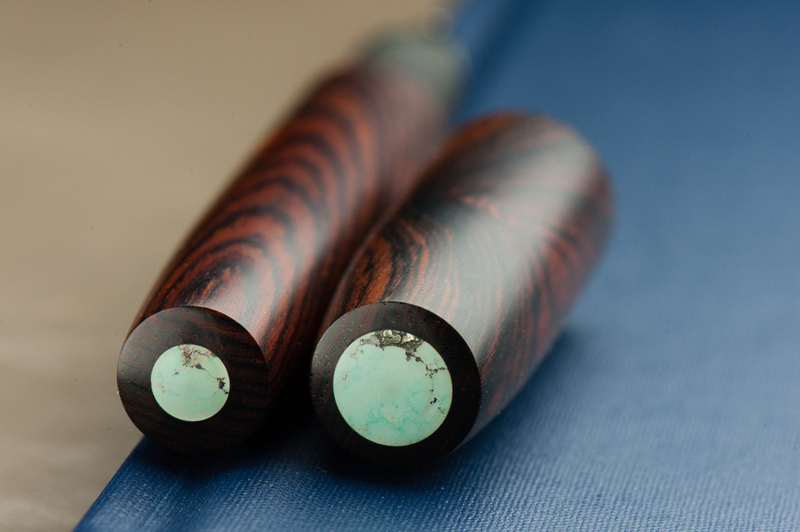 The warm, rich wood paired with a turquoise finial is a beautifully organic pairing! However, I think the pens proportions are a weeee bit off? The barrel looks a little too long to me. But, I do tend to prefer stubbier pens. Pam: This is one big pen. 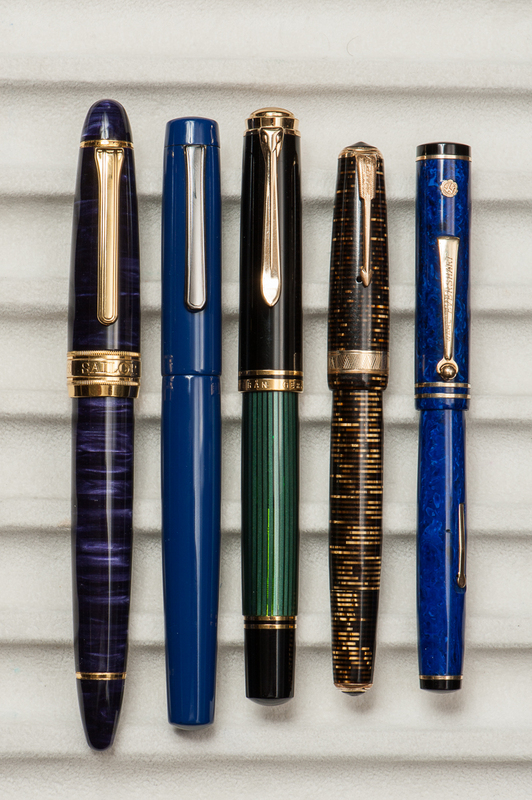 Even for someone who loves the Pelikan M800 and the Sailor King of Pen. 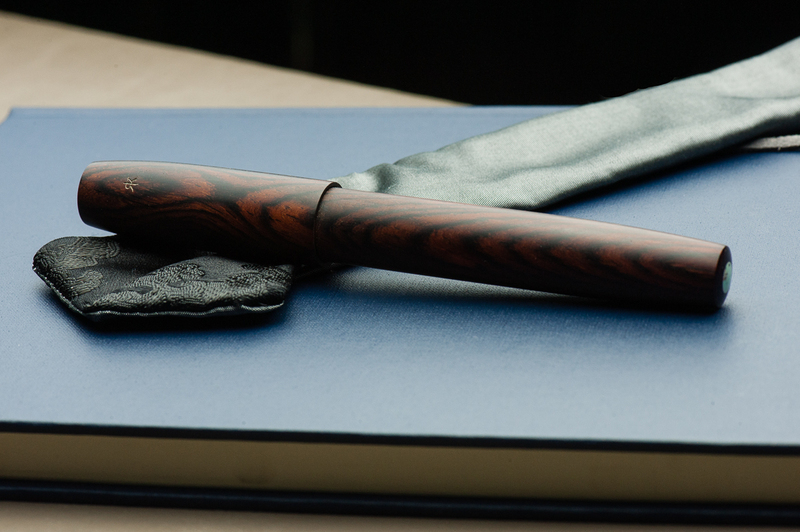 The craftsmanship on this pen is obvious. 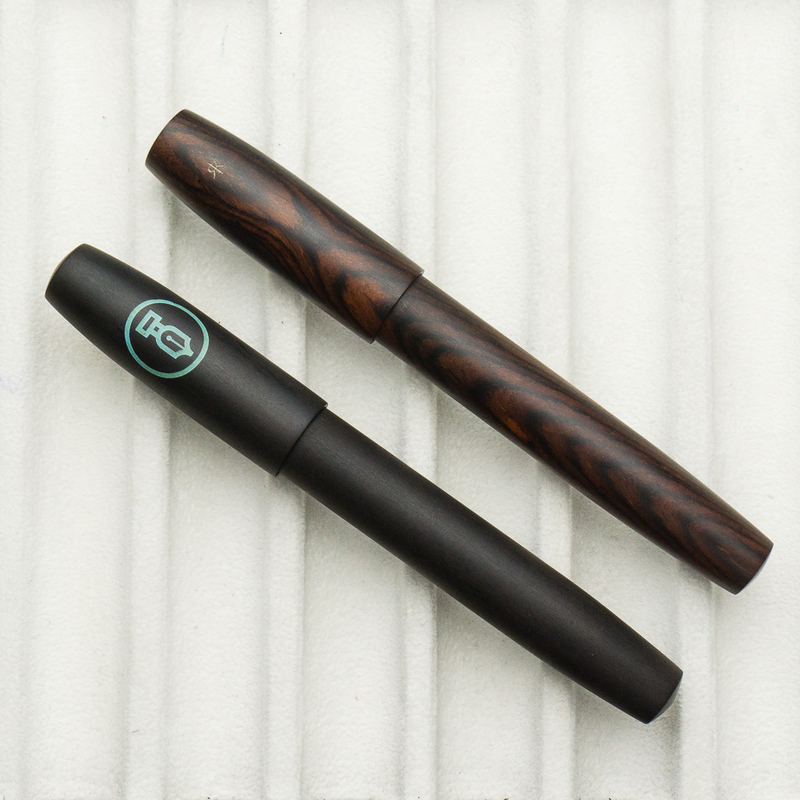 From the warm and super smooth finish of the wood, the subtly engraved Ryan Krusac logo, and the turquoise inset, you can see the care that has been put into this pen. It’s a work of art. 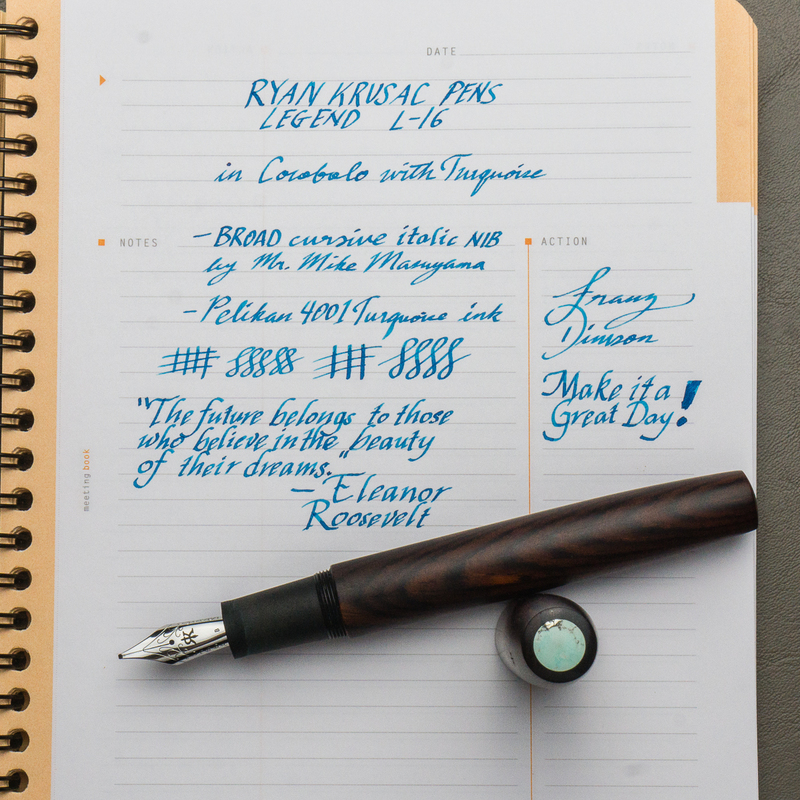 Franz: The Legend L-16 is quite impressive in the hand as it is the largest in Ryan Krusac’s Legend pen line. The L-16 denotes that the barrel’s diameter is 16mm and then another size is the L-14 which is 14mm. Ryan had also announced the L-15 size (15mm) but that is still unavailable at the time of this review. 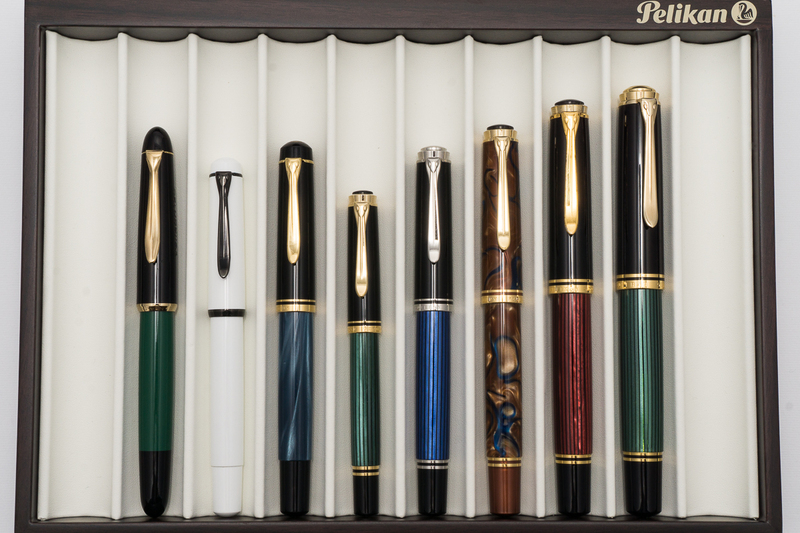 The Legend pen can either be ordered from his website or at any pen show that he attends. 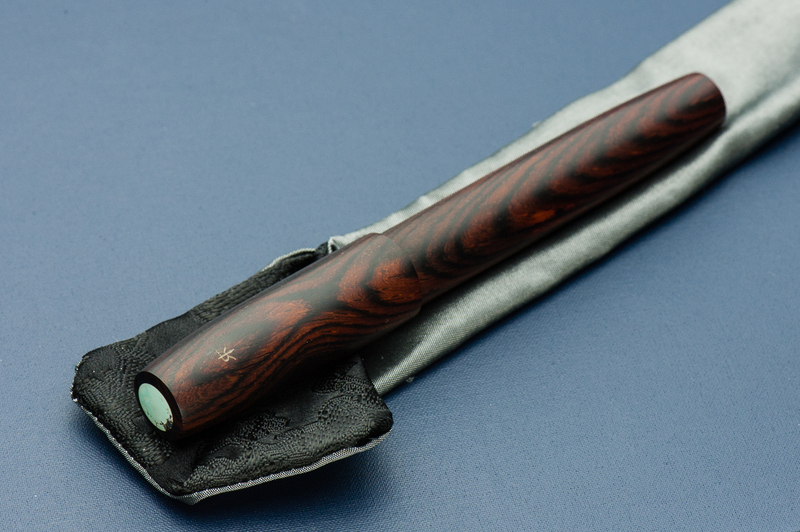 I happen to have snagged this Legend in Cocobolo from Ryan at the 2017 Atlanta Pen Show. 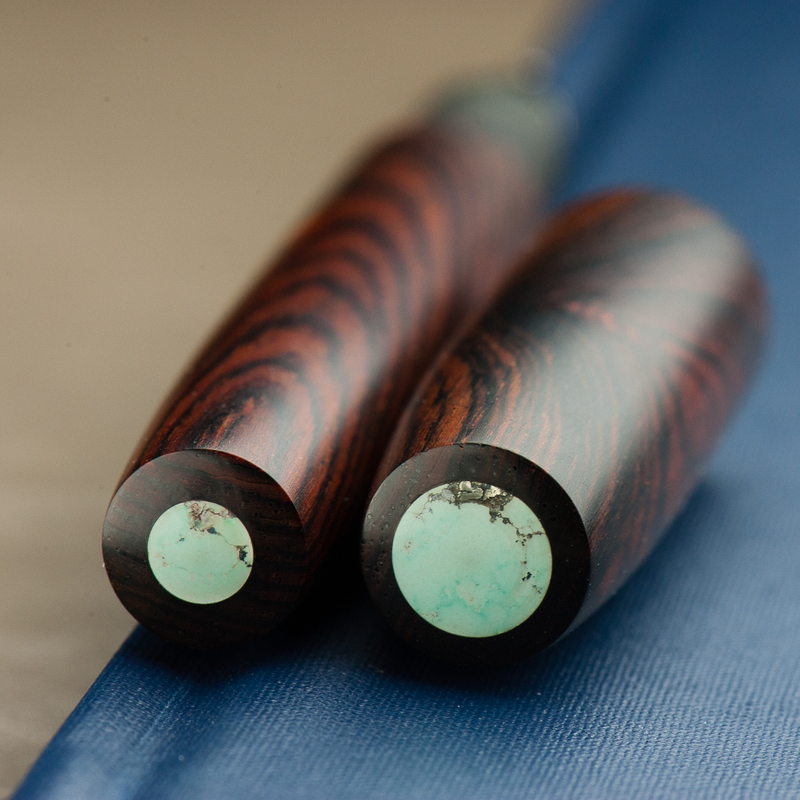 The dark Cocobolo finish is complemented by the turquoise inlays on the cap and barrel. 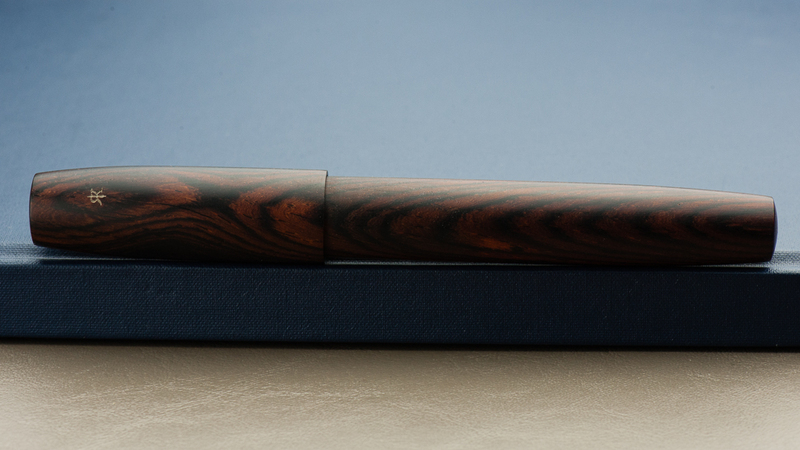 Being a wood pen, the Legend gets warmer while writing as well as the ebonite section. I must mention that Ryan pays attention to details with each pen he creates. When you are writing with the Legend, the best looking grain of the wood faces you as you write and also, the cap and barrel aligns perfectly each time. Smart move to make it a single thread! Katherine: The pen fits a Jowo #6 nib. The nib on this one had a nice BCI, unlike many of Franz’s other BCIs, this one had a little bit of tooth. It’s unlike most of the Masuyama grinds I’ve used, but it was a perfectly usable nib with some character. Would borrow (from Franz) again! Pam: It’s a great CI. I find the nib to be crisp and wet. It is pretty toothy, but I greatly appreciate the feedback. 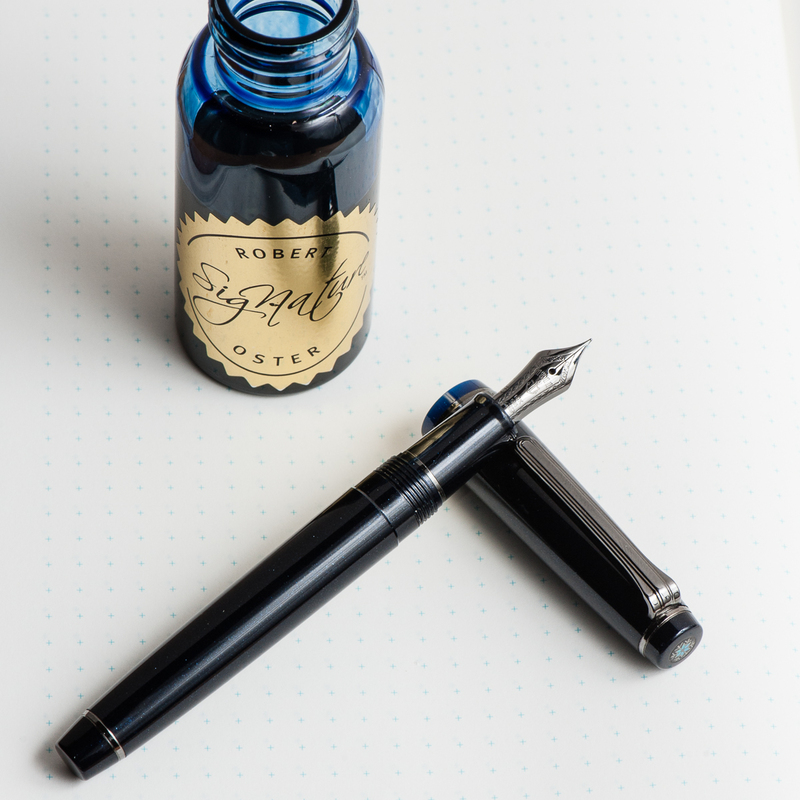 It makes for a unique writing experience. 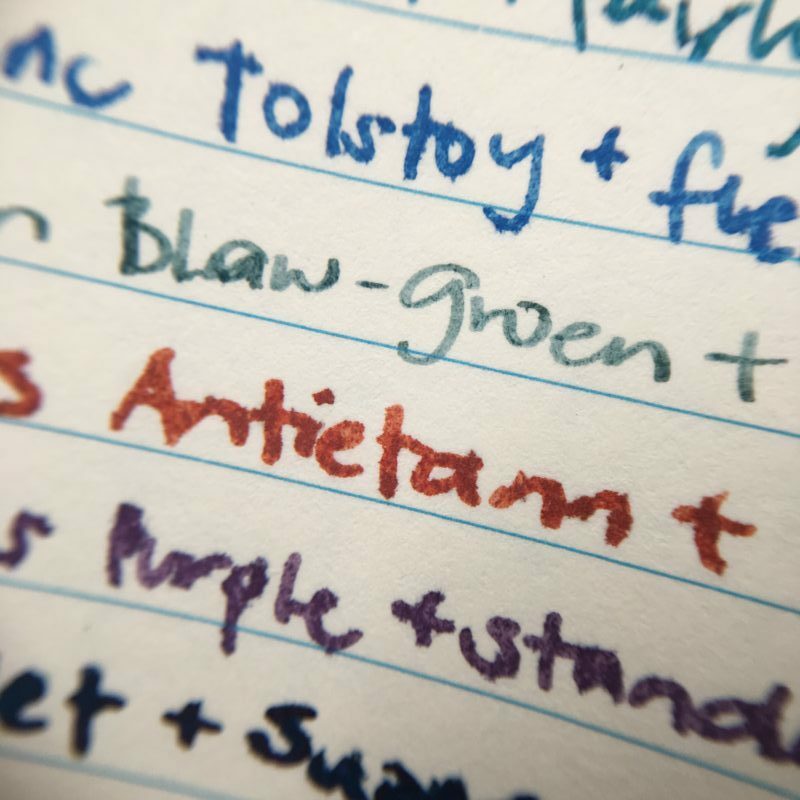 It did show off the sheen of Pelikan Turquoise fantastically. Franz: When you buy a pen from Ryan, you have a choice of steel nibs or 18-karat gold nibs. I opted for a broad steel nib with the intention of having it ground by Mr. Mike Masuyama at the same pen show. Needless to say, the juicy broad nib was transformed into a crisp, juicy cursive italic. The broad nib can go through ink quite fast but the included standard international cartridge/converter does its job as it should. 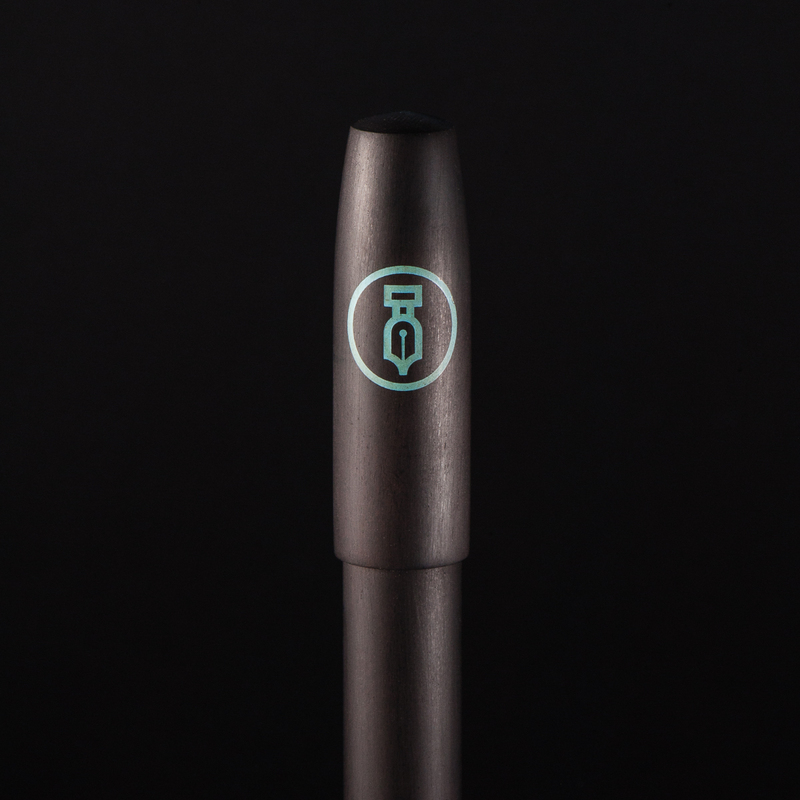 Also, I really love Ryan’s logo on the nib as it makes a “generic” Jowo nib match the pen. Katherine: This pen is quite long for me… but surprisingly light. As a result, it’s a very comfortable pen for me to write with despite its size. Pam: I am surprised how comfortable I found this pen. 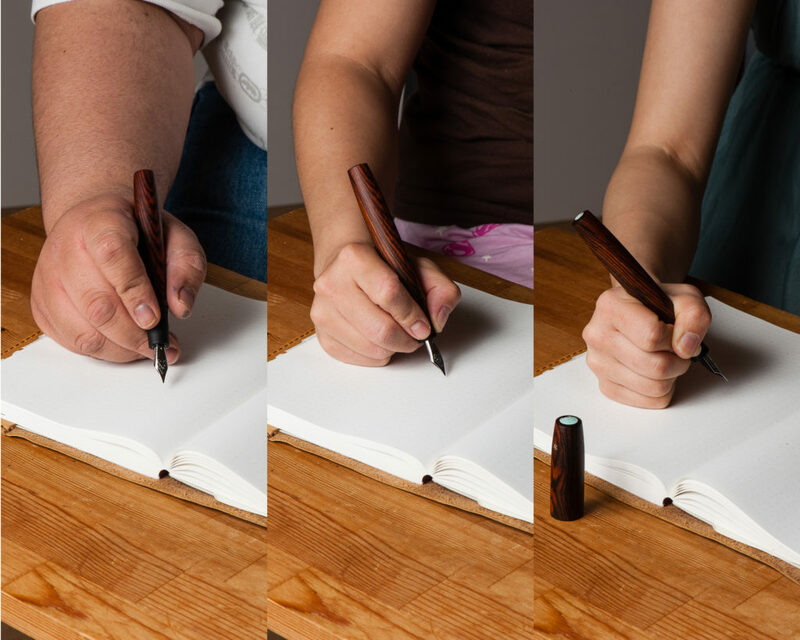 The length and width/girth of the pen is similar to the Sailor King of Pen. The Krusac is lighter for me. 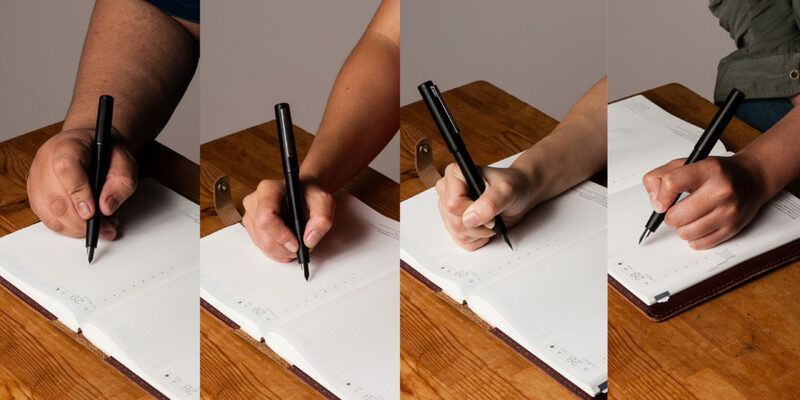 Due to the width of the pen, it’s quite comfortable to hold in the tripod grip. However, for those with the iron fist grip, the step and the threads are right below where I would place my thumb. No thread imprints for the win. Franz: The Legend fits my hand very well and my journaling of about 15 minutes was very enjoyable. We may have taken a hand comparison photo of the pen with the cap posted but neither of us wrote in that mode. Reason being? 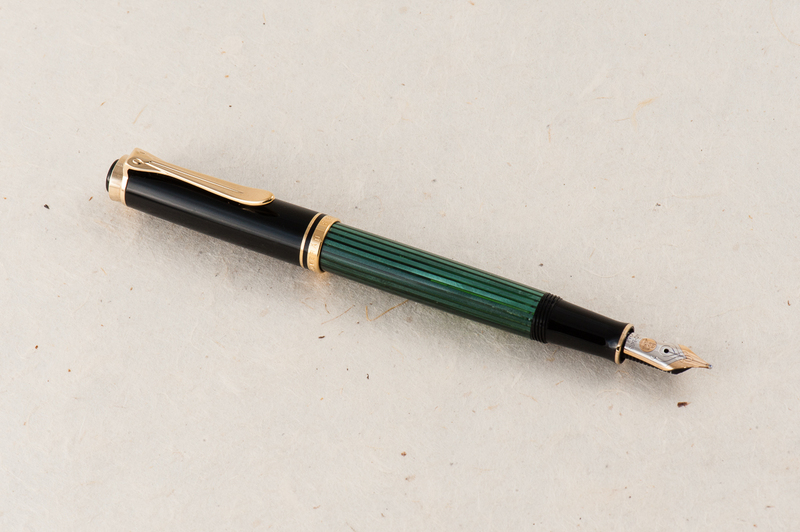 I don’t believe this pen was made to be posted as the cap threads can mar the wood finish. Also, the cap only touches less than half an inch of the barrel which makes for a very long unwieldy pen, and the cap is unsecured and can wiggle off while writing. Unposted, this pen is plenty long even for my bear paw. Katherine: The lack of a clip or rollstop makes this one a bit of a danger to EDC… I imagine it doesn’t do well when hitting the ground. (Don’t worry Franz, I didn’t test that!) 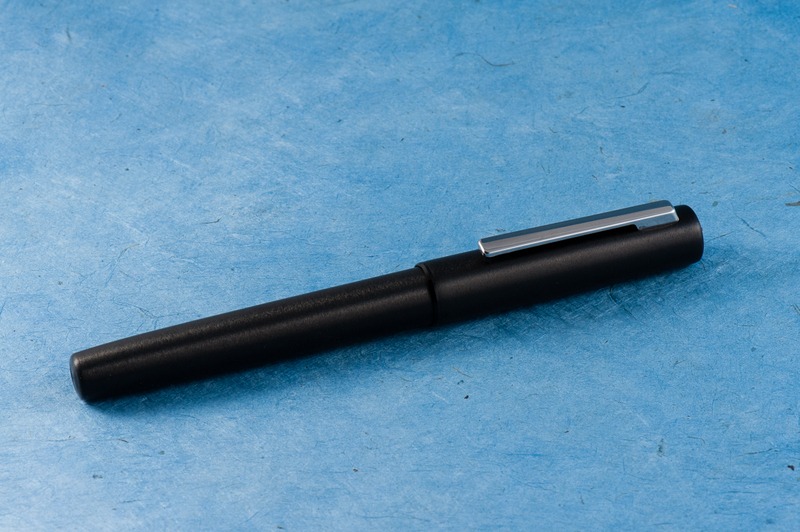 Additionally, it takes a full three turns to uncap — so I found this pen was a suboptimal EDC. But a lovely home desk-living pen! Pam: Honestly, it didn’t occur to me to try out the EDC-ness of this pen other than have it live in the Nock Sinclair. My hesitation was that it didn’t have a clip and I can’t imagine dropping this pen out of my coat pocket, especially since it’s not mine to drop. 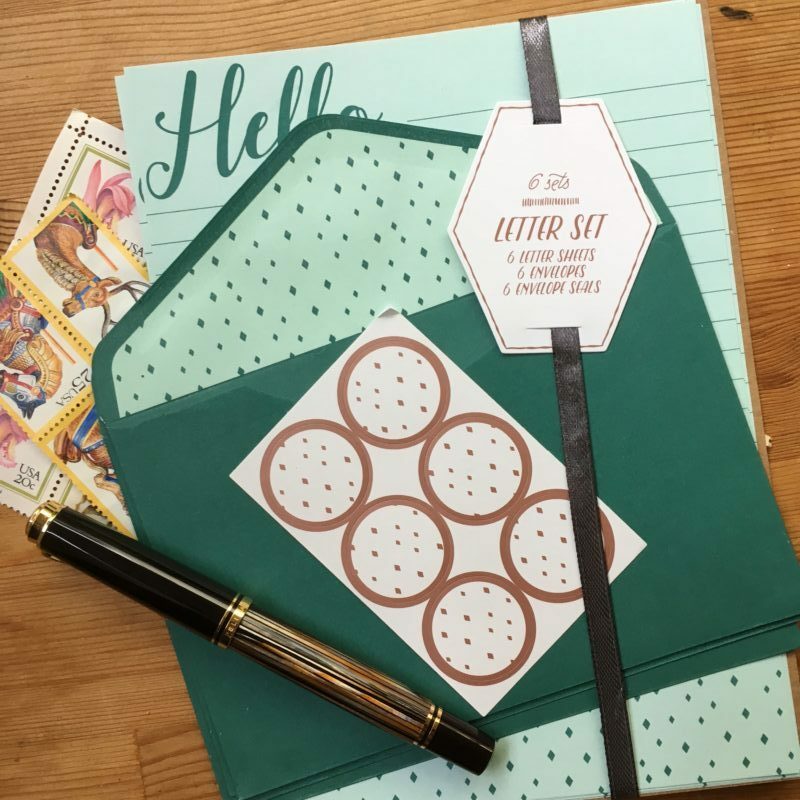 This is a “savor the journaling moment” pen where one would enjoy the finer things and slower moments in life. Keep it at the desk or in a case is my recommendation. Franz: I do echo the ladies above that the Legend pen being clipless is a risk for ROFY. (Rolling-On-Floor-Yikes!) So I’m a bit more conscious when I am using this pen at work and avoid walking around with it. I do enjoy writing with it while I’m at my desk during a call or something else that doesn’t require me to move around. And because the pen is single-threaded to maintain the cap and barrel alignment, the trade-off is taking 3 full turns to uncap for use. Not really the best for on-the-go purposes. Katherine: If the proportions of this pen were a little bit different, I think this would be love. But, thankfully for my wallet, they’re not, and while it’s a nice pen, it’s not aesthetically balanced to me. Despite that though, it’s very usable even for my small hands — light and comfortable! 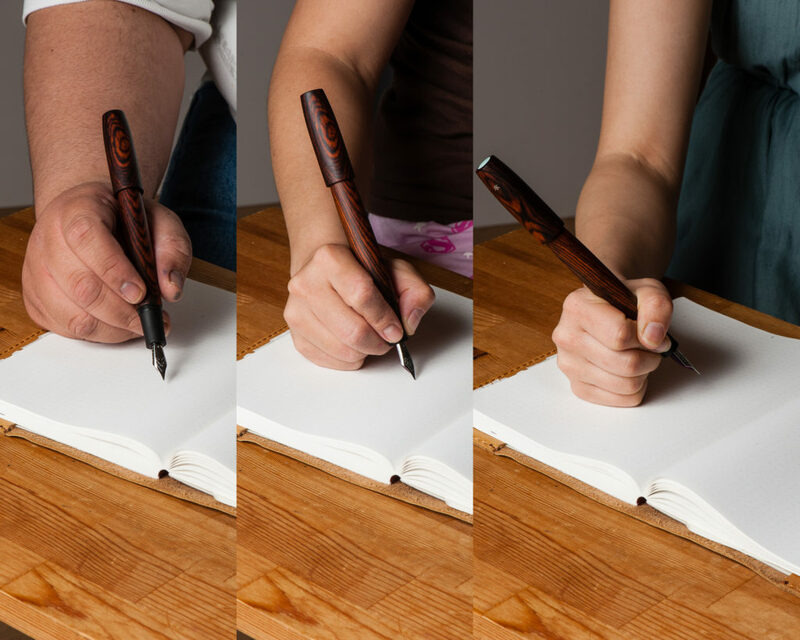 Pam: If you appreciate the craftsmanship and the beauty of natural materials like wood, I would highly recommend this pen to you. 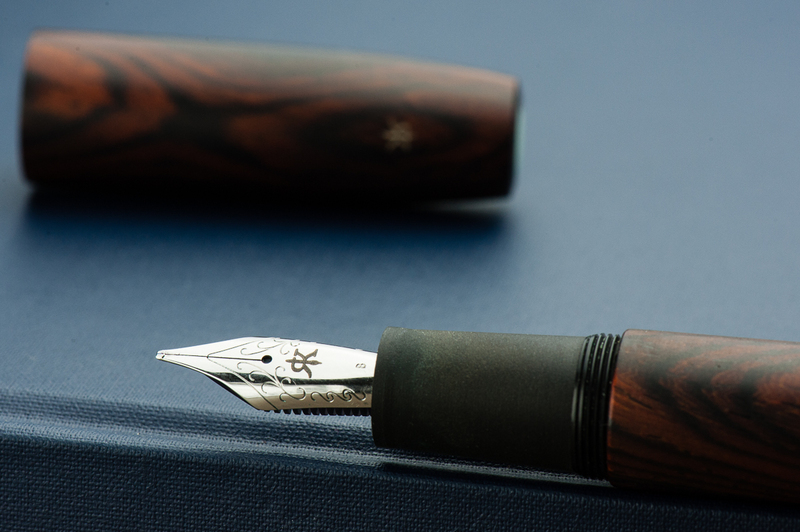 For many, it’s a worthy grail pen to covet. If this pen is too big for you, the good news is that Ryan Krusac has other sizes available! 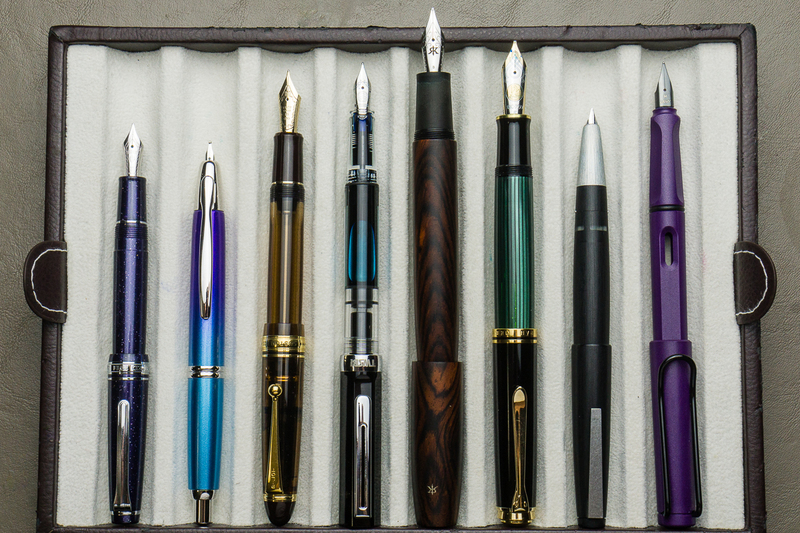 Be sure to check Ryan Krusac out at your nearest pen show to see what works best for you. 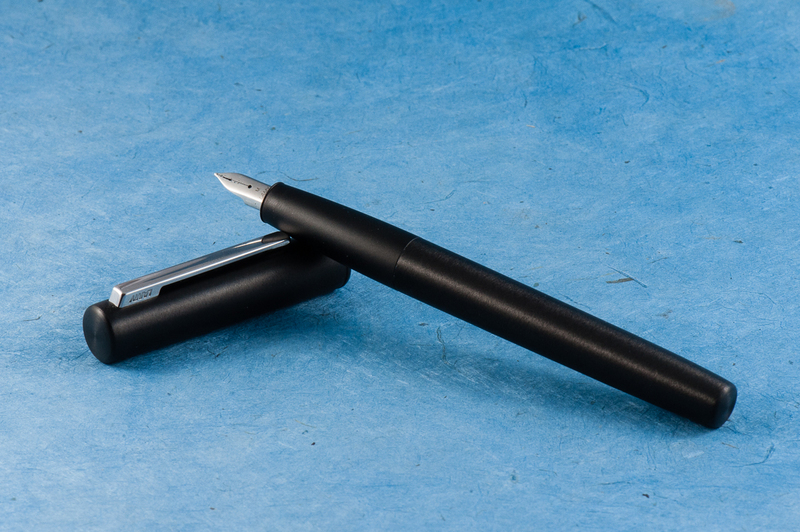 Franz: As I started my review above, the Legend L-16 is an impressive pen — size-wise as well as aesthetics-wise. Anyone who is interested in this pen must try it out and see if it’s for you. Ryan is currently based in Georgia so he will always be at the Atlanta pen show but he travels to several U.S. pen shows including the Los Angeles pen show, and the San Francisco pen show. One of the best parts of buying a pen from Ryan is that you get a handmade pen sleeve by his two daughters, Zoe and Sylvia. They even have their own handmade brand, zoia.co. The grey and black pen sleeve pictured above was included when I got the Legend in Atlanta. What else can I say about the Legend L-16? I like it… a lot! 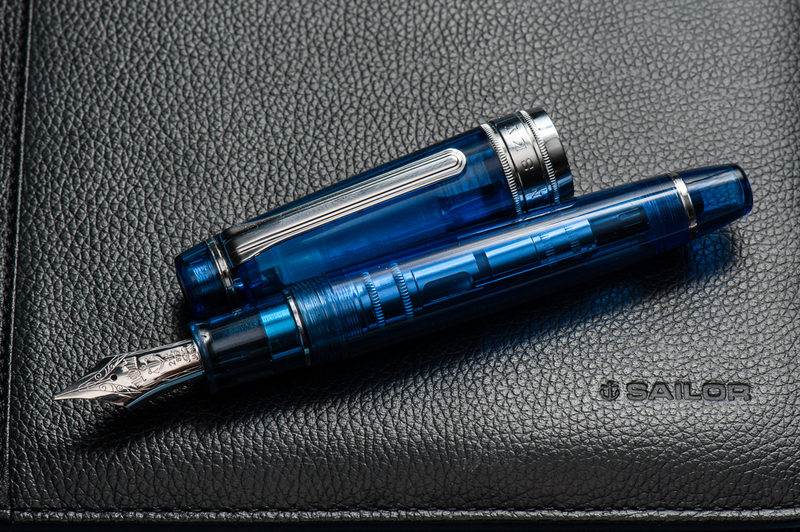 So much that when Cary (Fountain Pen Day), and Ryan collaborated on a pen to raise funds for Shawn Newton, I jumped on the opportunity to get the FPD Legend pen in the L-16 size as well. 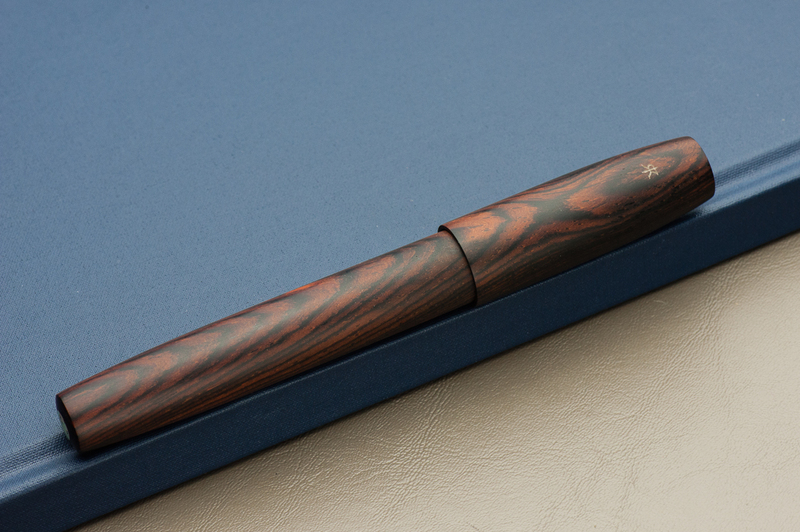 The limited edition pen is made with Gaboon Ebony wood (pictures below). Hello! Franz here and I wanted to share a story about the two vintage pens above. 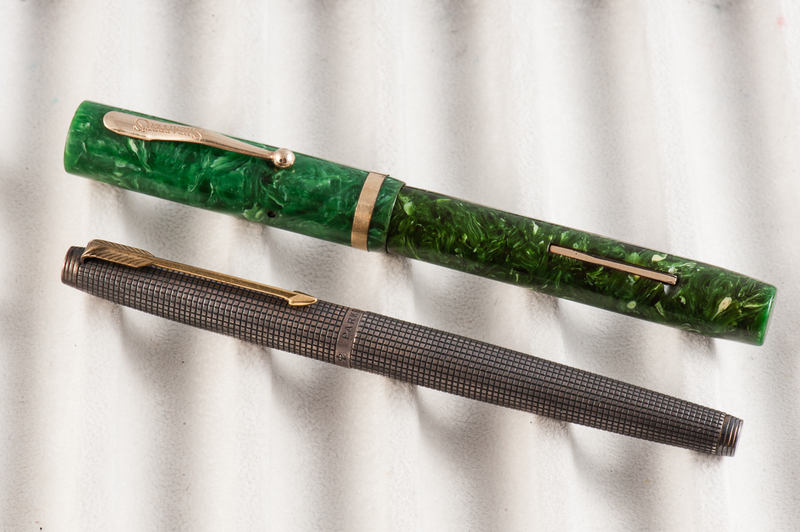 From top to bottom they are: Parker 75 in Sterling Cicelé, and a Sheaffer Flat-Top in Jade Green celluloid. On a Saturday while I was at work, a very good customer looked for me and astonished me. Let’s call him Dr. M, Jr. since he is a dentist. 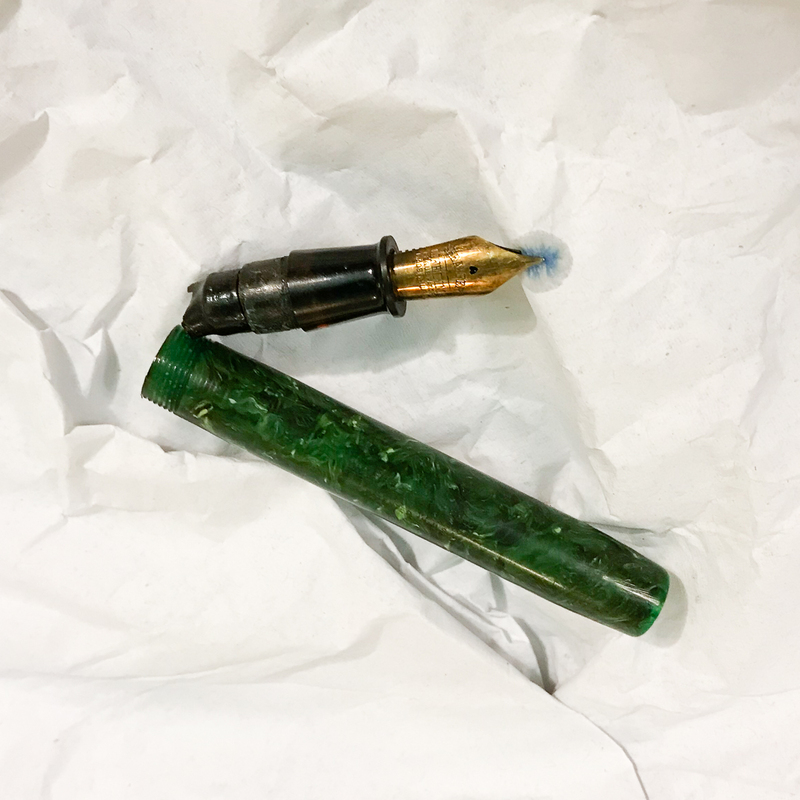 He said that he knew I liked fountain pens and showed me his father’s pens that he found at home. 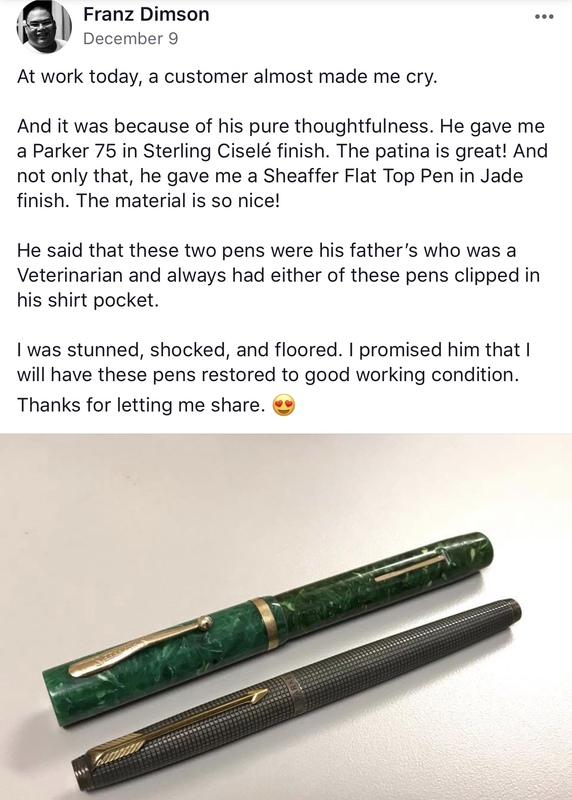 He asked me about them and I shared my little knowledge of vintage pens and told him that the silver one was a Parker 75 likely from the mid-’60s and the green one was a Sheaffer flat-top pen probably from the ’20s or ’30s. I told him that the Sheaffer’s cap and barrel were in beautiful condition and just needs a restoration of the internals. 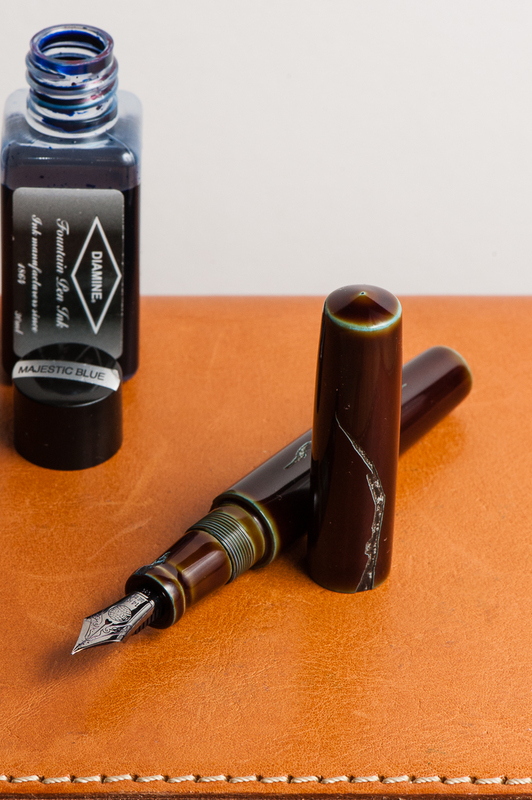 As for the Parker, the internals would just need cleaning from dried up ink and it would write like new. Dr. M, Jr. shared that his father was a veterinarian and he always saw him with either of these pens clipped onto his shirt pocket just like I do when he sees me. He then said that he would be happy to give these pens to me. At first, I declined and said that these were his father’s pens and he should keep it. But Dr M, Jr. insisted that I be the one to keep them since I am more likely to use Dr. M Sr.’s pens. So I accepted his gift with a very wide smile on my face, and with a promise that these pens will be restored and be put to good use. After Dr. M, Jr. left, I was so ecstatic and I immediately shared the story on the Facebook group of the San Francisco Bay Pen Posse. Below was my post and a lot of people responded with kind and heartwarming words. 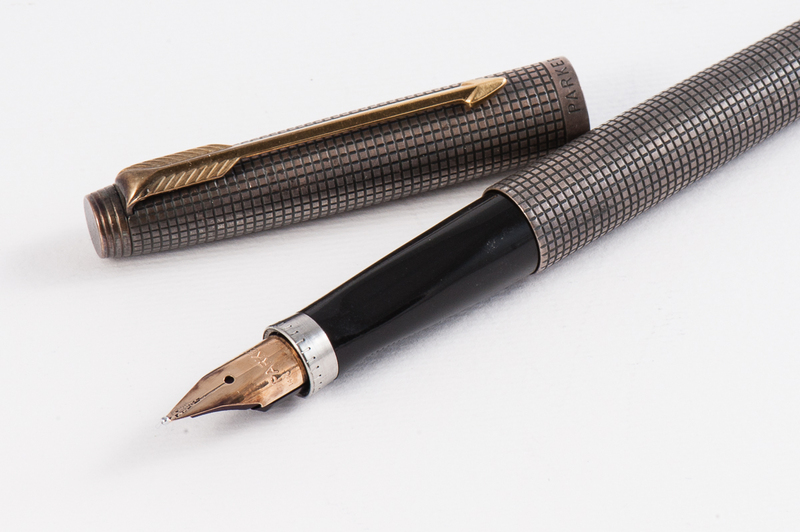 After doing some light research and examining the two pens , I found that the Sheaffer was probably made around 1938-1940 by looking at the imprint on the barrel and nib as well as the comb underside of the feed. The cap’s condition is almost pristine and the barrel is just a little darker. I think this darkening was caused by the rubber sac’s off-gassing thru the years but I could be wrong on that. As for the Parker 75, even though I could not find a date code on the barrel, it was made around 1966-1968 due to the “flat tassies”, and the zero engraving on the section. The patina developed on the sterling silver is just uniform and beautiful. 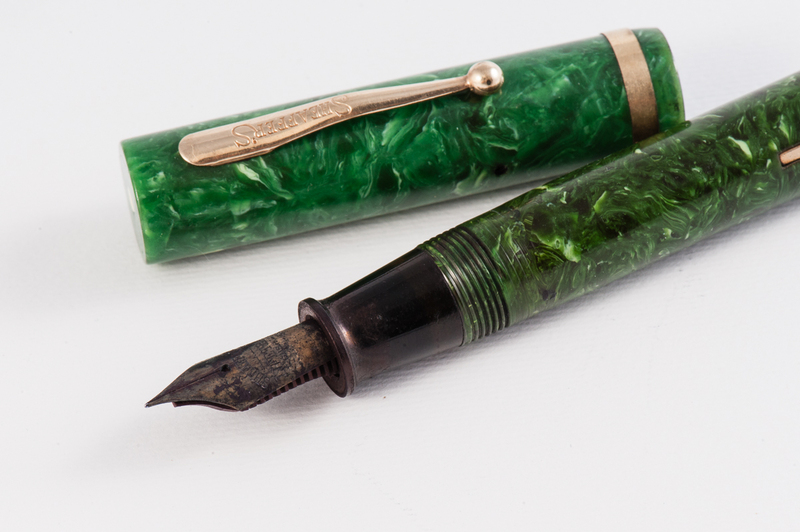 I would not dare polish the patina off the pen and keep its aged and used look. So the next day, I attended the Pen Posse meetup and brought the two pens. As I walked in, Farmboy aka Todd, immediately told me that he won’t restore the Sheaffer and effectively no other pen posse member will restore it as well. He said that since the pen was given to me, no one else should restore the pen but me. That definitely makes sense since it will be a more meaningful repair. 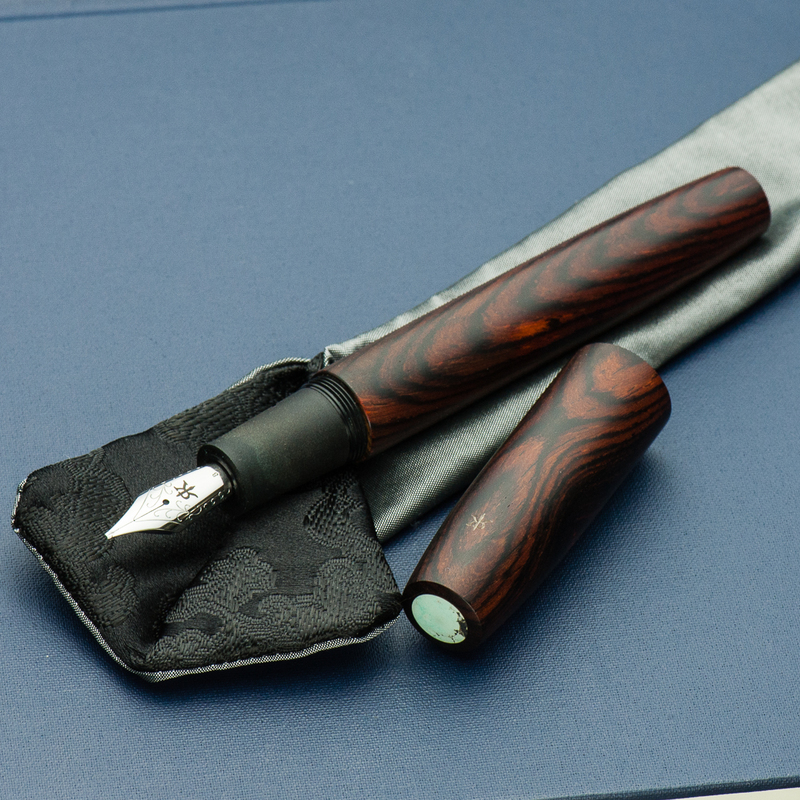 BUT… I was petrified because in my 5 years of being into fountain pens, I’ve never restored a pen before. I’ve never even seen one done nor even read a repair book. I was afraid that I might mess it up and break the section, or barrel, or whatever. Well, I accepted the challenge and told them I shall restore the Sheaffer next week under their supervision. I immediately searched “sheaffer pen resaccing” on YouTube. Learned a few things but I knew the hardest part was getting the section off the barrel without breaking it. So all I really did during the week was soak the section in water to clear out the dried ink as much as possible. Fast forward a whole week and the day has come for me to face my fears. 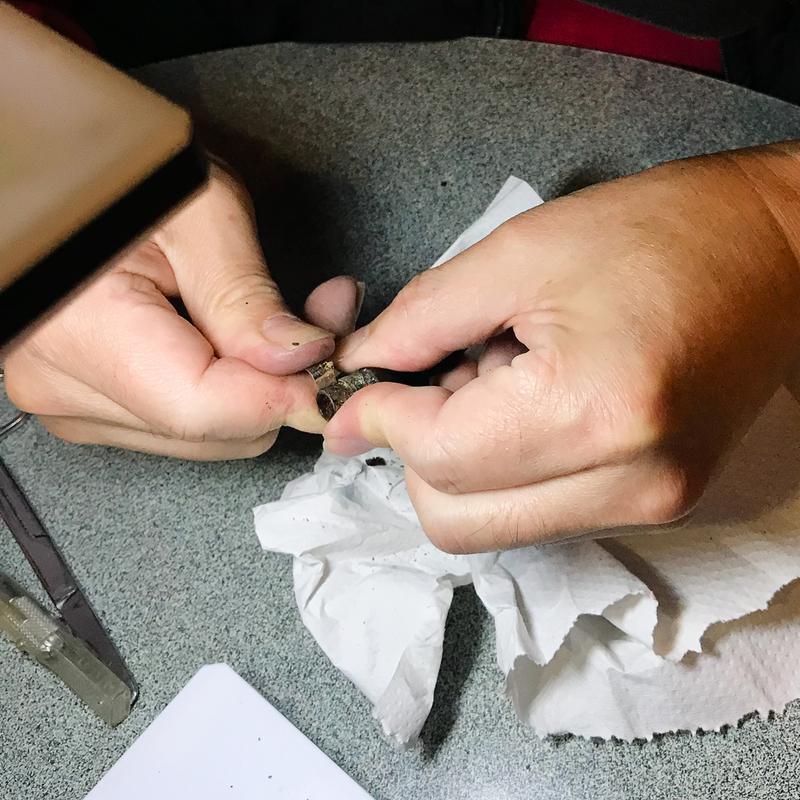 Gary, a pen posse member, guided me along the whole process and he actually brought most of his pen restoration tools. I first had to heat the section so that I can gently pull it off the barrel. This probably took the longest time and it’s the one part of the process that requires patience. Basically, enough heat will expand the barrel so you can slowly take out the section. Emphasis on “slowly” because you risk breaking the barrel due to excessive force if you rush it. While heating the section, rotating ensures uniform heating of the barrel. Like a rotisserie! 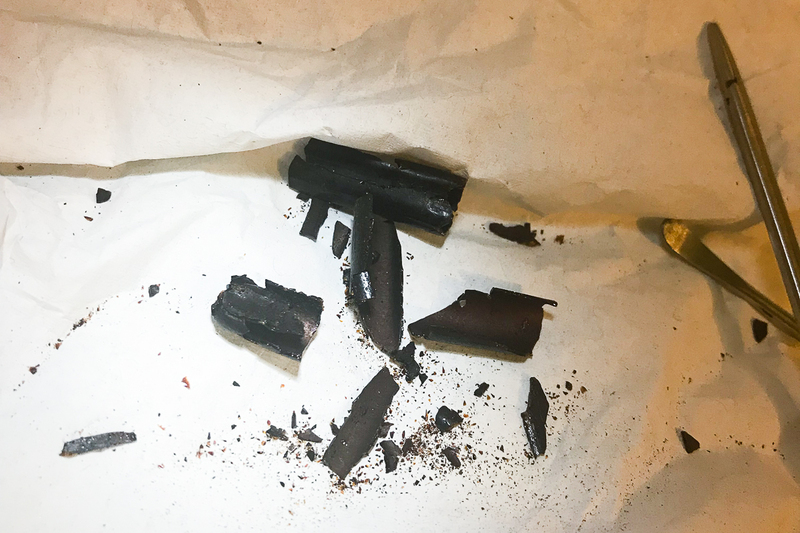 After some coaxing, the section finally came off and I had to clean out the old dried up sac from the section, and the barrel. There were bits of the sac that was onto the inside of the barrel that needed some encouragement with different scraping tools but it eventually cleaned off. The photo on the left below still shows the shellacked part of the sac still on the section and the photo on the right shows the cleaning of the section. After cleaning both section and barrel, a new sac was measured and cut to fit. I’ve learned from Gary that it’s easier to have different sizes of rubber sacs and trial fit them into the barrel rather than looking for a specific size for each pen. Most of the process here was not documented though, so my apologies. After cutting the sac, I applied shellac on the section and slowly placed the sac. I applied more shellac over the seam to ensure there were no gaps and let it dry. After about 30 minutes, I applied some pure talc on the sac for lubrication, and inserted the section in the pen barrel with a snug fit. Et voila! The Sheaffer has been restored! I waited 24 hours before inking it up though. 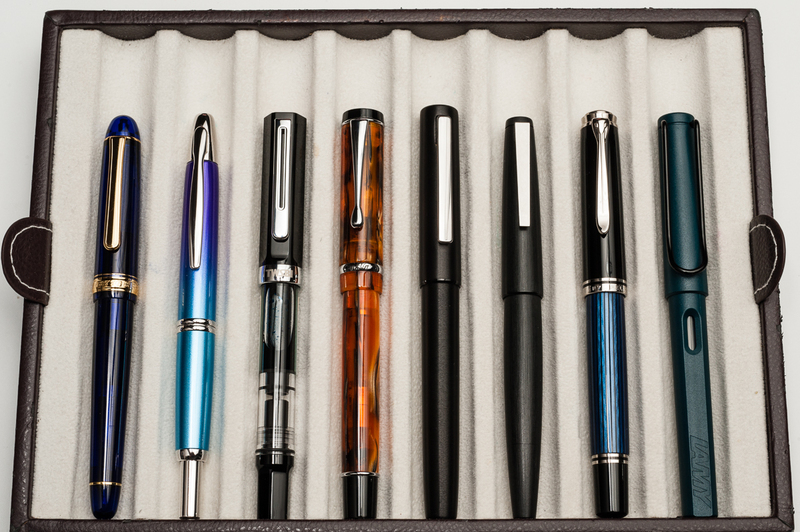 The Parker 75 was a straight-forward restoration in which I’ve done before. 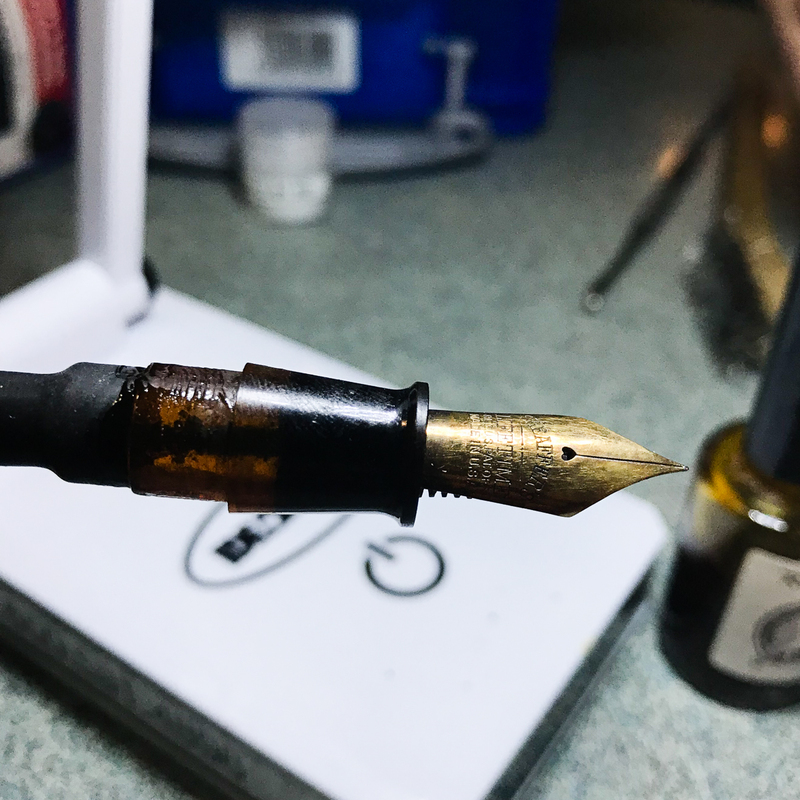 I just soaked the section and nib overnight in water to loosen up the dried up ink. 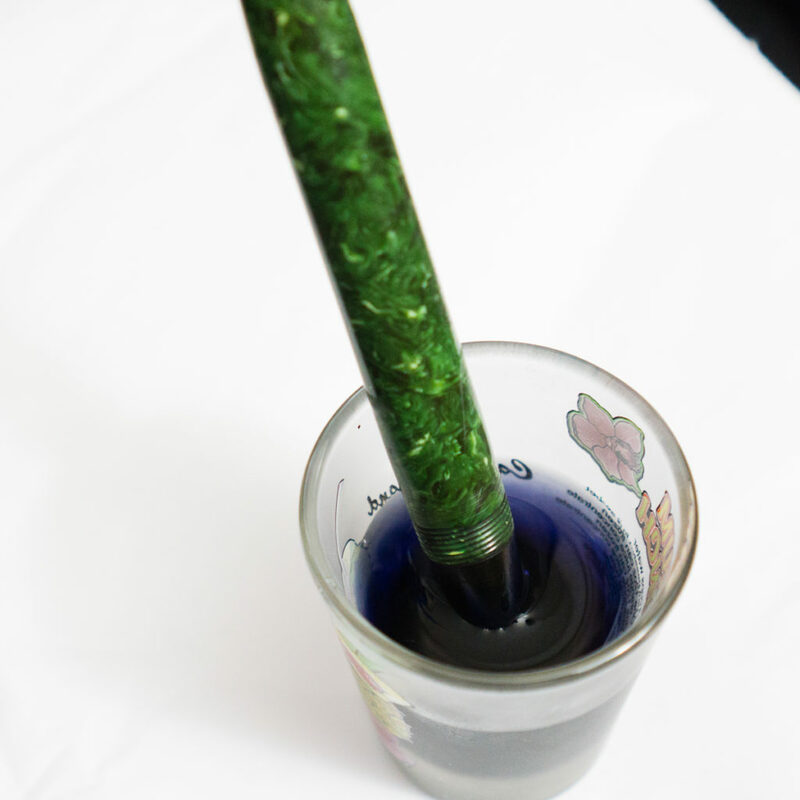 Afterwards, I took the nib out from section and flushed water to continue clearing out the ink. 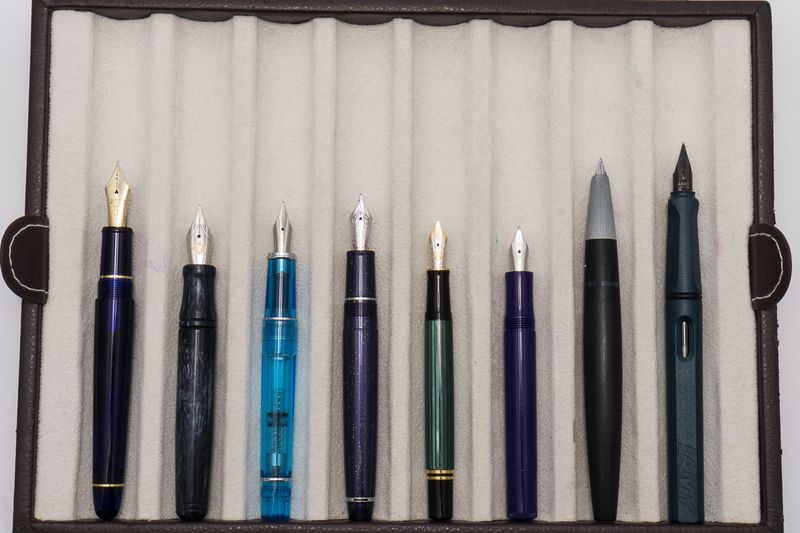 The section of a Parker 75 seems to hold A LOT of ink but with just a little patience it eventually cleared out. The converter’s rubber sac had holes and needed to be replaced so my friend Nik P. graciously swapped a “newer” converter for the old one. The sacs on these vintage Parker converters are replaceable. 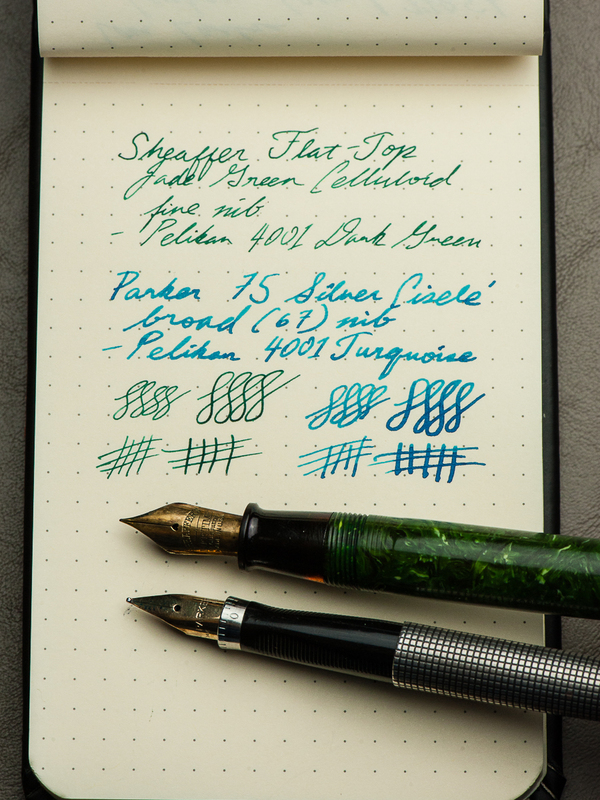 And that’s about it for the Parker 75! Well, thank you for letting me share my proud pen story. 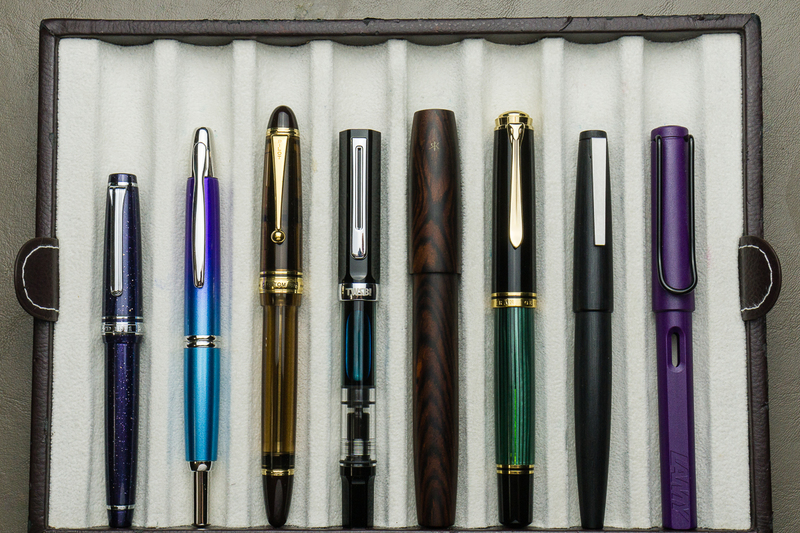 It feels great when you restore your own pens but restoring gifted pens with a history definitely holds more meaning and gives the pen a more personal (to me) story. Thanks to Farmboy and the Pen Posse for the encouragement, Nik for the help, and special thanks to Gary for the guidance from start to finish! I’ve been using these two pens since December and love them! I haven’t seen Dr. M, Jr. since I restored the pens but when I do, it will certainly be a proud moment. Take care and keep on writing friends! Katherine: We’d agreed on a prompt of top five acquisitions, I think. But I’m rebelling. 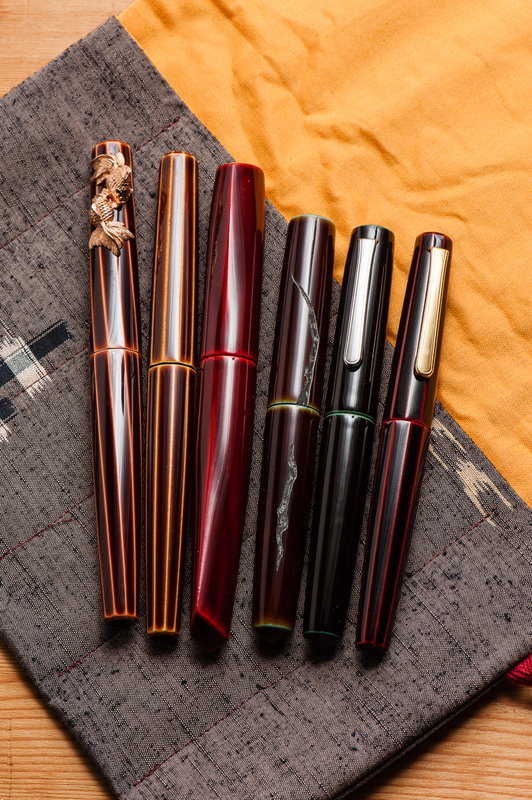 2017 was the year of the Nakaya for me — I went from zero to six, so let’s talk about that. To start, some insight into my head — I place a lot of value in things that aren’t mass produced and are made by masters of a craft (see also my love for fine dining). Second, I’m willing to pay much more for things I can’t make/do myself (see my love for absurd molecular gastronomy, much less for anything I could conceivably cook at home). Third, I’m pretty busy with work, but I’m obsessive and I tend to be willing to try to do a lot of things (see the hours I’ve spent in the kitchen making my own sous vide egg foams). 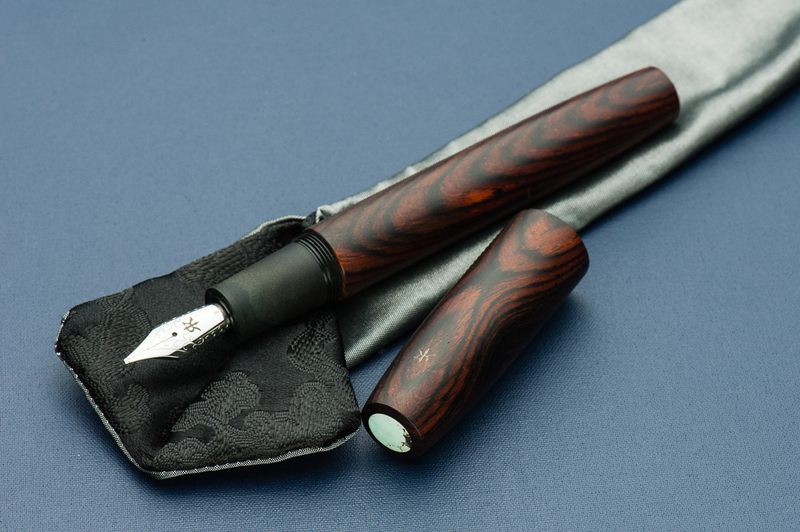 Given those things, and my love of pens, I think Nakaya are a natural fit for me. 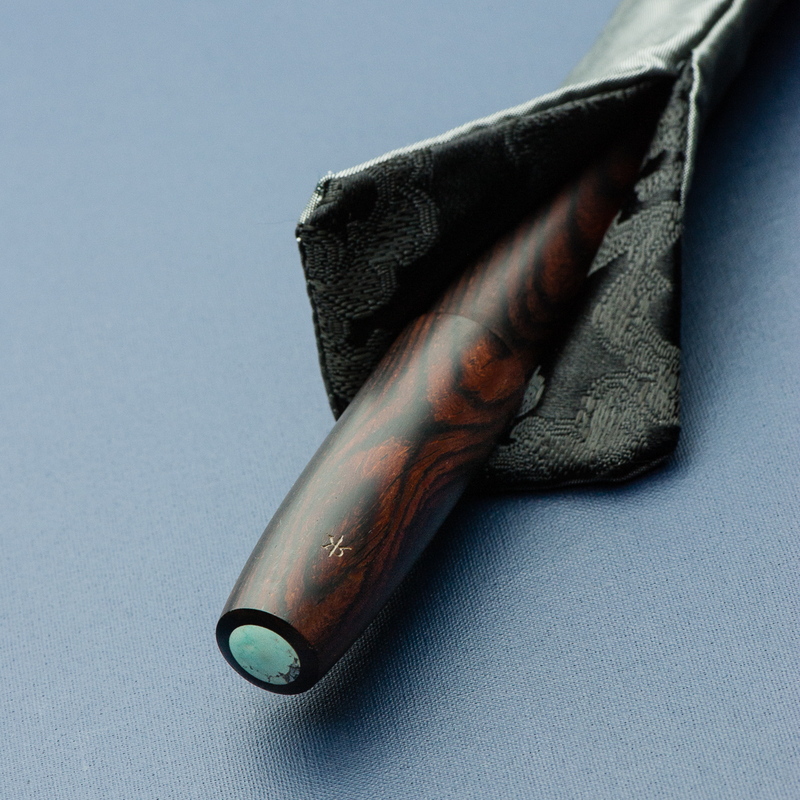 I won’t lie, I’ve dabbled with my own finishes and urushi lacquer, and it’s still something I want to learn more about. 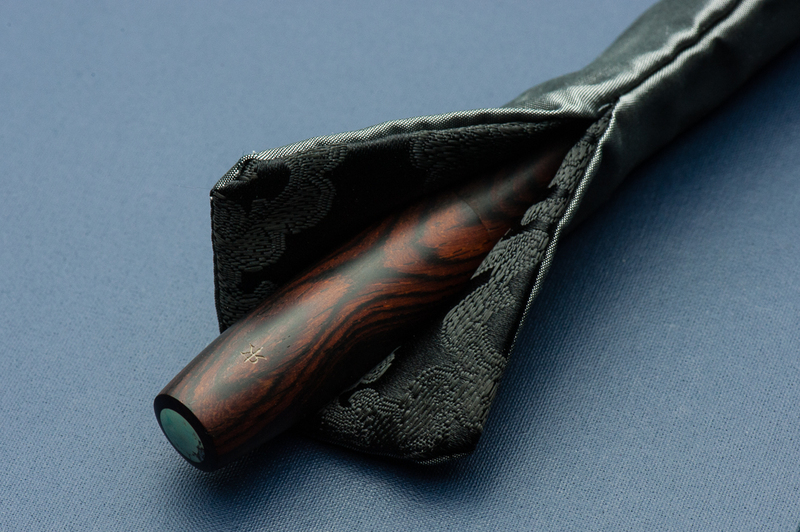 Until then, Nakaya is a delightful mix of beautiful forms*, masterful craftsmanship and daily indulgence, all bundled together in a utilitarian writing instrument. 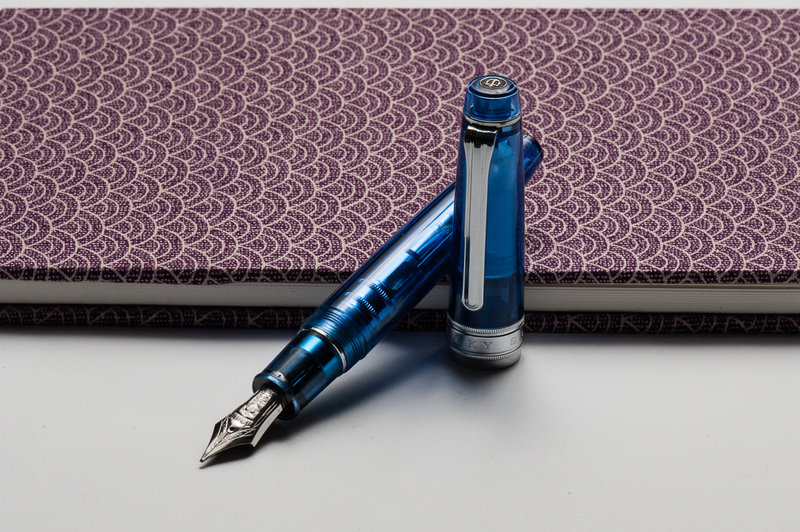 And, because the adventure doesn’t have to end — Nakaya I still want: another Mini Decapod (vaguely considering letting one go? let me know! 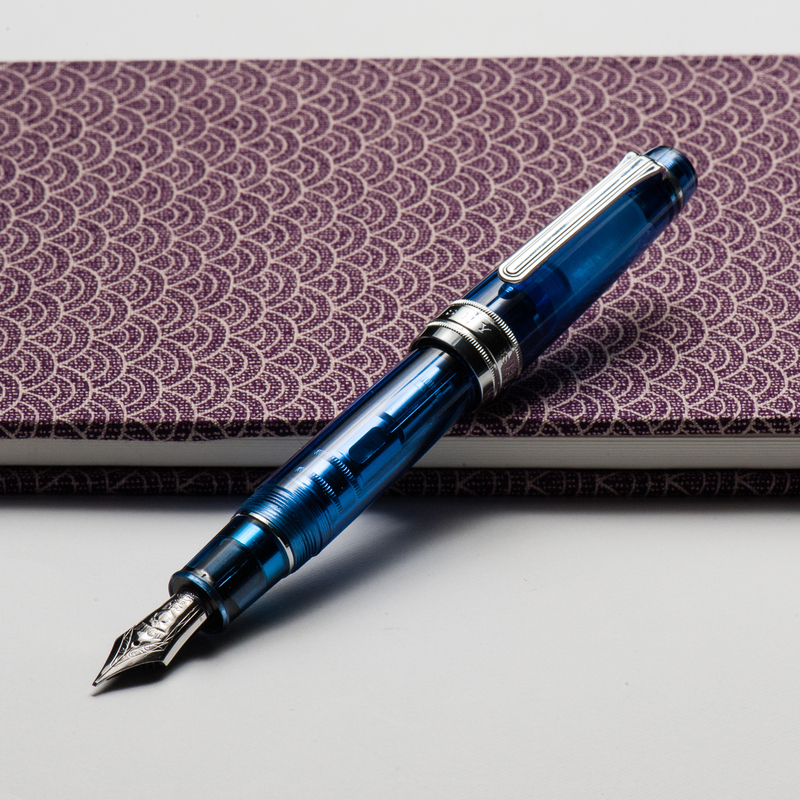 ), a pen in ishime suzu (black and silver) and a Decapod Twist in midori-tamenuri (a mini deca in midori-tamenuri would be amazing… but my odds are so low). * I have a soft spot for pens with gently conical ends, and a (excuse my language) massive hard on for faceted pens. Pam: 2017 was a year of acquiring and within that process refining what my writing preferences are. It has been the most adventurous and sentimental year yet for me with 2 pen shows and great pen friends. The five pens I chose is a reflection of my experiences in 2017 as well as the direction that my pen use and “collection” is headed in 2018. No surprise to the Sailor ProGear Blue Lagoon. It’s by far my favorite Sailor (don’t tell the Progear Slims) for it’s color combination and performance. It has solidified my love for the Sailor Progear and Progear Slims. With all the special limited editions that Sailor keeps coming out with, like the Purple Cosmos, all I can say is that Sailor is going to be keeping my wallet pretty slim. 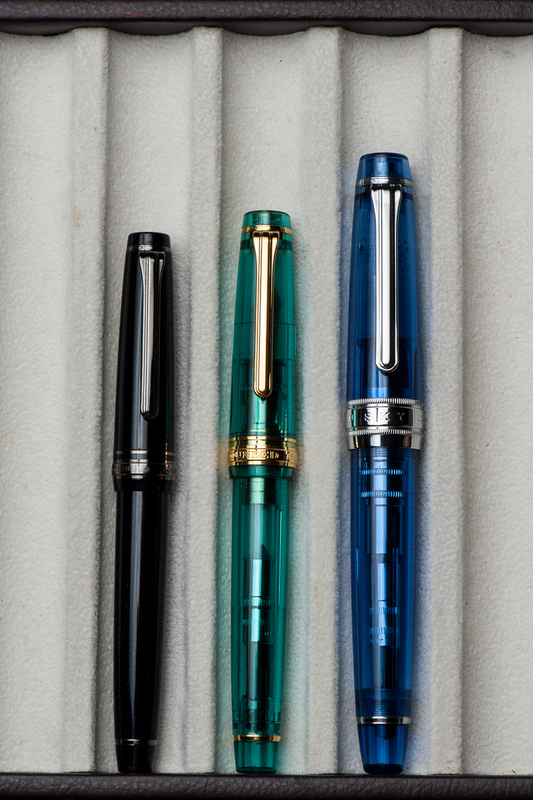 The Pelikan m800 Ocean Swirl was a very pleasant surprise by my pen-spirators (Katherine, Franz and Roz) that included my non-fountain-pen-bestie getting me a very extravagant gift for my 31st birthday. I am a very lucky girl. After having an m800 of my own I am wondering why I was so hesitant to try the m800 size before this year. It’s a great size for pretty much any hand size and so well balanced! I am actually surprised by the remaining 3 pens on my list given that I never thought of myself as a vintage girl. 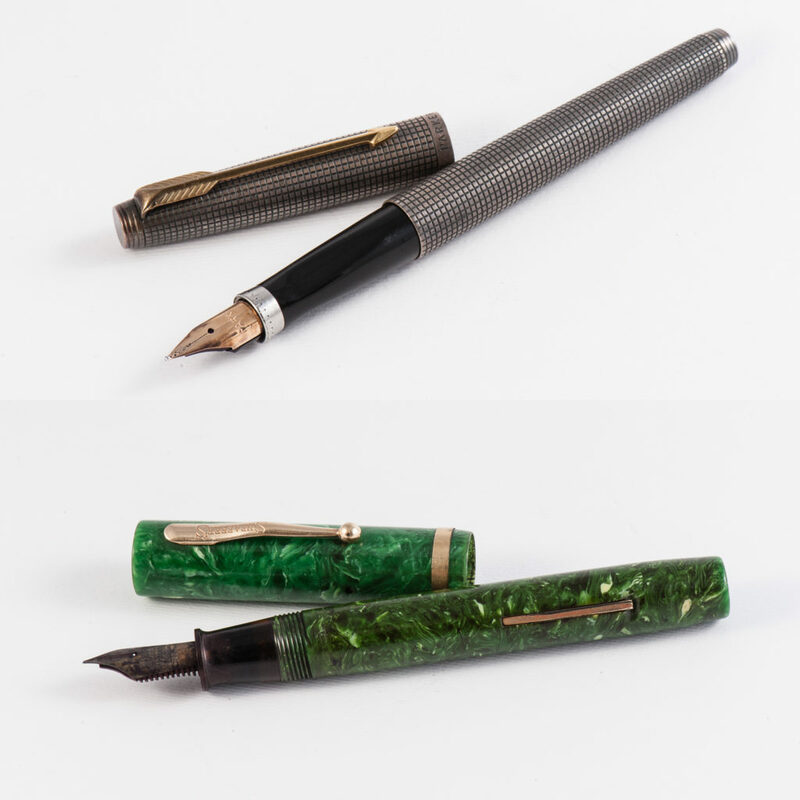 However, vintage pens have an affinity for small hands as the form factor of the pens are naturally slim and compact. It’s a great match. I am enamored by “short long” pens which are pocket pens that cap into a “normal” size pen. 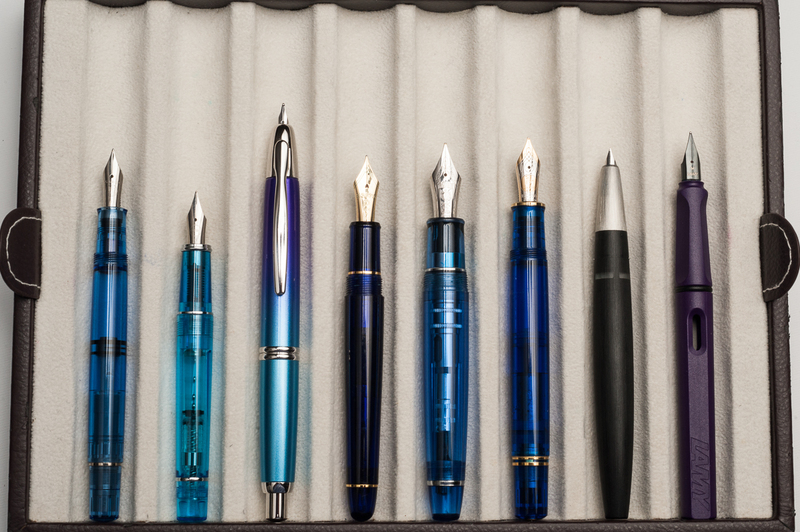 There aren’t that many short long pens with Japanese fine nibs on the modern market; only the Pilot Elite comes to mind. This “gap” is actually well fulfilled by the vintage pens. 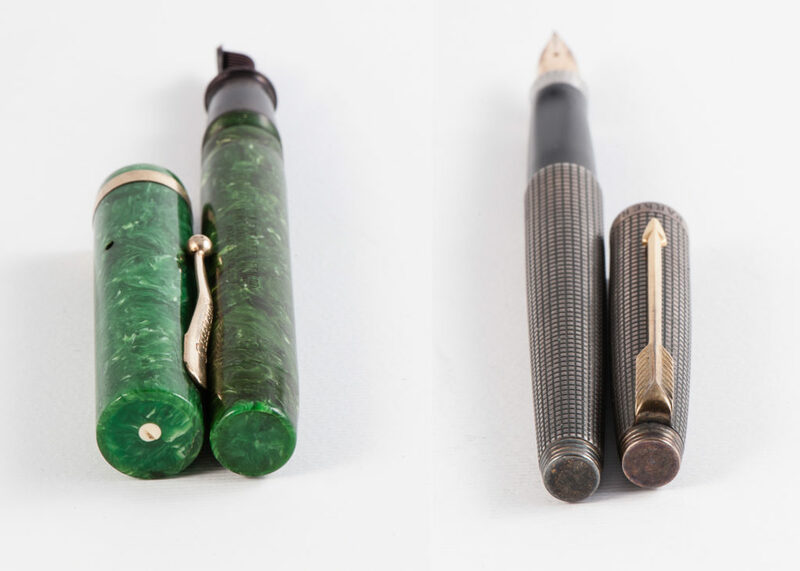 All three of the Japanese firms (Sailor, Pilot and Platinum) made short-longs/pocket pens back in the day, going as far as to mimic each other’s designs. 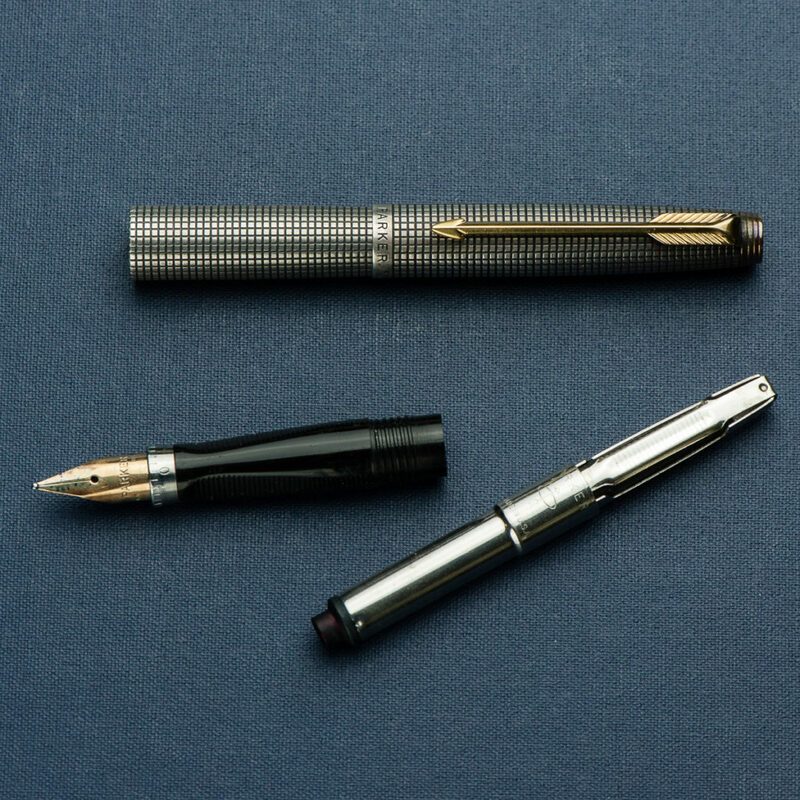 The black stripe Myu by Pilot and this unique Platinum black and silver pen really opened my eyes to treasures of the vintage world. 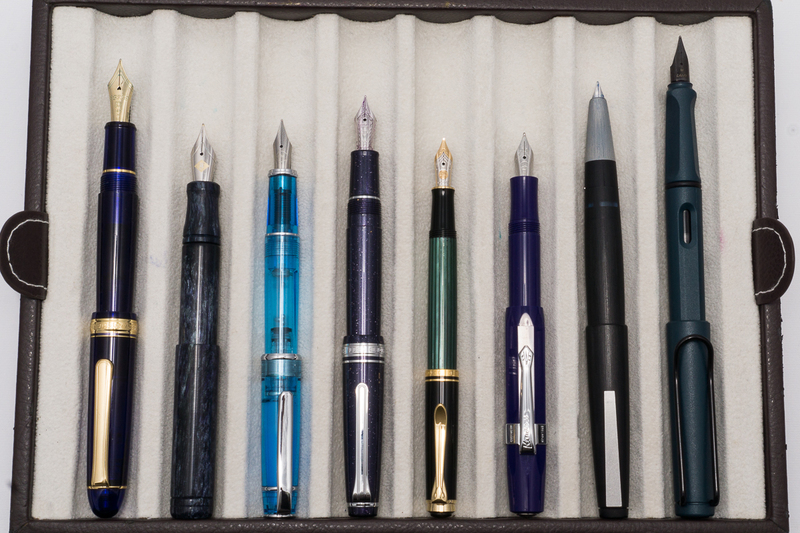 What I love about the vintage pen world is that everyone has a “niche” in terms of what they get excited about and what they collect. With the influence of a fellow pen friend, Andrew, I may have slipped down this rabbit hole and I can’t wait to see where it will lead in 2018. Lastly but certainly the greatest of surprises for me is the Parker 51. I don’t typically talk about Parkers and why haven’t I? The nib on this Parker is FANTASTIC, the smooth body and width of the pen is super comfortable for my handwriting, and it’s vintage?! This pen broke me of the idea that vintage pens were “stuffy.” How do you revive a “stuffy” pen? Put a bright ink in it. Inspired by Franz’s post of “black pens want pink ink” on Instagram and following that advice, I found great joy and a wonderful writing experience with this pen. All I can say is that 2017 was eye-opening. I think 2018 is going to be a year of continual refinement and potentially slowing down the rate of acquiring. 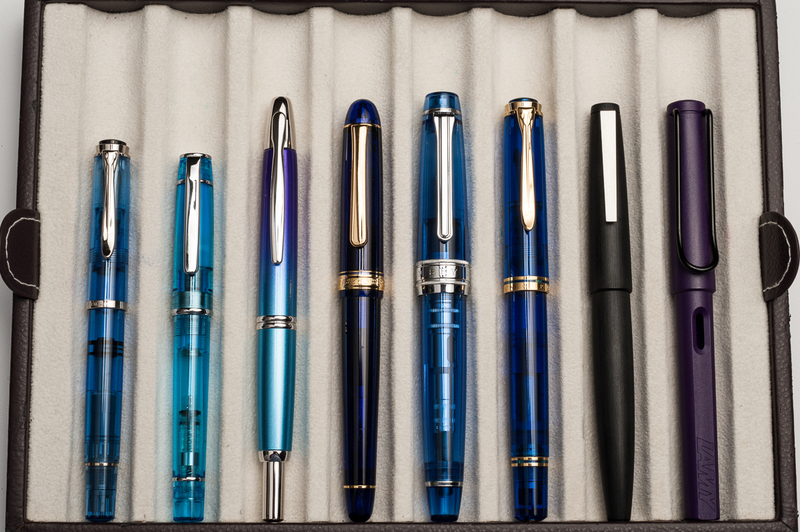 Some people have a word of the year and if I had to choose one for my pen use/collection, it would be “intentional” and being more cognizant of my own pen habits and use case (at least until the next Sailor Progear limited edition or vintage pocket pen comes my way). Franz: Wow! 2017 is almost over and HELLO 2018! I’ve enjoyed this hobby very much especially because of all the great people I meet along the way. Lots of highlights and events that passed this year. Here’s just a few I’d like to share. 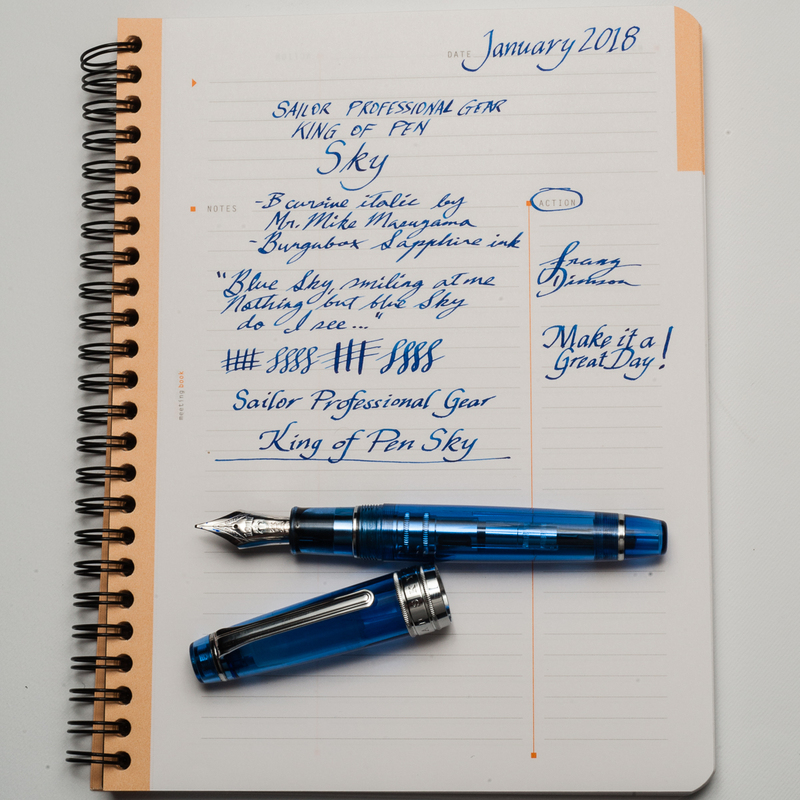 In February, I went to the LA Pen Show and it was all about fun, and food! I mean, pens are great and all but you’ve gotta enjoy some great food too. That restaurant in Korea town with the awesome iced tea was a highlight. Tin Roof Bistro dinner was a success too. Got to spend some time with my sister as well. 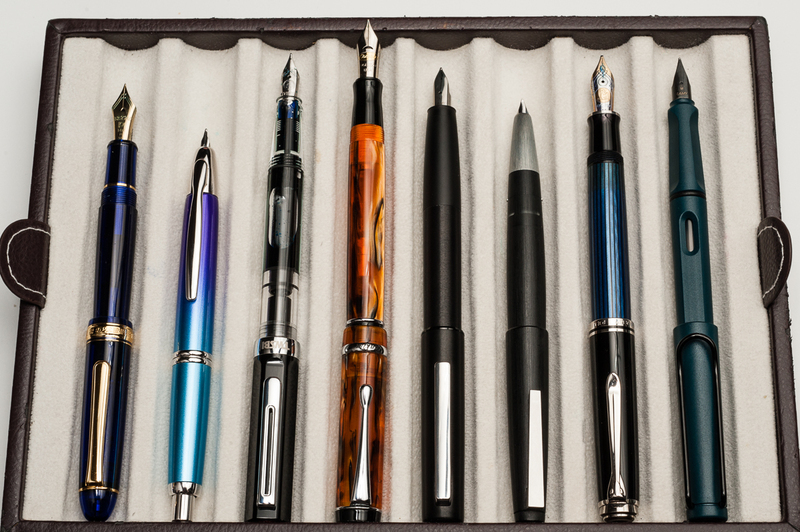 In April, went to the Atlanta Pen Show for the very first time. 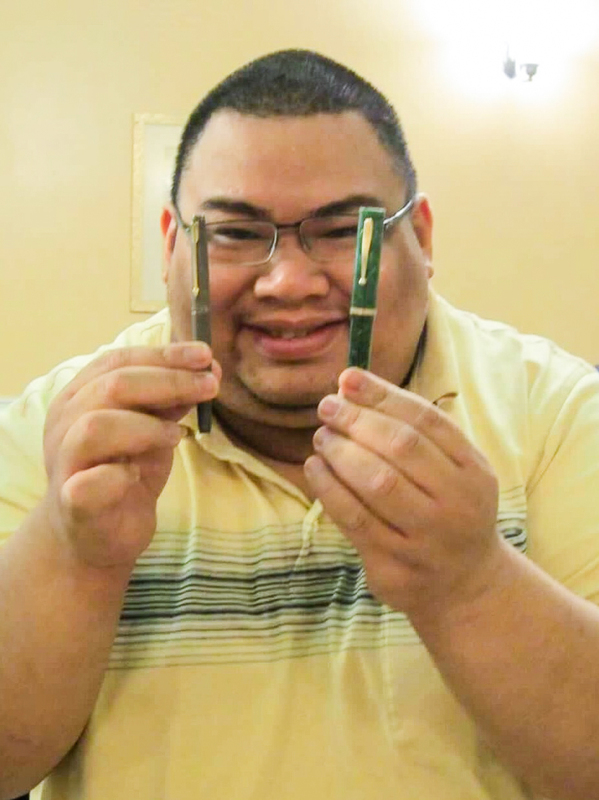 I got to meet up with a family friend who has been into fountain pens long before myself and showed him around for his first pen show. Got to see the live Pen Addict podcast. Late night food at the Waffle House… yum. 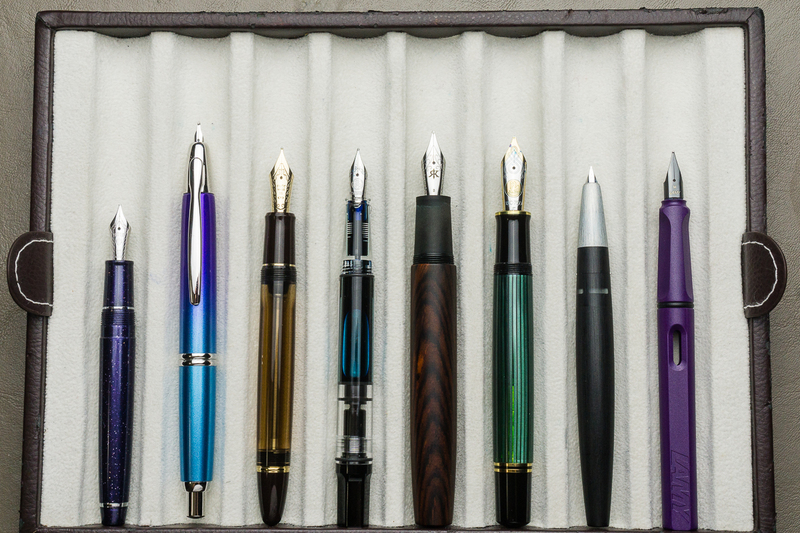 In August, got to attend the SF Pen Show and once again assist with their classes and seminars. That show is just phenomenal. Got to host the Pay-It-Forward table with my Mom and a few other Pen Posse friends. 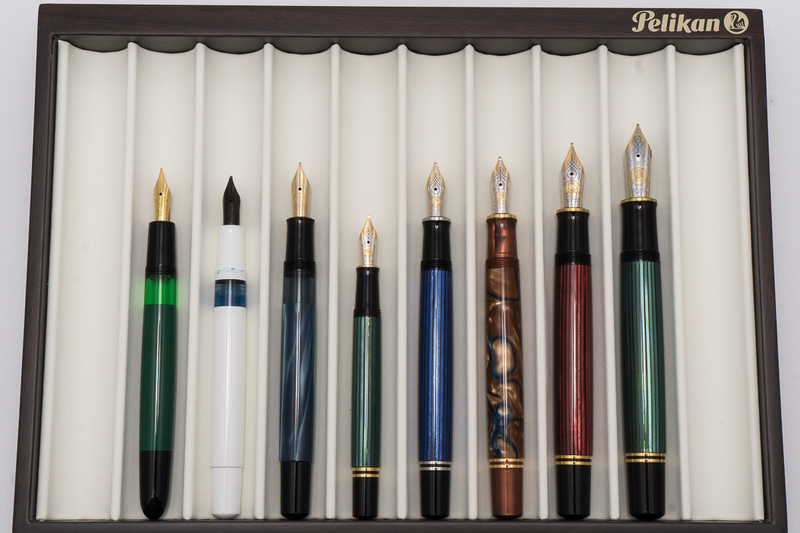 In September, Pelikan Hubs was held, and it was great listening to Mr. Rick Propas provide a history if my favorite pen brand. All year round, Pen Posse meetups happen with the Food sub-committee meetups as well. The pen posse is a great group of people and happy to be part of it! Also, I’m very thankful that this Hand Over That Pen blog continues to be. My friendship with Katherine and Pam is just… extraordinary. Here’s my top 5 pens for 2017 in accordance to being inked up and mostly used during the year. Classic Pens LB5, Tairiku (continent) in Amethyst Mauve, Broad nib. This pen was part of my top 5 last year as well. It just shows that I love writing with this pen. The 21-karat Sailor King of Pen nib is very nice especially on Tomoe River paper. The length of the pen is perfect for my hand. 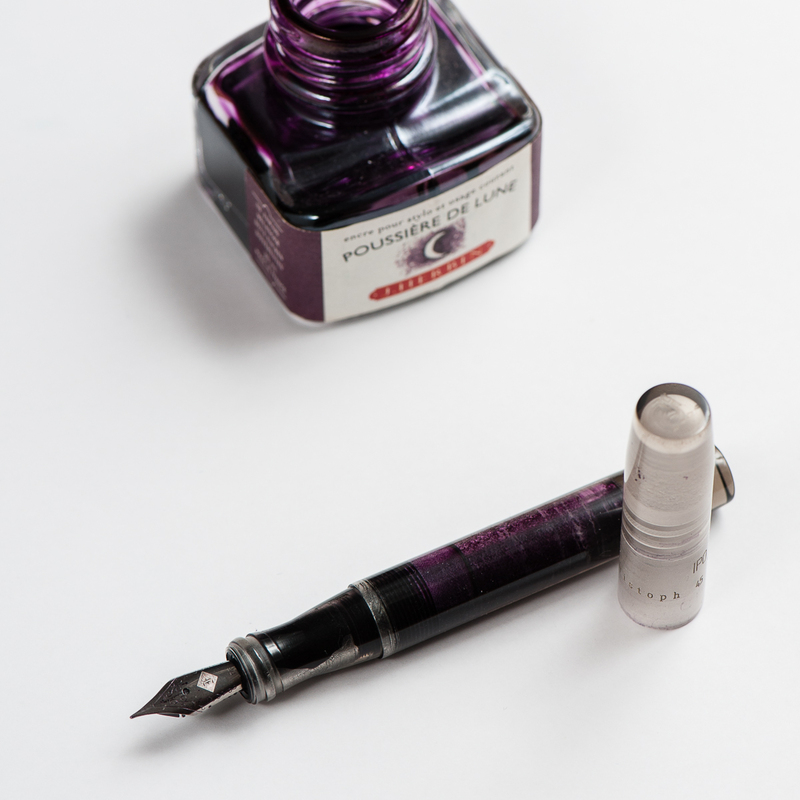 It still has Pelikan Edelstein Amethyst ink in it. 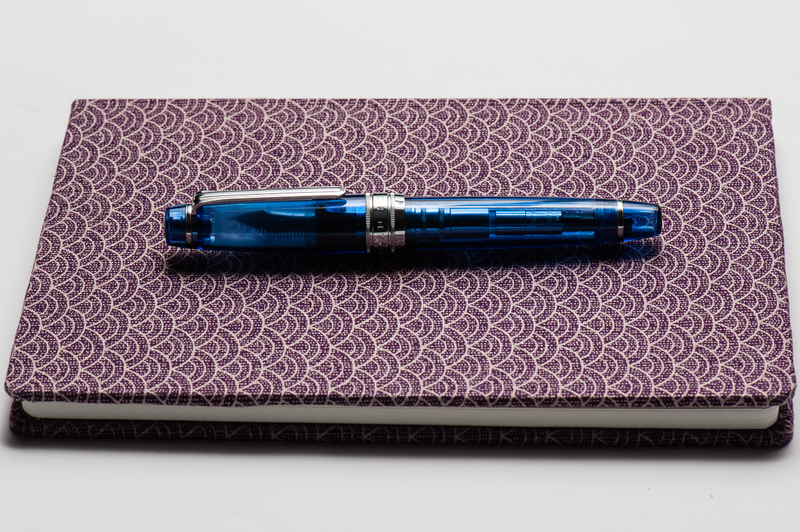 Nakaya Neo Standard, Kikyo, Medium nib. This is a new pen for me in 2017 that I got from the secondary market. Just like the LB5, the length of the pen is perfect for me. The dark blue is understated and it’s a pen I’ve been using a lot at work. The ruthenium clip and nib made it an even more subtle and beautiful pen for me. 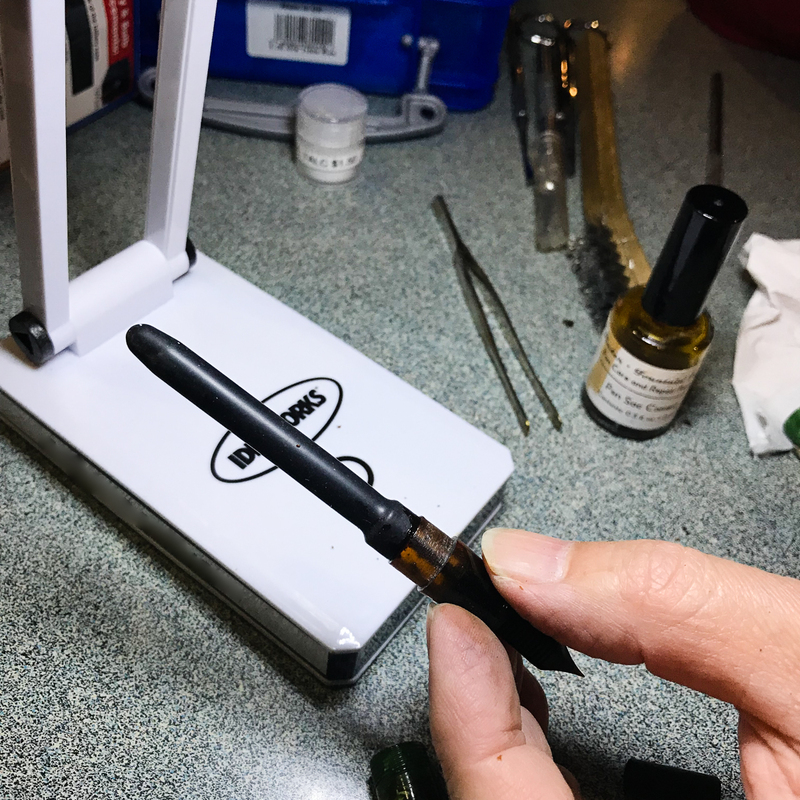 Thanks to J. of Classic Fountain Pens! The medium nib is perfect for either the cheap copier paper or Tomoe River paper that I use a lot. 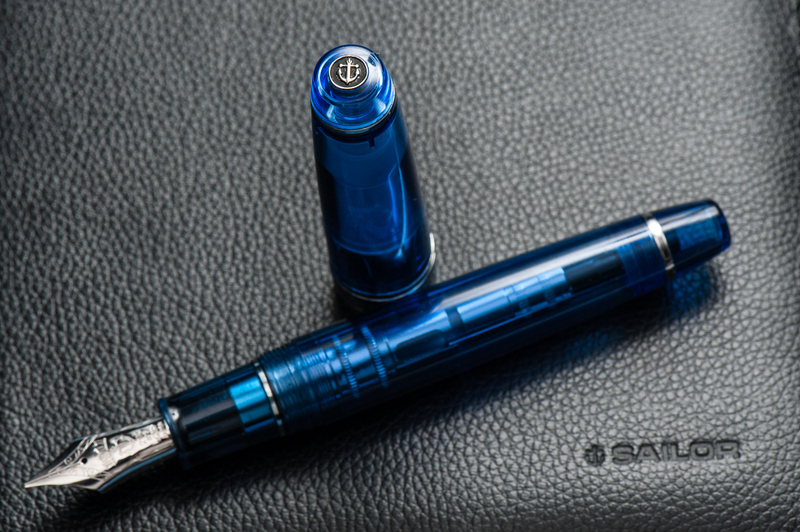 The Neo Standard is paired with Pilot Blue Black ink as it matches the dark blue finish. 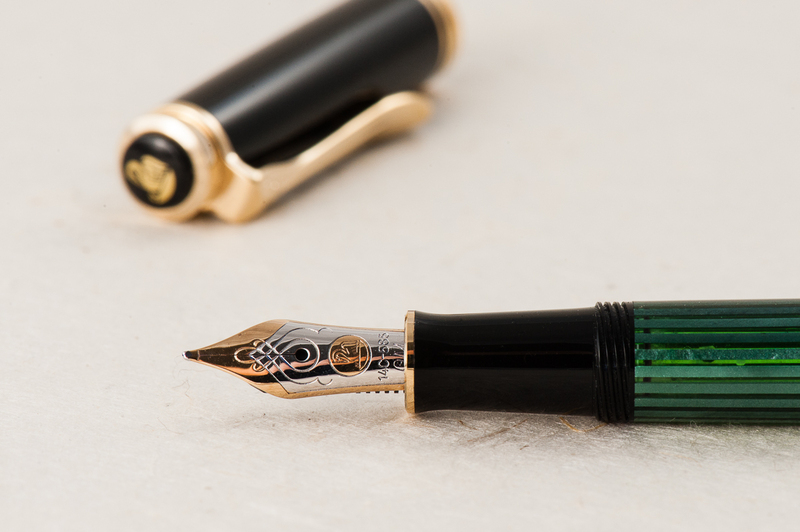 Pelikan M1000, Green Striated, Fine cursive italic nib. I’ve had this pen since 2016 but I only had the nib turned into a cursive italic by Mr. Dan Smith at the 2017 LA Pen Show. 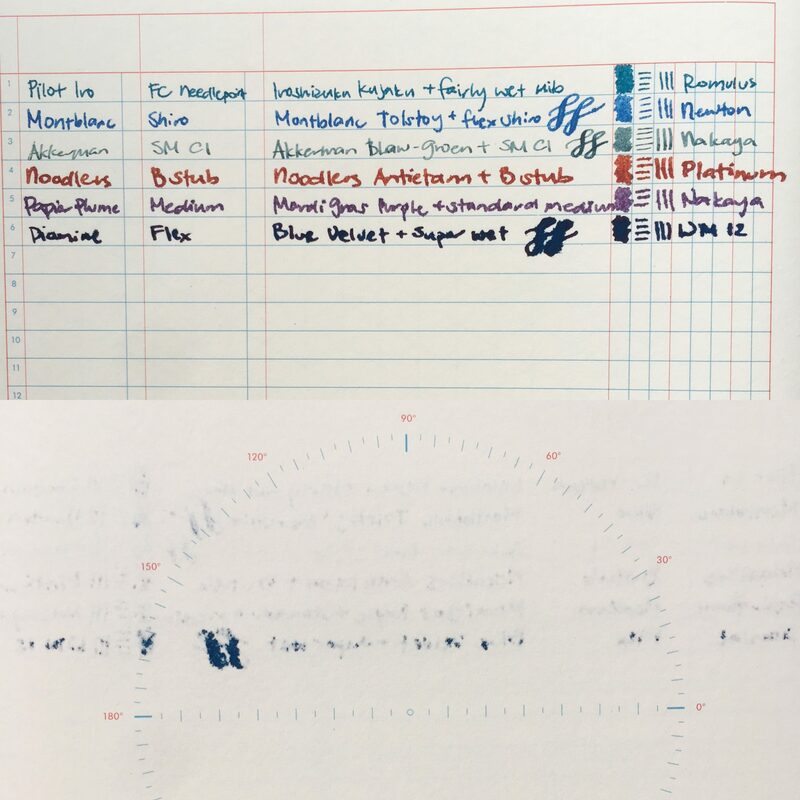 Since then, the M1000 has not been un-inked and I’ve used it almost every day. The nib is springy and wet just like it should. 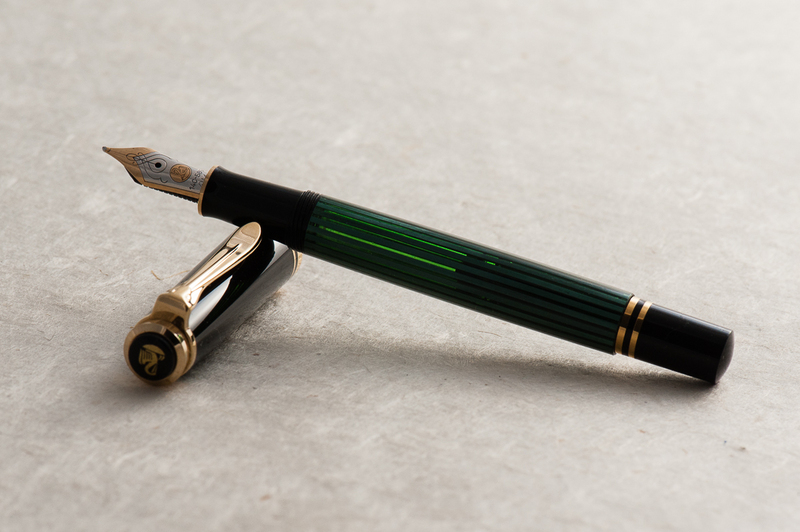 I am a self-confessed Pelikan Addict and this flagship pen is perfect! 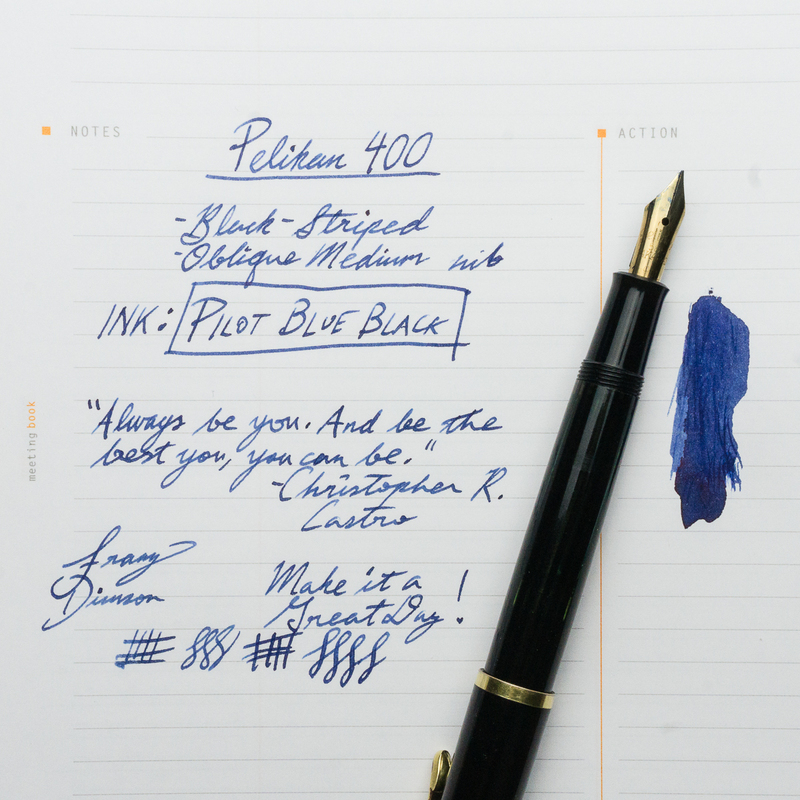 It has been paired with my top favorite ink, Pelikan 4001 Turquoise. Parker Vacumatic Maxima, Golden Brown, Medium nib. 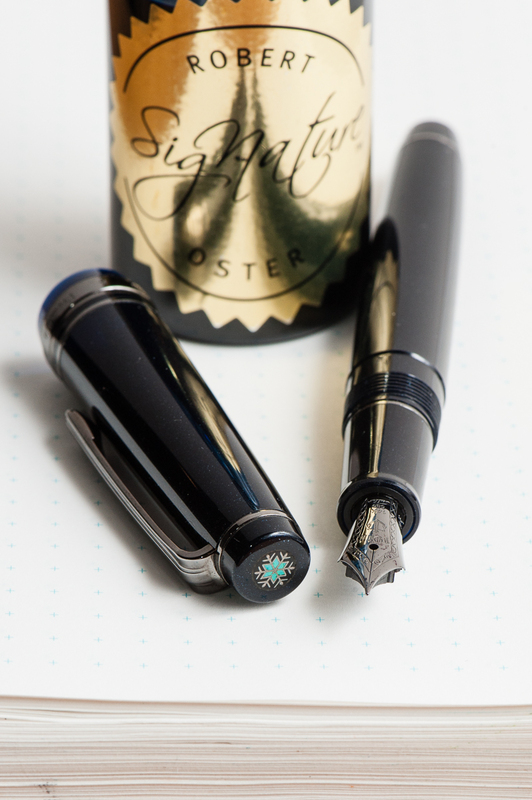 I have such a love for the Parker Vacumatic pens and I always have at least one Vacumatic inked up. 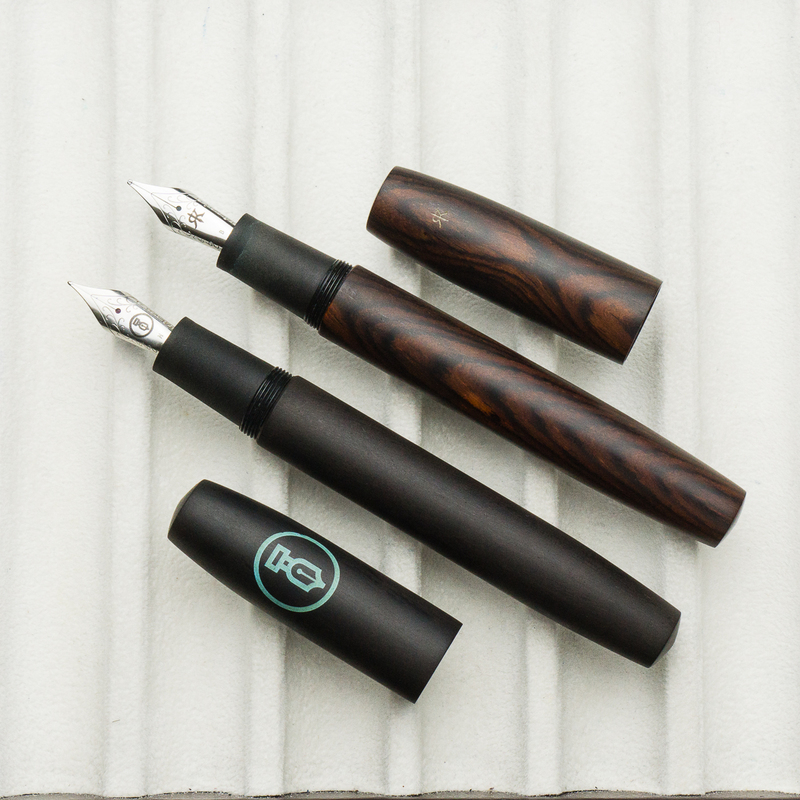 The stacked coin design is so beautiful with these Vacumatic pens. 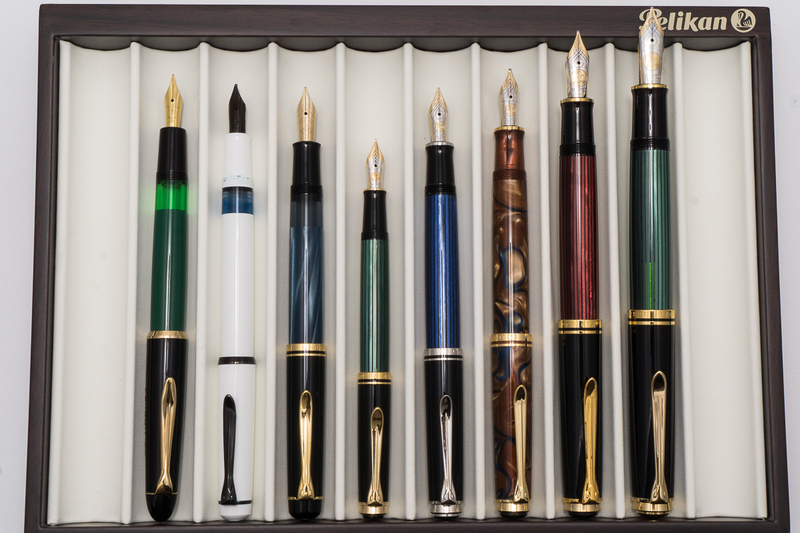 I was looking for a Vacumatic Maxima during the 2017 SF Pen Show but couldn’t find one with a great price, and nib preference. 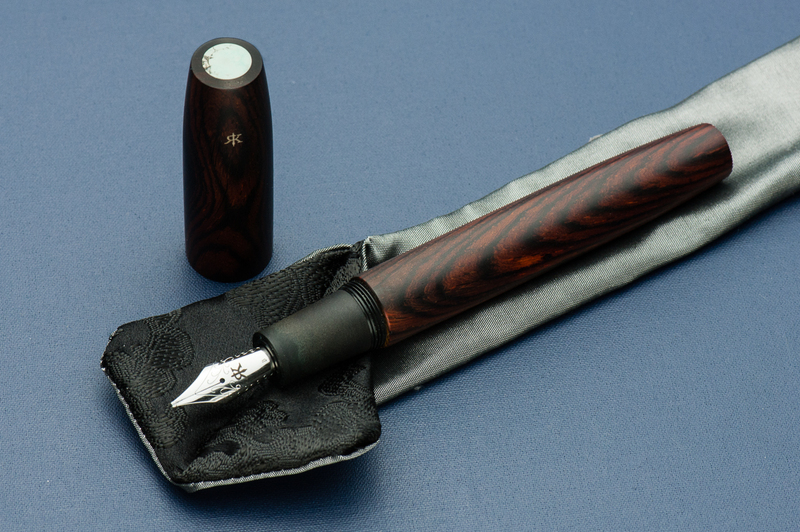 But at a Pen Posse right after the show, I was presented this pen for a great price and it has a medium flexy nib. It also sports a Star clip which was a transitional clip in 1939 before Parker chose the Blue Diamond clip. 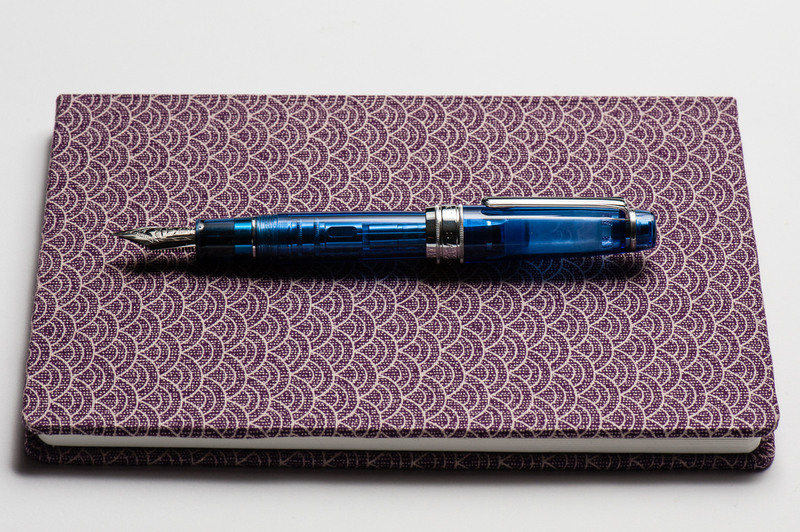 The Maxima is one of the “bigger” pens in its time and I find it comfortable to write with even unposted. Posted, the length makes it perfect, but I avoid doing so because the cap lip might crack. I love using this at work and every time I use it, it places a smile on my face. It has been inked up with Akkerman 05 Shocking Blue ever since. Wahl-Eversharp Personal Point Gold Seal, Lazulitic Blue, Medium nib. 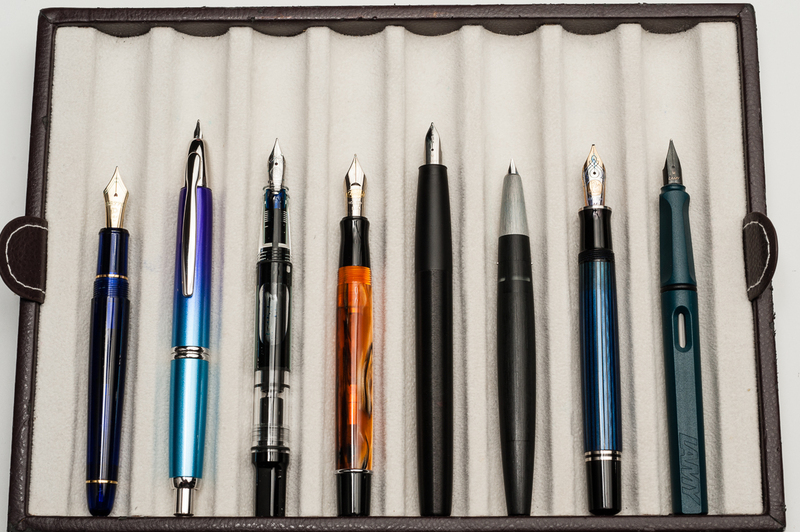 Ok, Parker pens seems to always get my attention but Wahl-Eversharp pens do so occasionally as well. I’ve been on the lookout for larger sized W-E pens but haven’t really seen much that is within the budget. I saw this W-E pen in person in early 2016 and did not act on it and thought that it was sold. Fast forward to July 2017, I found this pen again and I immediately sold a pen to buy it. That’s how much I wanted it. No regrets at all and has been in use since bought! 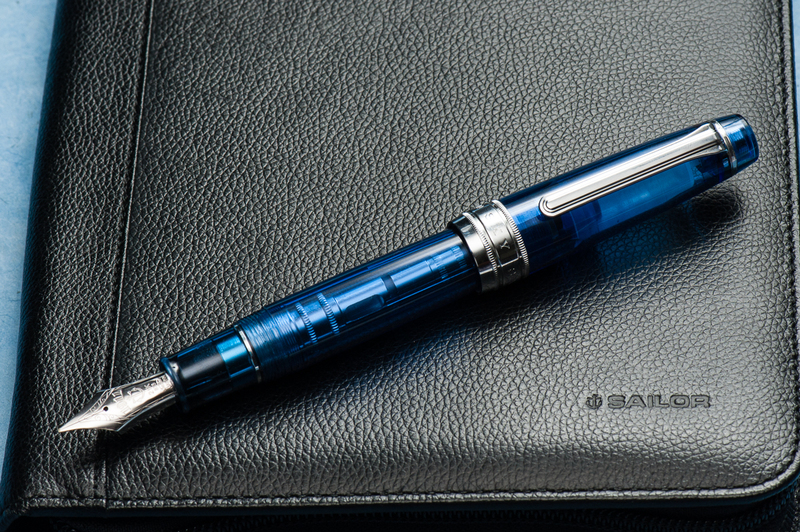 The blue material of this Personal Point is just stunning especially for a blue pen lover like yours truly. 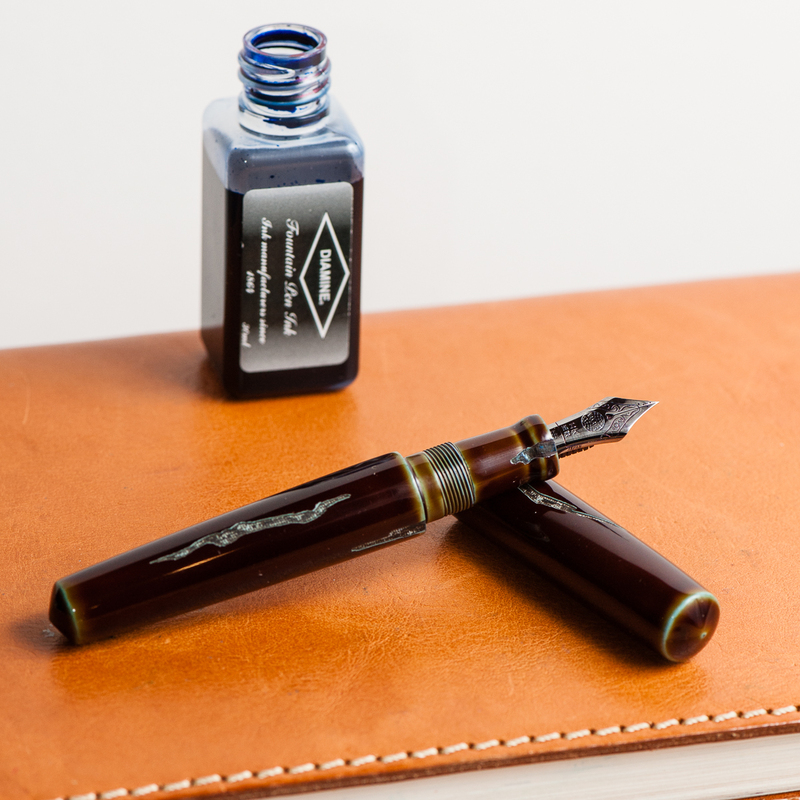 Just like the Vacumatic Maxima, it has a flexy medium nib which writes oh so smoothly. 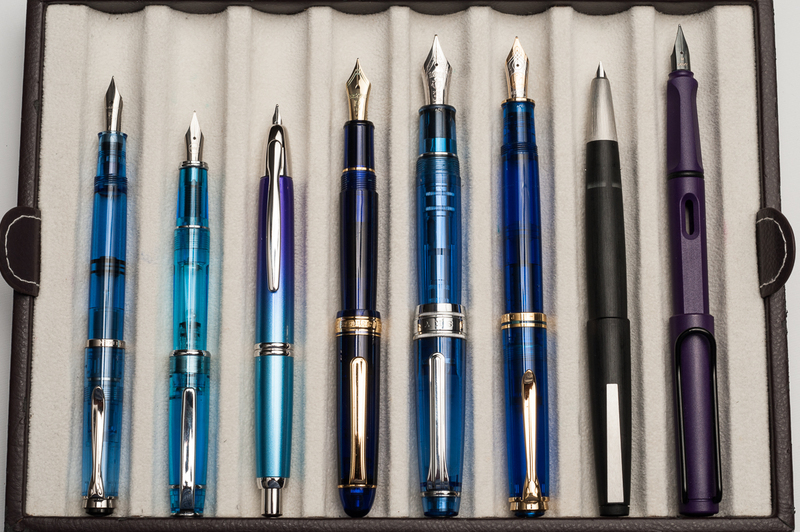 Currently inked with Pilot Blue Black. Happy New Year to you all and may 2018 bring you more blessings and happiness! Our lefty guest reviewer is joining us again! 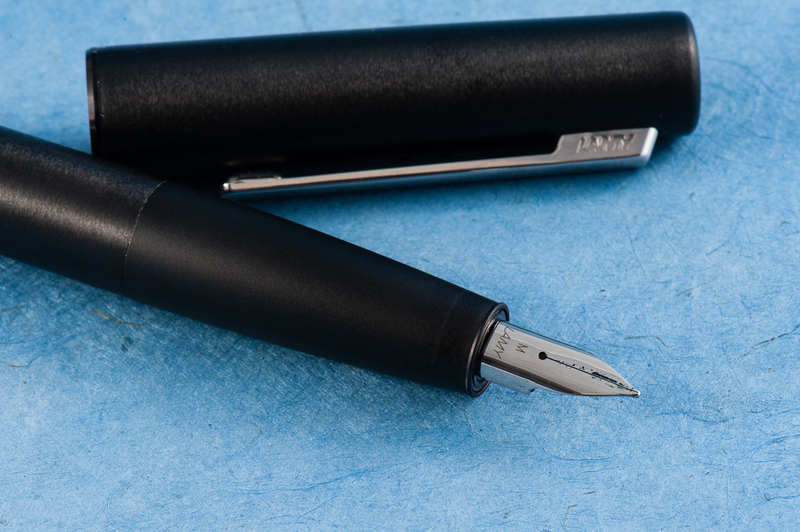 Roz helped us provide thoughts on this new Lamy Aion fountain pen. Thanks very much Roz! Pam: Why hello there Mr. Minimalist design. 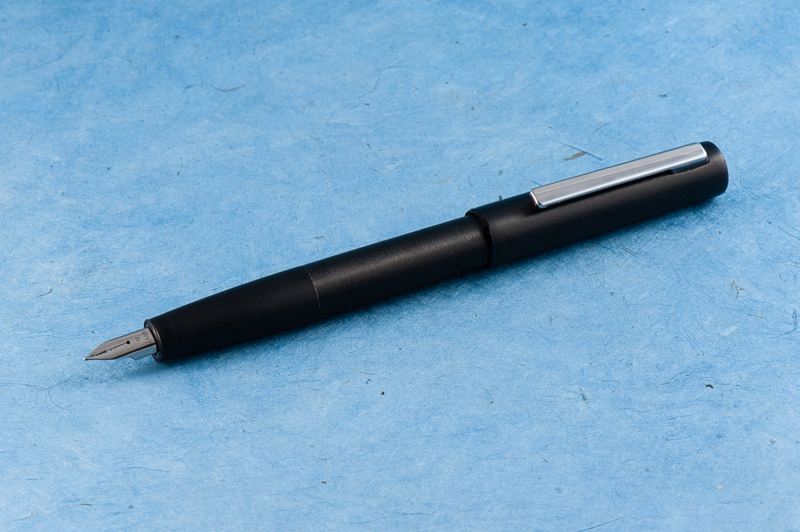 It’s unsurprisingly a Lamy pen, with shape and feel that is similar to the Lamy 2000 and the Lamy Studio. In my mind’s eye, if the Lamy 2000 was the James Bond of the Lamy line with it’s sleek and beautiful shape, the Aion is the buffer, larger and less graceful cousin. It reminds me of the fine line Sharpie markers with the squared off profile in the cap. Aesthetically, I have mixed feelings about this pen. In hand however, its a different story. It feels as it looks: heavy, sturdy, and very comfortable (with a seamless body and section), all pluses in my book. Roz: I pretty much fell in love with the Aion the moment I got to hold it. Brushed metal, black & silver, and clean lines – yes please. The weight surprised me as well. 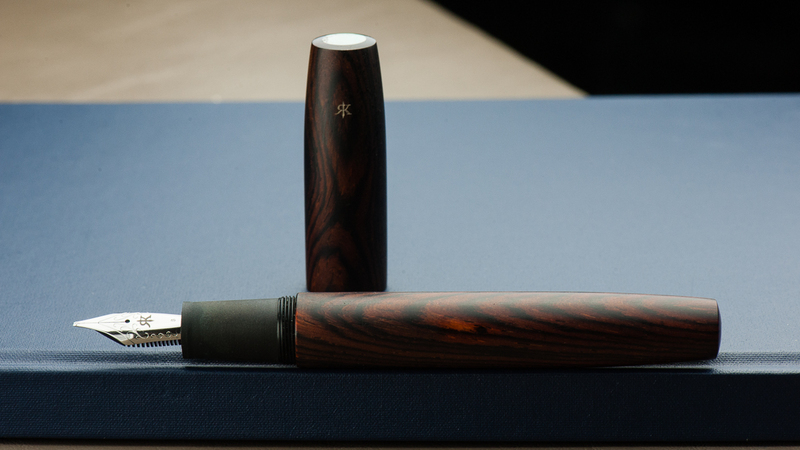 It was definitely heavier than most pens I would gravitate to, but what was surprising to me was that it was a comfortable weight to hold, even while writing. 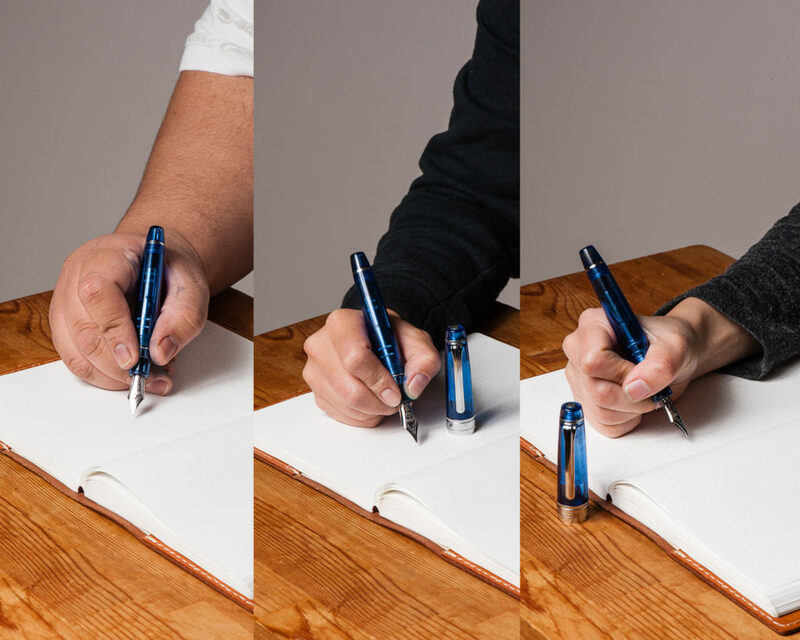 Franz: Lamy introduced the Aion a few months ago in the summer of 2017 but U.S. retailers did not get these pens until late November or early December. My co-worker who went to Germany in August for a vacation surprised me with this Aion fountain pen. I was surprised at how nice the brushed aluminum felt in my hands mainly because I’ve found that metallic pens especially their sections get a little slippery for me. The Aion was smooth but the texture allowed me to grip it without issues. It does look like a fatter Lamy 2000 or a VERY beefed up Lamy CP1. I’m loving it so far. 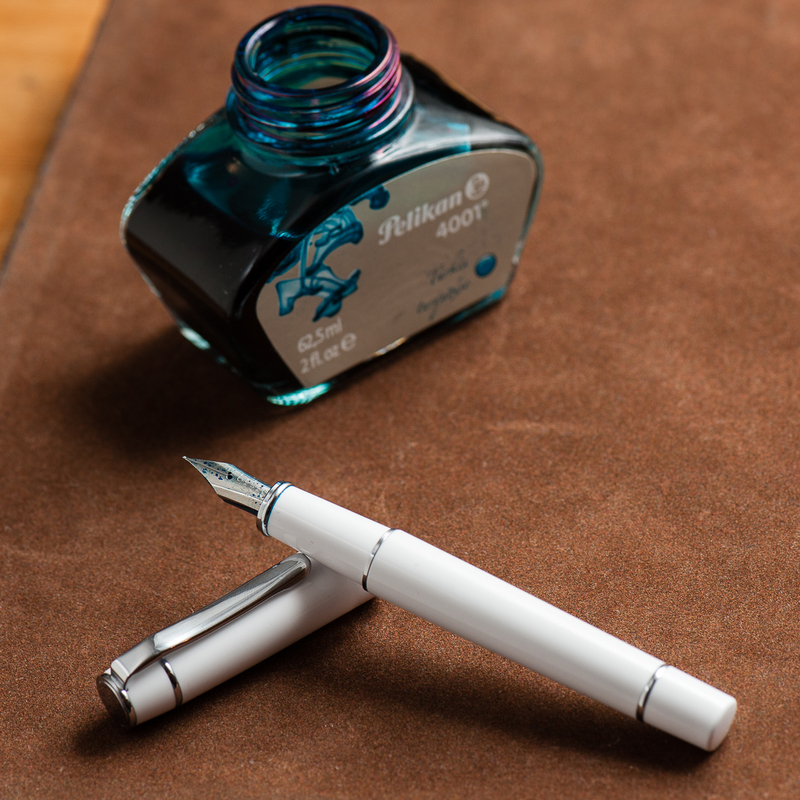 Katherine: Like most Lamy nibs, I find the Aion’s nib wayyyy too smooth. On Tomoe River, it’s almost nails-on-chalkboard-y for me. On less smooth paper, like copy paper, it’s more usable — and perfectly fine. 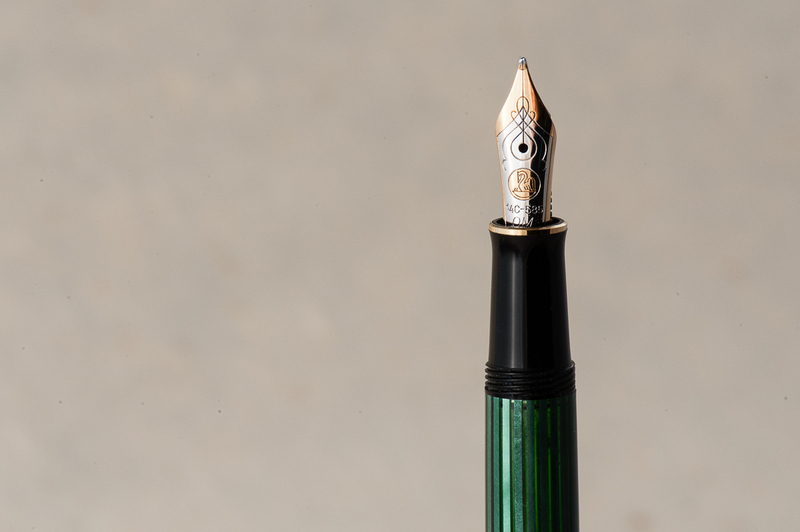 Pam: The nib was perfectly smooth and glided over paper superbly. 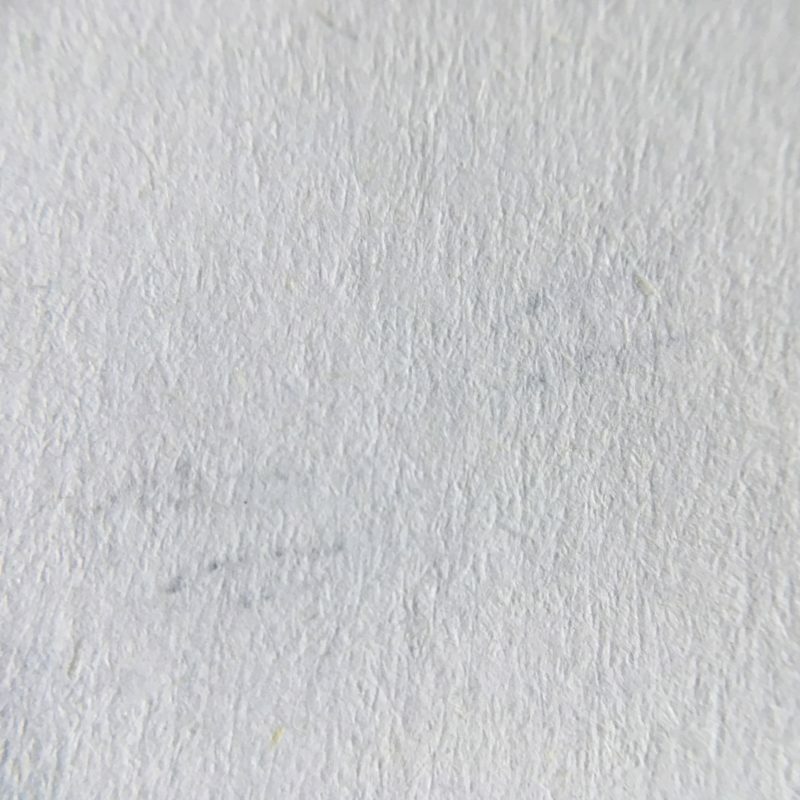 The wetter nib tended to feather on copy paper, so I kept it on Tomoe River paper most of the time. It left a well saturated consistent line with no skipping. Roz: The nib was easy to write with. Admittedly I prefer a finer nib so there were times when I felt I was almost painting with the pen, but the nib was smooth and the ink was consistent. 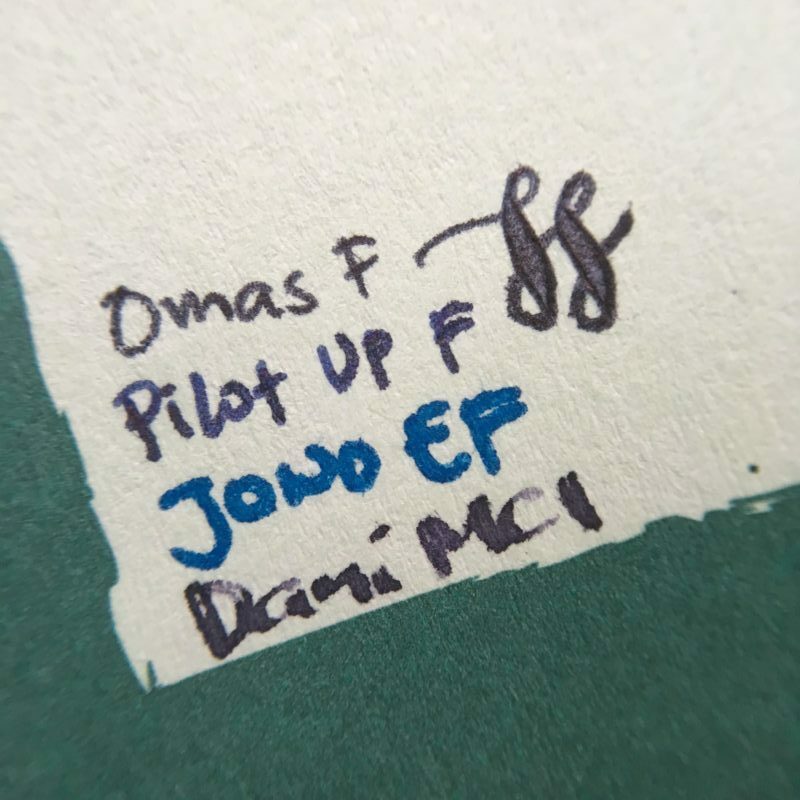 Franz: As detailed by the ladies above, the writing performance is smooth and wet. It writes like what a medium nib from Lamy does. One thing to note though, the Aion’s steel nib is stiffer than a Safari’s steel nib. Uhh… I do not recommend putting too much pressure on their steel nibs but the Safari does give a teeny bit of variation. 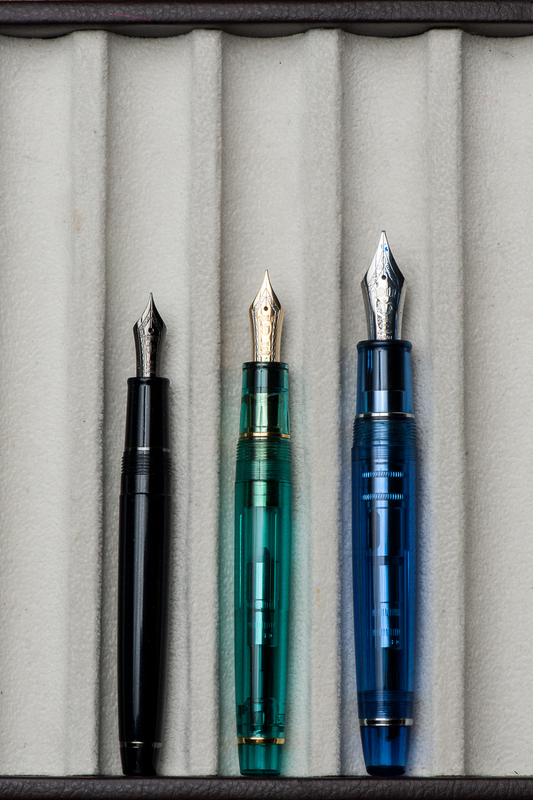 The shape of the nib is different compared to a Safari’s as well. 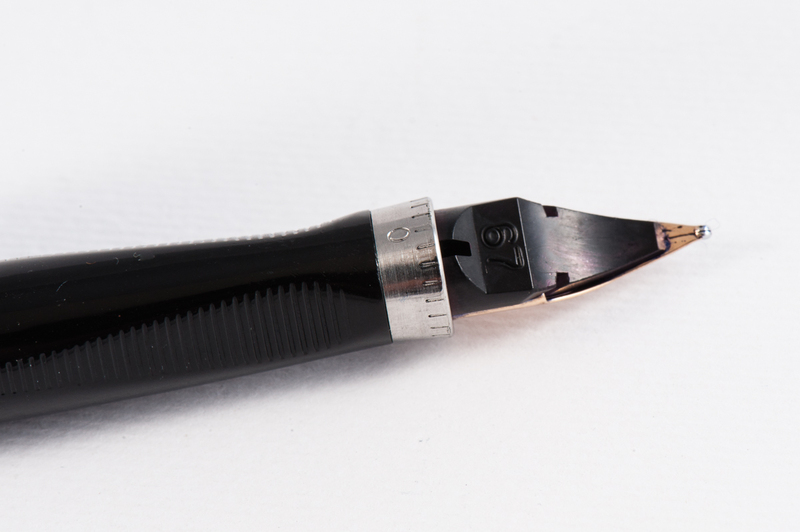 The Aion nib looks curvy which complements the section. 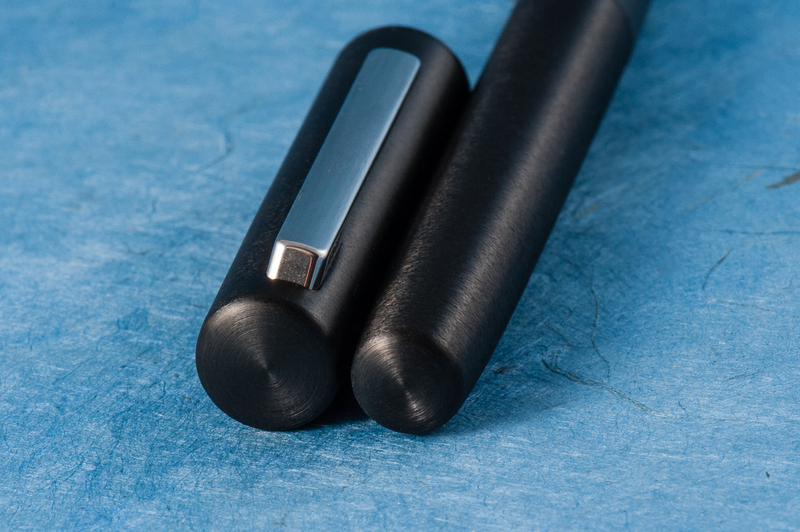 Since I’ve done so myself, the Safari nibs are interchangeable with the Aion. 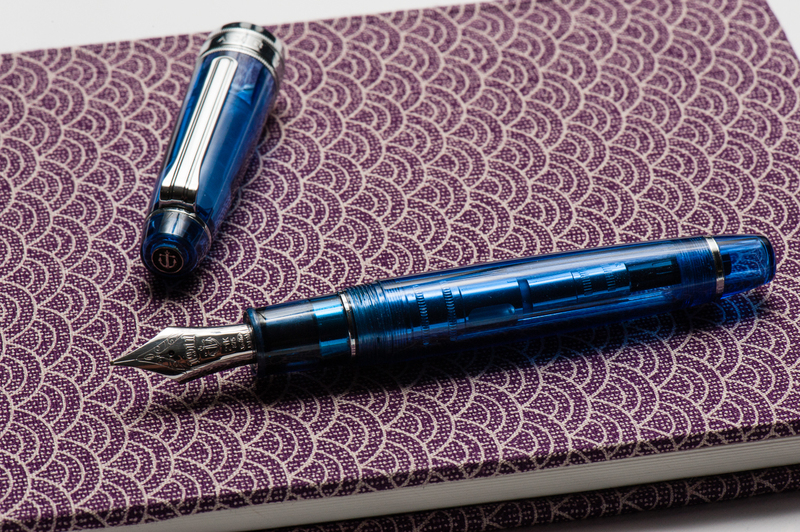 Katherine: I do most of my writing on Tomoe River… so this wasn’t my favorite pen to write with for a long duration. But, ignoring the nib, it’s a comfortable pen for me. The section is within my range and it’s a well balanced pen. I expected my fingers to sliiiide down the section slowly, but they didn’t! Pam: I am excited that this pen can be another home for the Lamy Safari nibs given that I have a harder time with the Lamy Safari’s section. The section with the matte finish/brush metal is a joy for my particular grip and sweaty hands. There is no step! It makes up for my reservations about the aesthetics of the pen. It’s heftier than most pens, but that’s to be expected with an all metal pen (and a bonus for me). I wouldn’t recommend posting this pen for those with smaller hands as it makes the pen more top heavy and can tire out the hands. Overall, I savor writing with this pen given how comfortable it is. The width and the non-slip grip section is spot on, even for those with petite, fisty, grips. Roz: Writing is awesome with the Aion. I prefer to write with it unposted, the balance seems to suit me better. It was amazingly easy to write with this pen, the slope of the section is so well done it didn’t leave any impressions. Franz: Using the Aion to journal with is awesome. I wrote with the cap either posted or unpsoted and it was comfy both ways. The unposted length is quite perfect for me but if I wanted a little more weight, the posted length wasn’t too long. One thing to note, although the cap posted on the barrel for more than an inch there were a couple instances when it slid off the pen. It does post securely at first but in my 10 minutes of writing, the cap loosened and slipped off twice. Perhaps I was writing voraciously? I don’t know… haha! It was still a nice writing experience for 20 minutes and I liked that the section did not have a mark of where my grip should be like that triangular-ish section on a Safari. The Aion beside a Curnow Backpocket Journal. 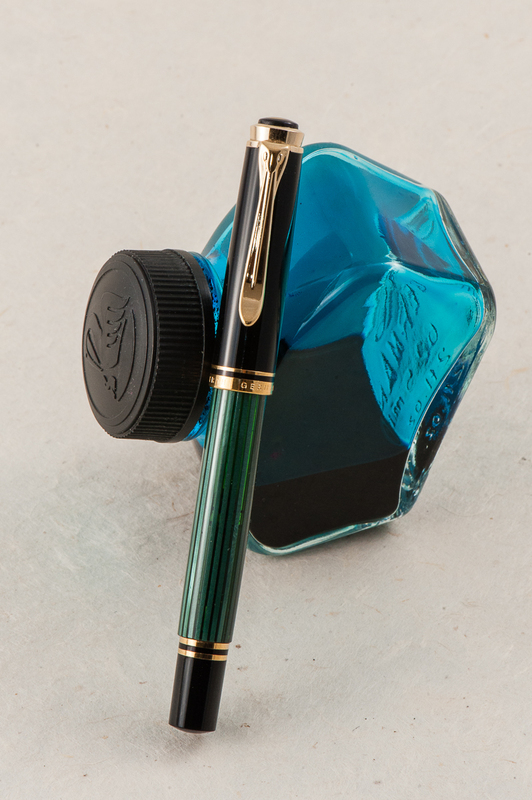 A Lamy ink bottle in the background. Katherine: The snap cap is super convenient. And makes a nice clicky sound. Click click. Definitely an EDC-able pen, but wouldn’t be my go to for the reasons listed previously. Pam: I would have no problems taking this pen around at work given it’s sturdiness and snap cap. It harkens back to the days (and present time) of how I prefer snap caps and fast access to jot things down at work. It’s weight also is a good reminder that it’s in your pocket or the fact that it’s not, if you are forgetful like me. Roz: The Aion fit well in my carrier, but was a bit too heavy for me to wield throughout the day. What I did enjoy doing was sitting and writing with it for a solid chunk of time. Franz: Before we decided to review the Aion, I’ve used it at work for about two weeks. The quick deploy of the snap cap, the spring loaded clip for the shirt pocket, and the black finish made for a distraction-free every day carry pen. I’m only wishing it had a fine nib because there were times when the line width was too thick for the cheap copier paper we use at work. I also used the Aion with my Curnow Backpocket Journal. Now that juicy medium nib was perfect for the Tomoe River paper in that journal. 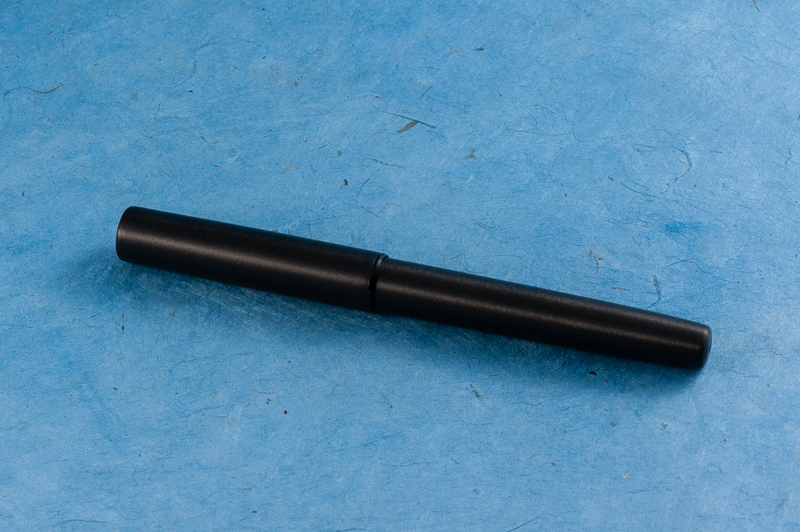 The Aion is filled via either the Lamy cartridges or the supplied Z26 converter. During my two weeks of use, I refilled it three times. I did miss my Lamy 2000’s piston filler capacity but it’s far from being a deal breaker. Katherine: Lamy pens and I don’t really seem to get along and the Aion is no different. 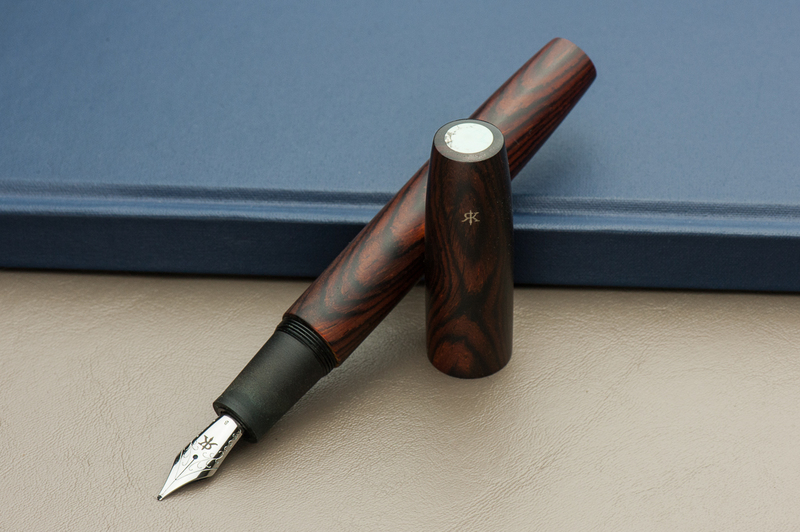 But, all of my gripes are very subjective — if you like the smoothness of Lamy nibs and the aesthetic agrees with you, there’s no (surprise) reason you won’t love this pen. It feels well made and finished. Pam: I haven’t been this excited over a “less than $100” pen in a long time. 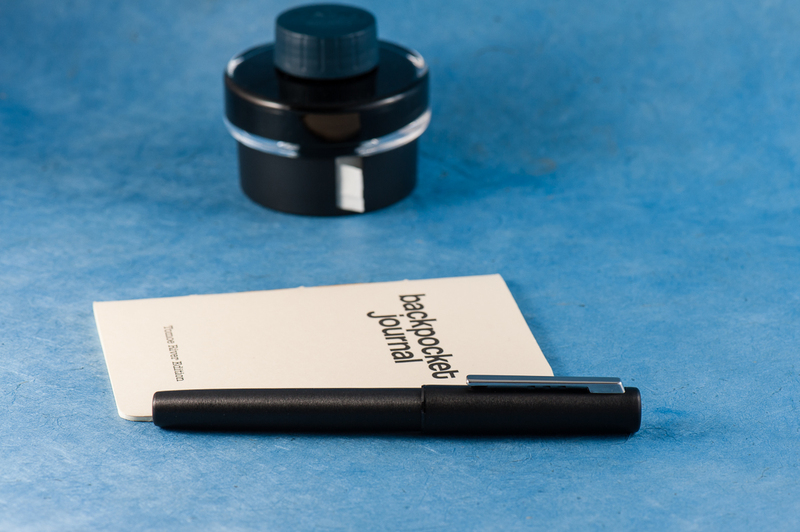 If you are looking for an upgrade to your Lamy Safari and enjoy the more industrial, minimalist design, this is the pen for you. 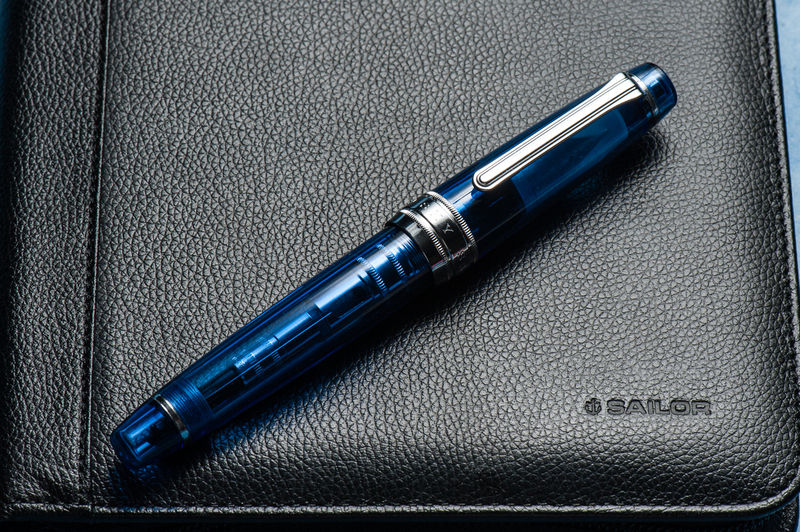 If you enjoy writing with a sturdy, metal pen at a very reasonable price, this is the pen for you. 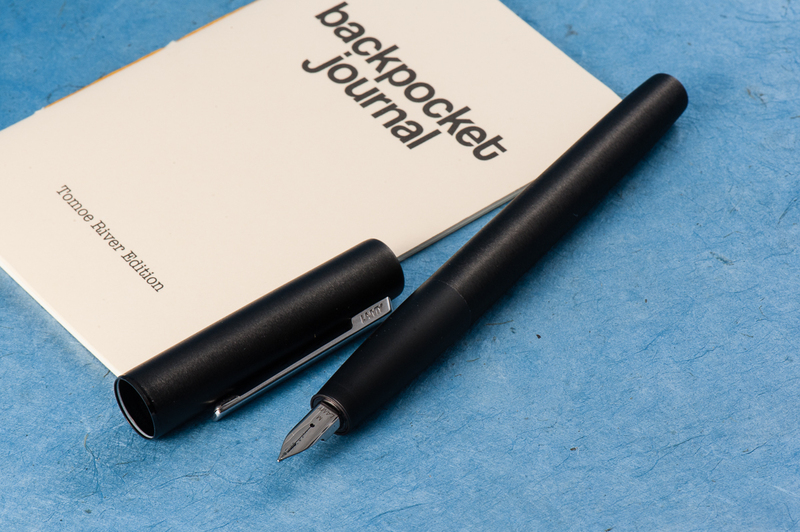 If you don’t want to spring for the Lamy 2000 (yet) and wonder what else Lamy has to offer after the Safari or Studio, this pen is worth a shot. 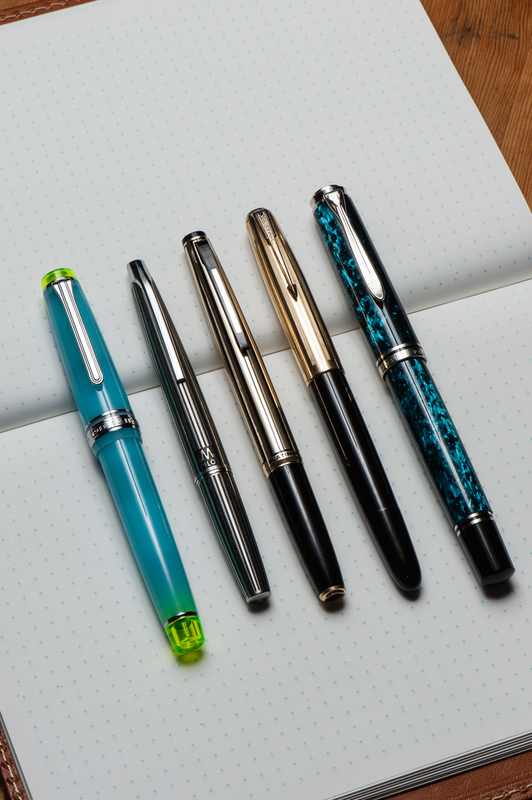 Honestly, in this price range, there aren’t that many pens I could recommend over the Lamy Aion with the features mentioned throughout this post. My only reservation is on the bulky cap, but in terms of writing experience, I have no complaints. It’s a very unassuming pen that brings great value. I love using this pen and will be inked up in rotation quite a few times. I kinda wish they had more color choices though. If they come out with other colors other than black, and silver, I’d probably get another one. 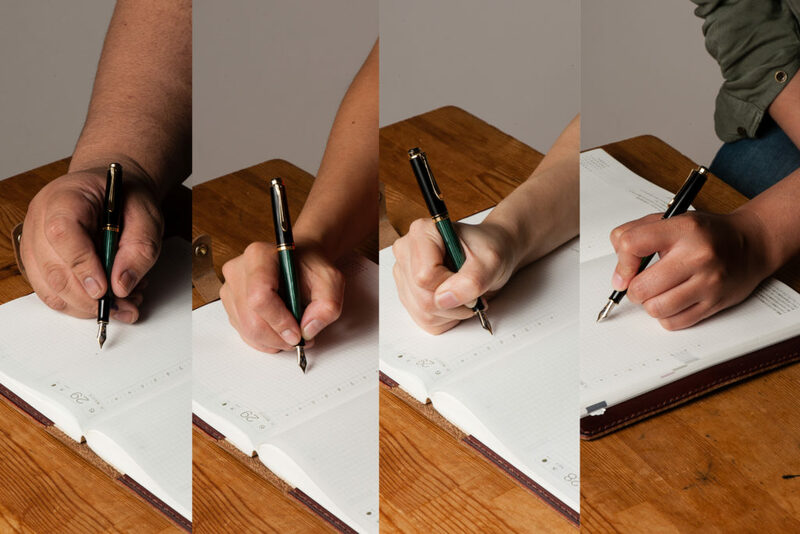 Within the four of us, we have different hand sizes and we found it a comfortable pen to write with. So the Lamy Aion is definitely a pen you should try to write with! The cap and barrel finials are circular and simple. Pam: December is a month that I look forward to the most due to the holiday season. One of my favorite pens that was an ode to this magical time of year is Bungbox’s Silent Night, a limited edition made available last year, 2016. 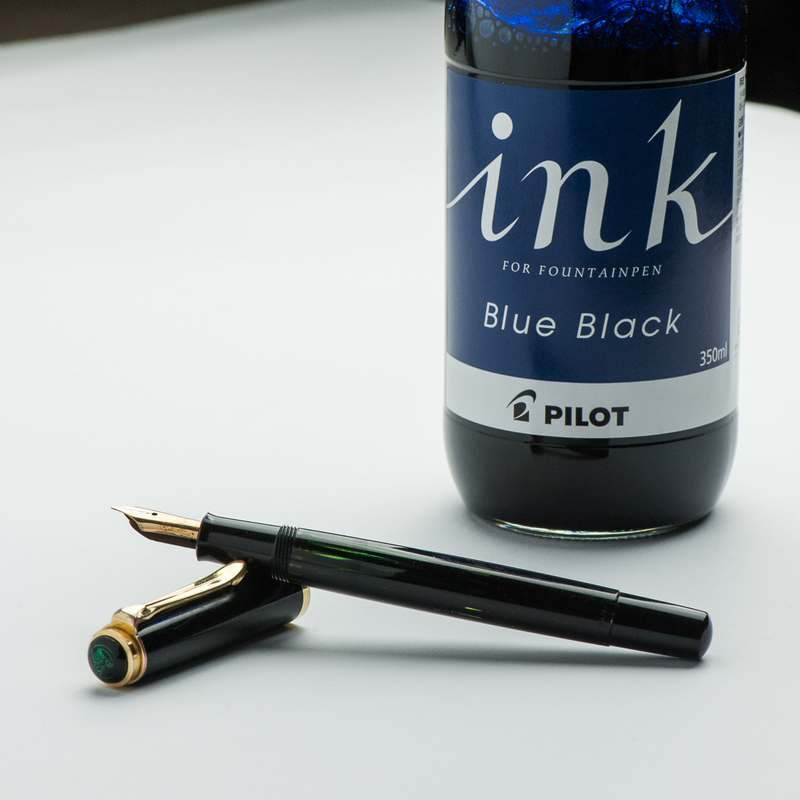 I don’t have an affinity to blue black inks such as Silent Night or Bungbox 4B. 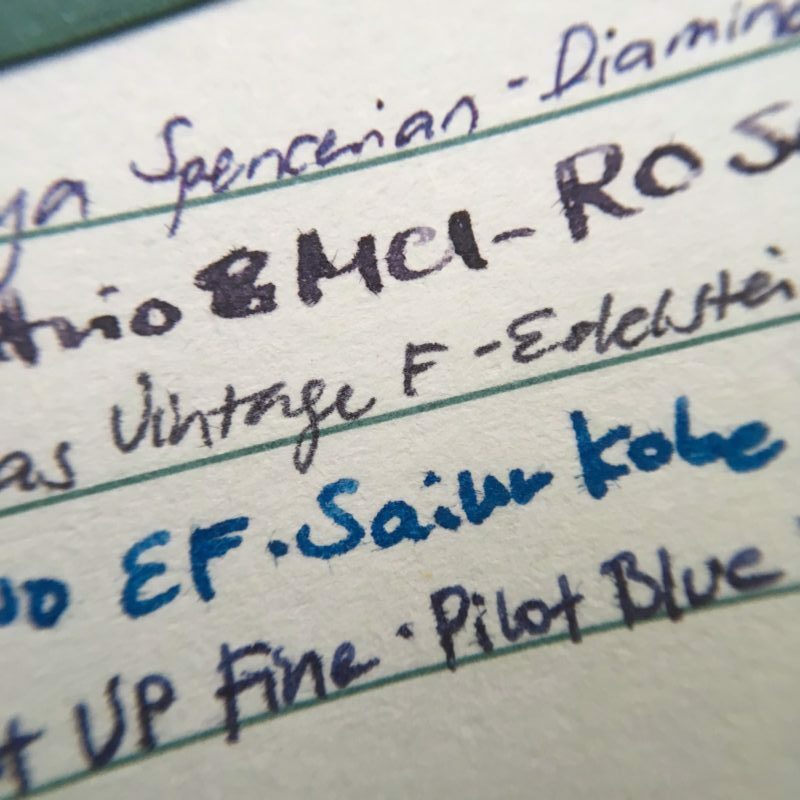 Blue grays, however, like Pilot Iroshizuku Tsuki-yo, is one of my favorite inks of all time. Therefore, it would only seem fair to try Robert Oster Blue Night in the Silent Night. 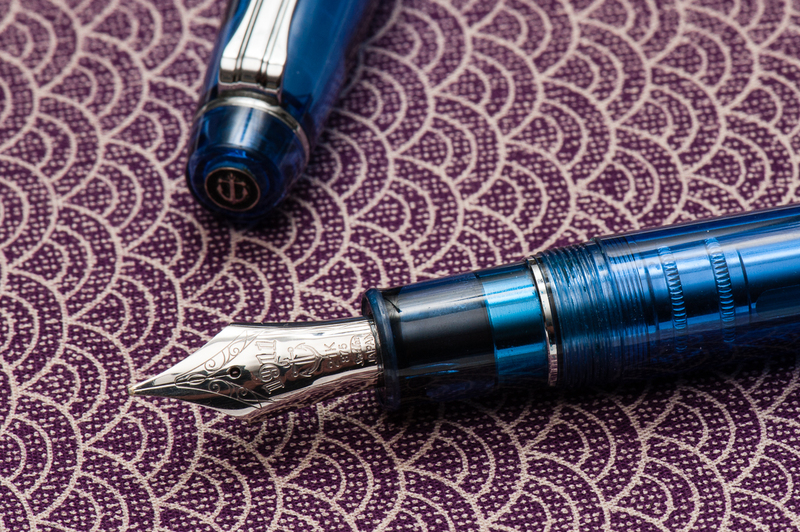 Blue Night reminds me of Tsuki-yo, but has more shading, at least in this pen with an Japanese F nib. I do wonder if the shading properties would differ in a wetter nib. Given that I have only inked it for less than 24 hours, I will report an update on Blue Night to determine if it’s a keeper. Franz: For the month of December, I chose a vintage pen. 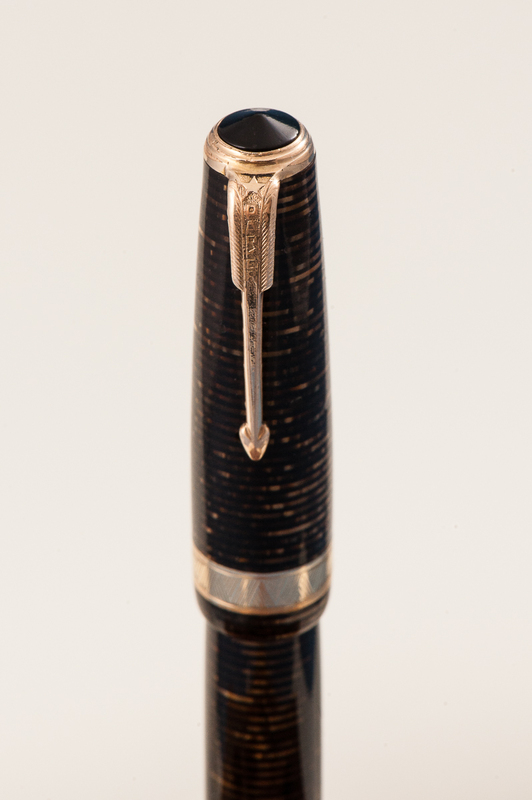 But it ain’t just any vintage pen, it’s my Parker Vacumatic Senior Maxima in a Golden Brown finish. 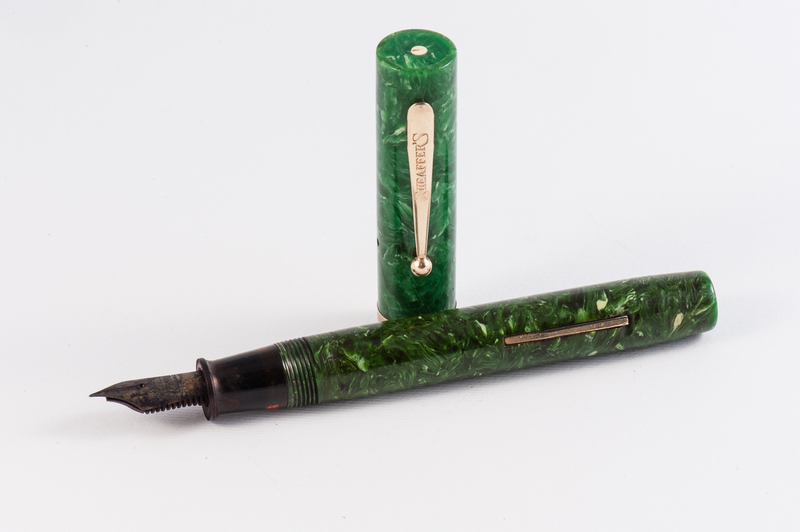 I recently got the pen this year and it’s in such great condition for a pen made in 1939. I always adore that stacked coin design of the Vacumatic celluloids. Something special about this pen is that it has a Star clip. This was a transitional clip in models made in 1938 thru 1939 before Parker came up with the Blue Diamond in 1939 as well. The size of the Maxima fits my hand very well. 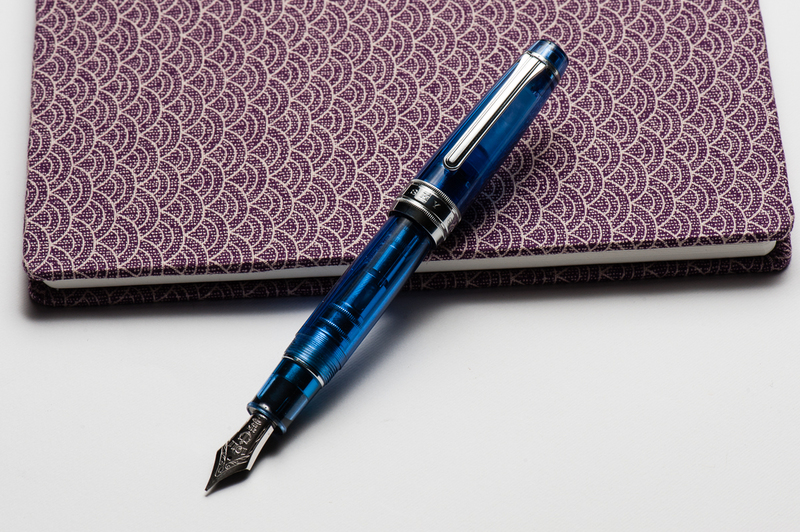 I chose Akkerman #05 Shocking Blue as my ink because the blue ink complements the beautiful brown celluloid finish of the pen. Plus it’s an ink that I’m comfortable using in my vintage pens. Happy holidays to you all! And keep enjoying your pens and ink! 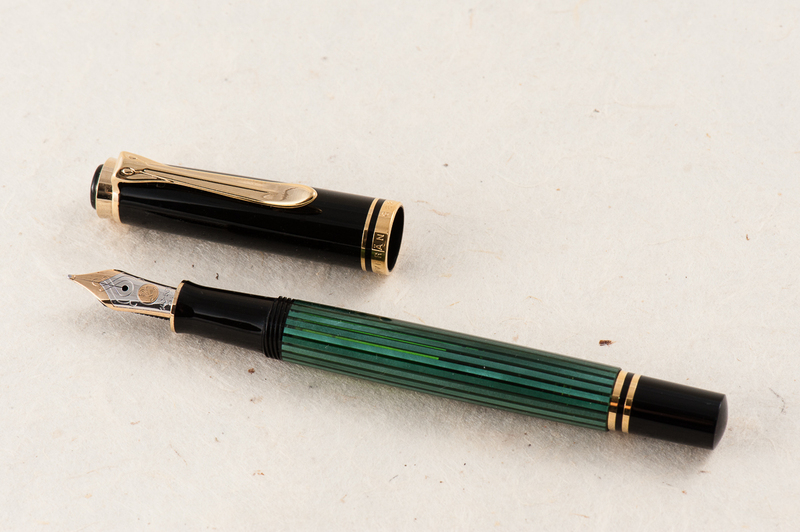 We are once again joined by our guest reviewer, Roz and she contributed her thoughts on this Pelikan pen. She is also our first left-handed reviewer and we are glad to have her persepctive. Thanks very much Roz! Roz: Classy and petite! The green, black and gold made me feel fancy just looking at it. I don’t usually seek out gold accents, but this pen makes me question that inclination. Definitely the smallest pen I was ever going to write seriously with, so I’m really looking forward to it! 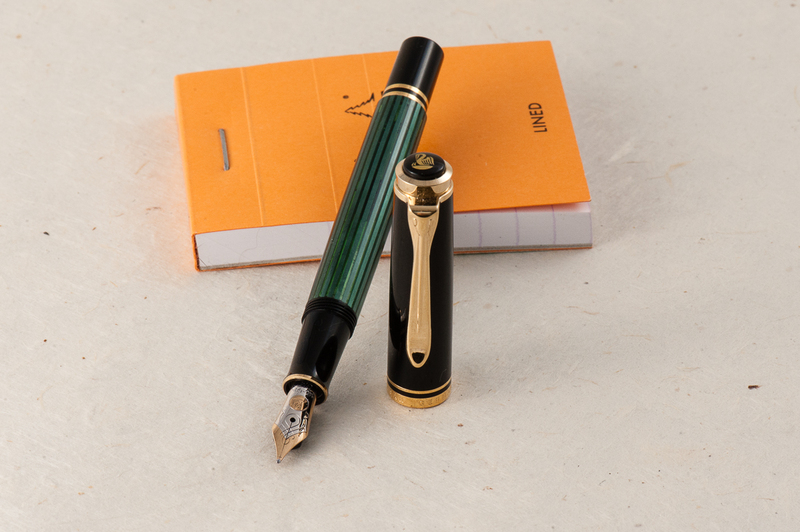 Pam: Great things come in small packages so when you make a Pelikan petite, it’s adorable. My wallet is very lucky that the white tortie did not come in this size. 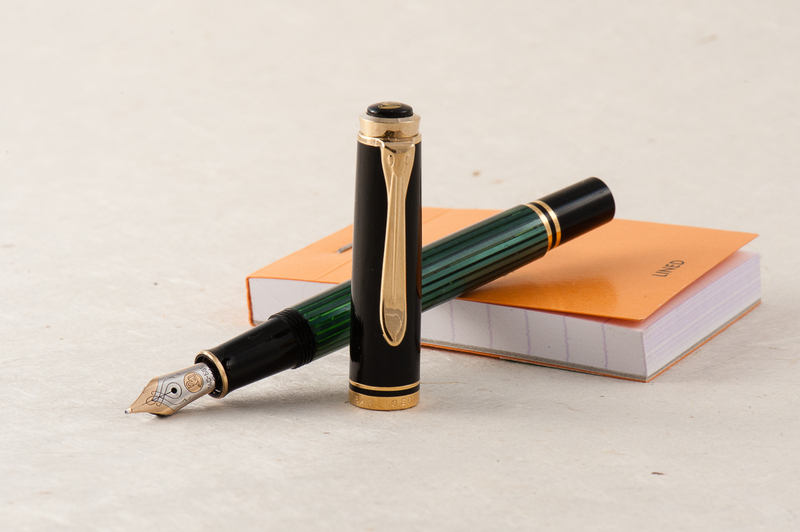 I don’t normally enjoy the “classic” styling of the Pelikan, but in a small package, it harkens back to the vintage Peter Pan pens. Franz: Hey! 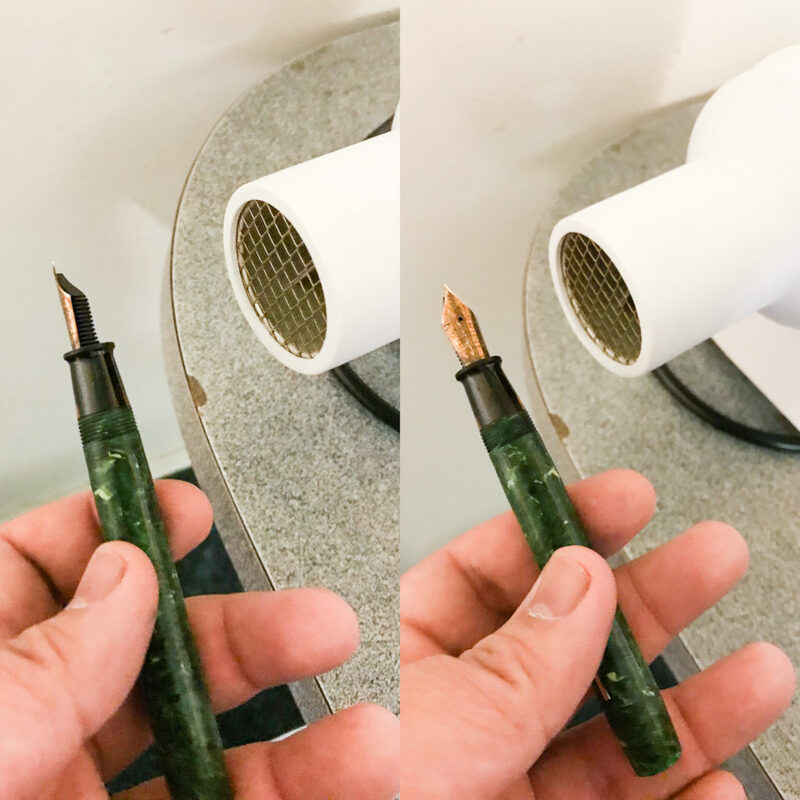 Did someone leave a Pelikan M1000 in the drier, or did it shrink from ink starvation? Harharhar! 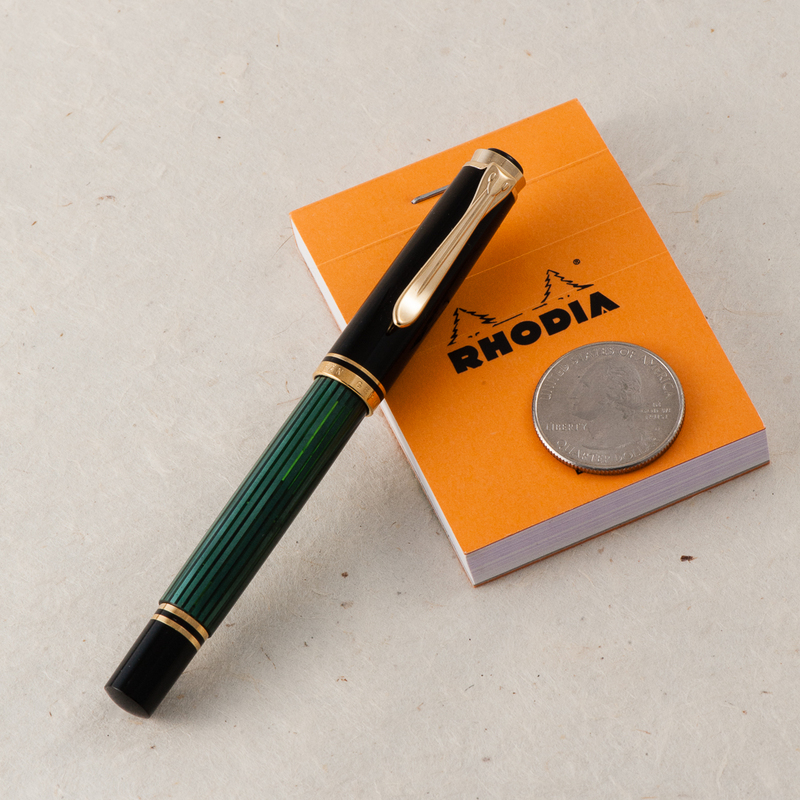 Yep, it’s that familiar and elegant green stripe of a Pelikan in their smallest pen ever. 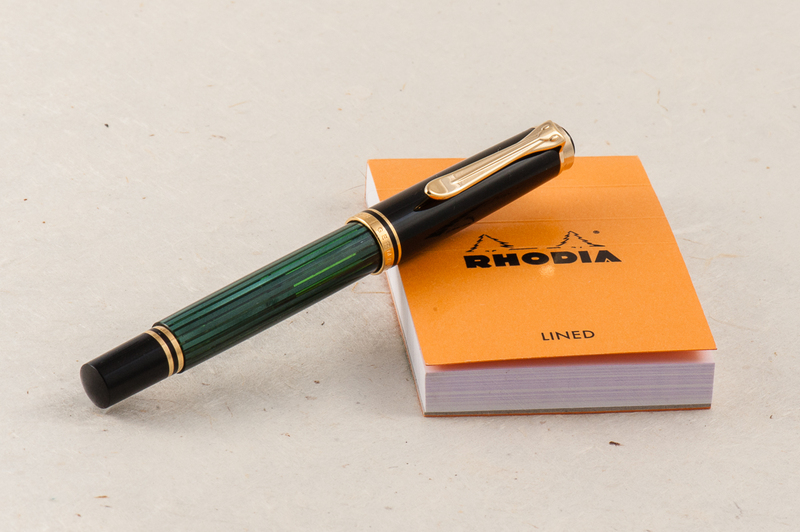 They introduced this pocket pen version in 1998 and the green-striped finish is a standard finish as well as a black barrel one. 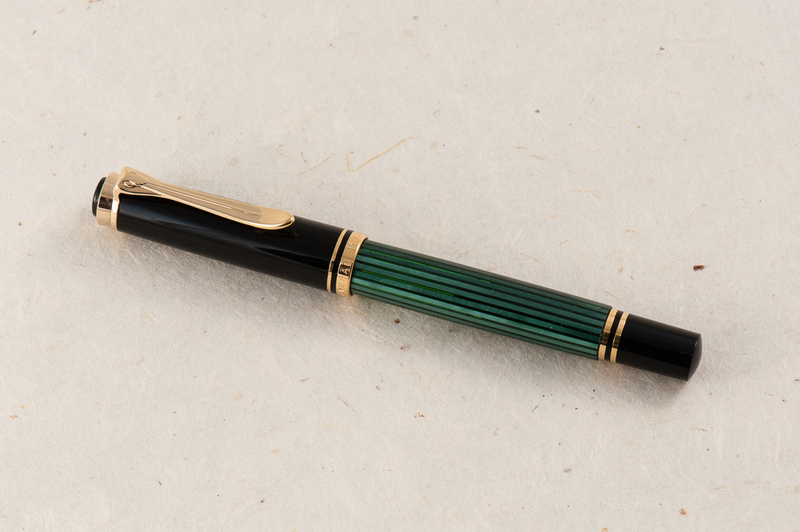 Pelikan also produced a few special edition finishes in the year 2000’s. 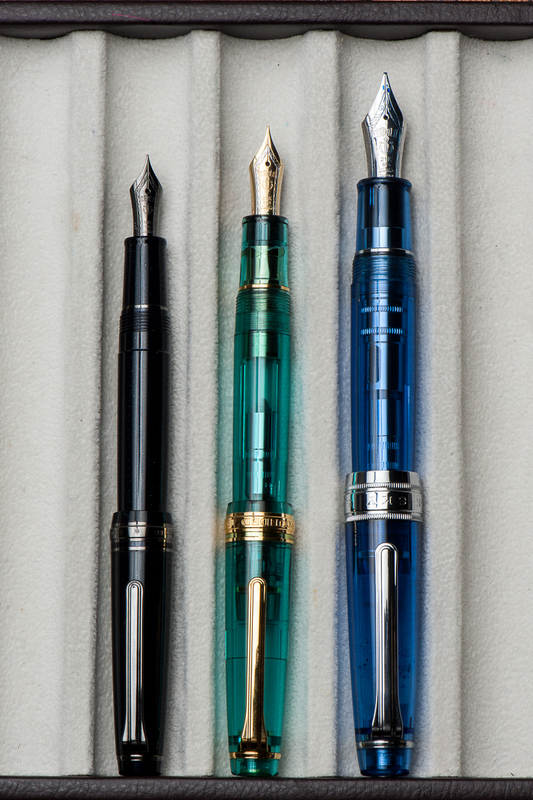 The M300 is unmistakably a Pelikan Souverän pen. Roz: Springy! Honestly, I had a lot of trouble writing with this nib. I wasn’t expecting the amount of bounce back, so my natural writing pace had a lot of adjusting to do. I also learned (thank you Pam!) that this is an oblique medium nib, maybe my inexperience with this type of nib added to my inconsistent writing. Pam: I find the oblique nib to be too inconsistent for my writing style. I always feel that I am apply more pressure to the “longer tine,” if that makes sense. 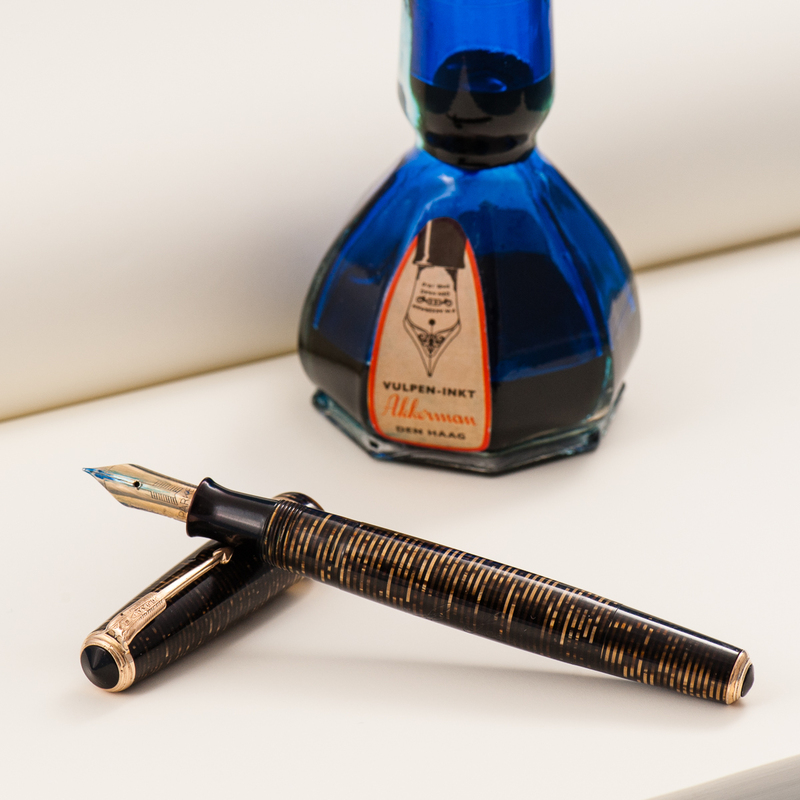 That being said, like all Pelikan nibs, I find the nib to be smooth and enjoyable to write with. This nib somehow reminds me of an ice skater gliding over the ice on one leg. 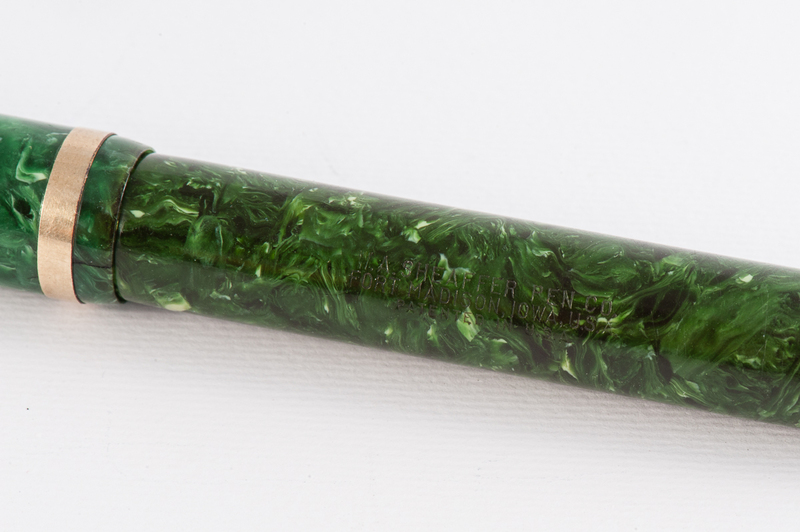 Franz: The M300’s 14-carat nib is quite springy and I love it! An oblique nib’s characteristic always seem weird to me at first but I eventually get used to it. It’s just being conscious of turning the pen at the right angle. But yes, this nib’s flow is quite generous and I enjoyed it. Roz: The diameter of the pen being so small, especially because I tend to grip low on the section, made it difficult for me to find a comfy grip position and my hand got tired pretty quickly as a result. Katherine: This pen is usable for me for quick notes… But not the pinnacle of comfort for longer writing sessions. Overall though, not bad. Much more usable than I expected, but definitely more of an on-the-go pen than a sit-at-my-desk-and-write-about-my-deep-dark-feelings. Pam: When I said that this pen reminds me of the Peter Pan pens, it’s likely due to how I see this pen being used. 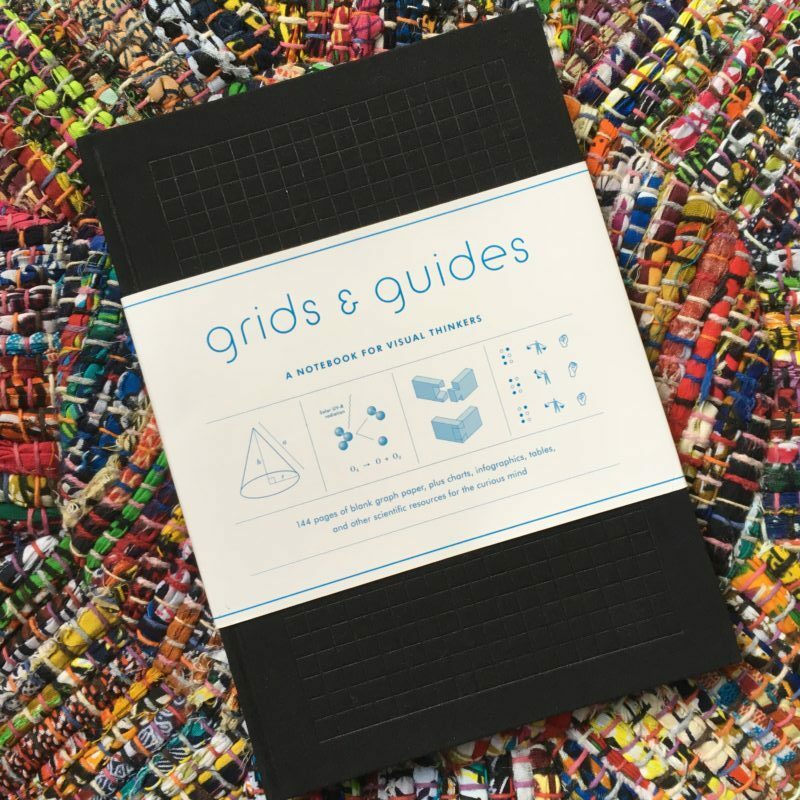 For quick notes in a pocketbook. I find the diameter of the pen to be too slim for a prolonged period of time. I am always fearful of snapping this petite pen with my iron grip. Franz: At 4.3 inches closed, it’s a small pen. I went into the 20-minute writing session already expecting that my hand wouldn’t be comfortable. And I’m glad I managed my expectations because I did feel fatigued after ten minutes. The section and barrel’s thinness contributed to that fatigue. 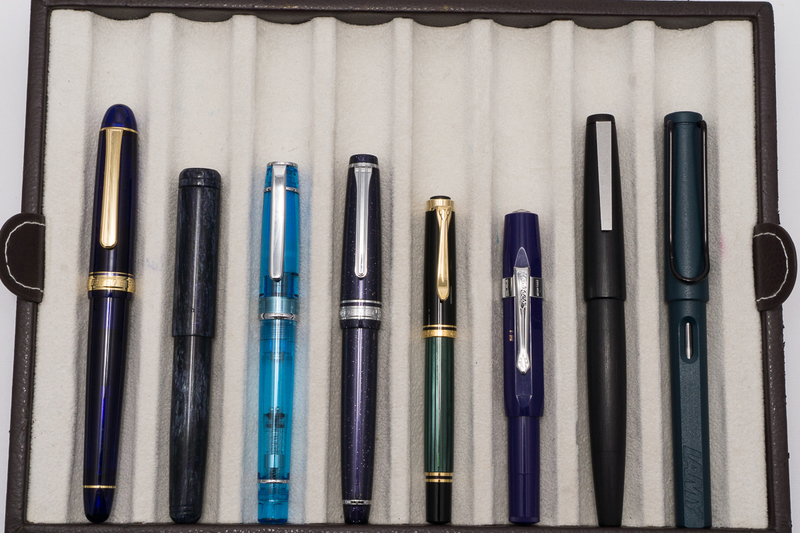 I only used the pen with the cap posted because unposted, the M300 was almost disappearing in my hand. Roz: At first I was super worried I would lose this pen because of its size. However, the clip on the M300 is really strong and it did great in my carrier. 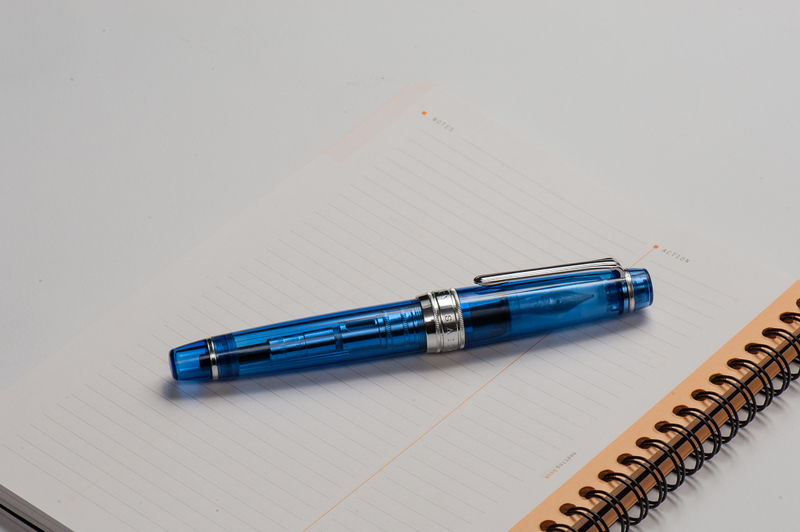 I admit though that for my day to day writing, I did not use the M300 much due to the size of the pen being difficult for me to hold for long periods of time. Katherine: Great pen for EDC! 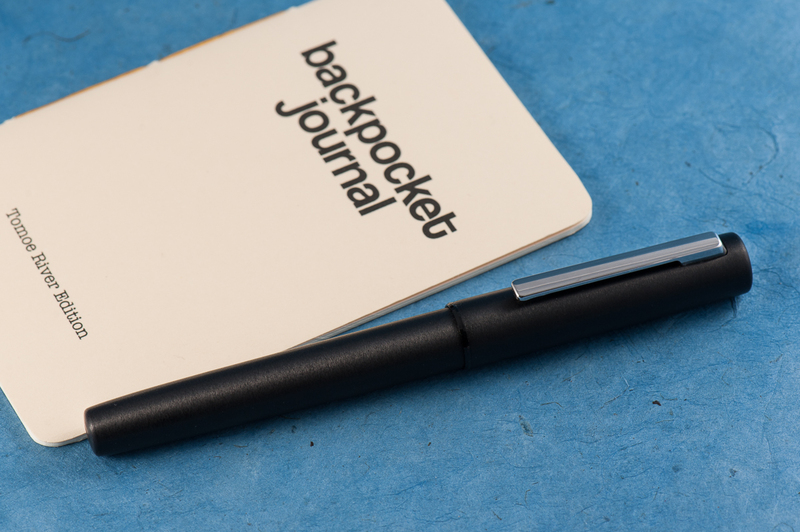 The clip is strong, the size is perfect and the nib makes notes enjoyable. 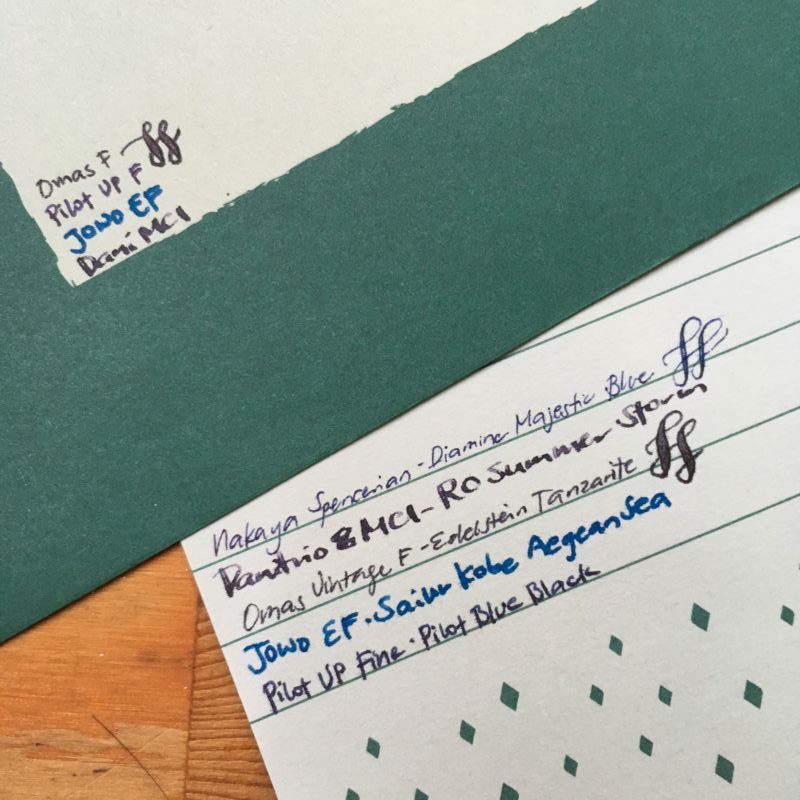 My only gripe is that the typical Pelikan wetness, paired with a medium nib doesn’t make for the fastest drying notes. That’s easily solved by getting a different nib though. 10/10, would EDC again. Pam: In a checkbook, pocket book or a dainty pocket, it’s perfect! Perhaps it’s the size, but I feel that it’s more fragile than the normal size pens so I wouldn’t throw it into a jeans pockets if you plan on sitting down or putting your keys in the same pocket. Franz: The M300’s Every Day Carry-ness is what won me over though. Definitely fits in my shirt pocket, and it’s ready to write with only one turn of the cap. It may be too short for my hand unposted but is perfectly usable for a fast signature, jotting down a phone number, or whatever quick note one needs. If I know I’ll use it for more than five words, I’ll post the cap and it does so securely. Unlike Pam’s thoughts, I didn’t find the M300 more fragile than any other pen. Granted, I wouldn’t dare to sit on this pen (or any other pen) but it’s quite durable for everyday usage. 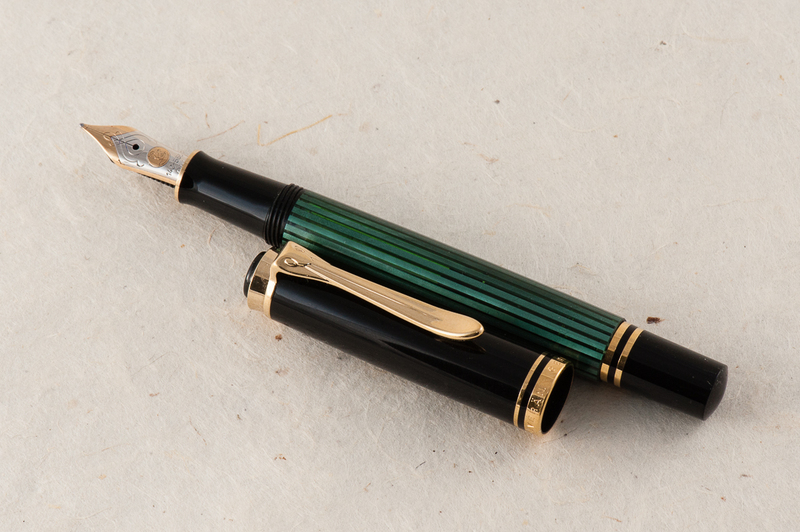 And just like any other Pelikan Souverän, it’s a piston-filled pen and the piston operates very smoothly. 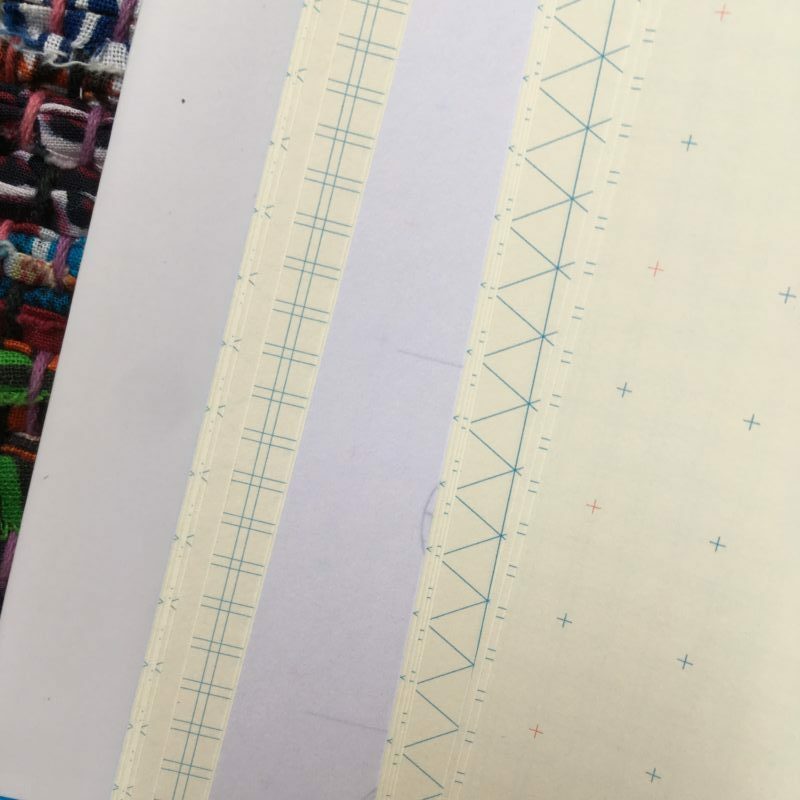 As shown in the photo below, you can see through the barrel’s stripes and see the ink level clearly. The smaller barrel definitely means a smaller ink capacity though. And it holds about 50% less ink than an M1000. 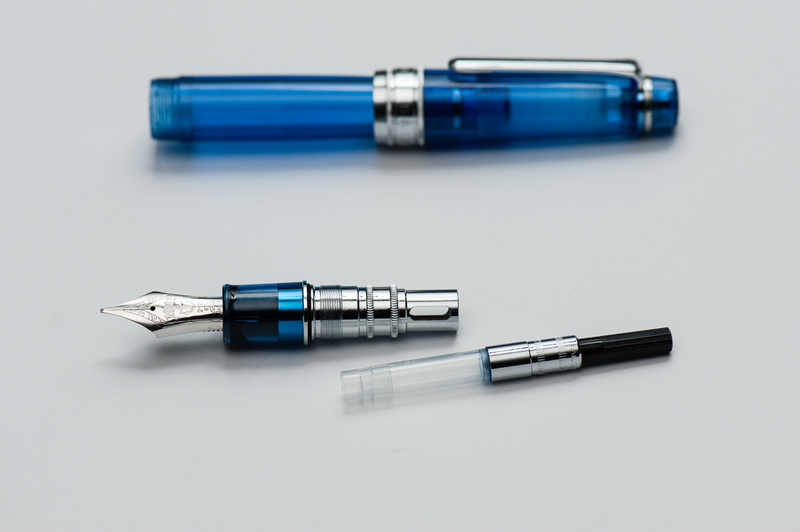 At 0.7mm, the ink capacity is just like a converter for other pens. 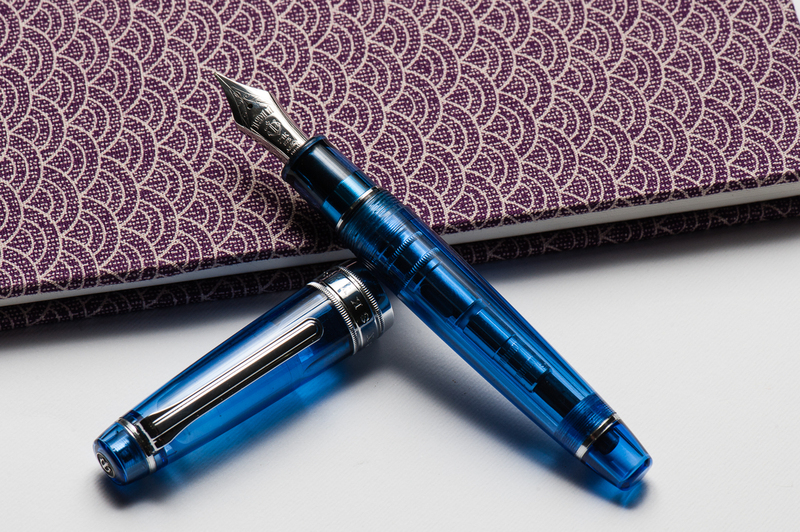 Katherine: A great pocket pen! Classy looking, fantastic nib and the perfect size. 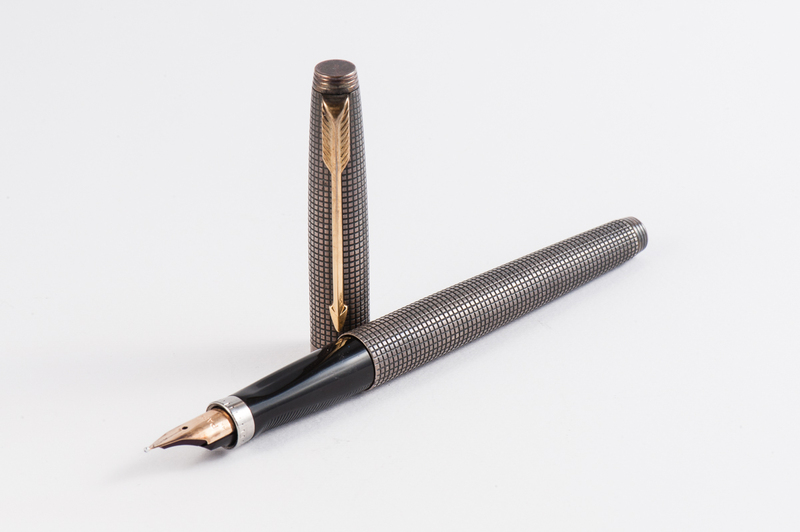 My only gripe is the price, for $200+, I would likely get a vintage 400 instead (fairly easily found at around $150) and I’d still have a reasonably small pocket pen, but one that can play dual duty as a normal writer as well. Pam: Despite my love for pocket sized pens, I would have to say that this pen is an acquired taste given the size. It’s not as practical as the M200 or M400 in size. 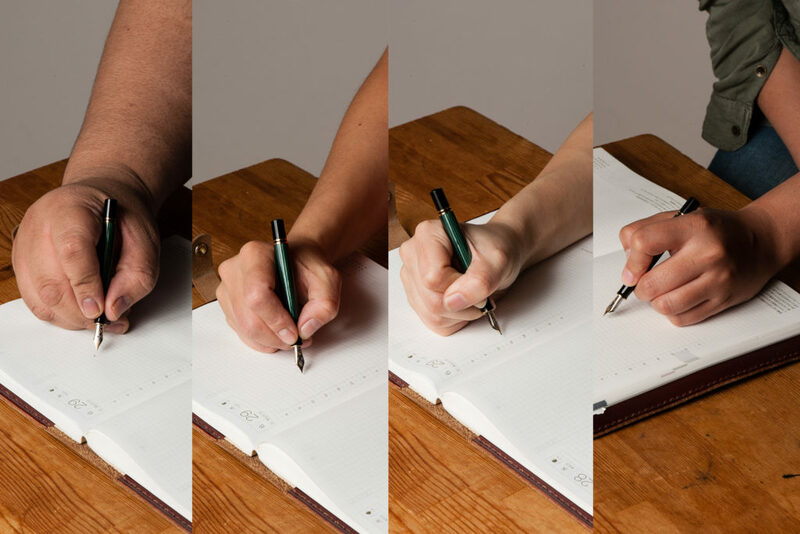 For those with average and larger size hands, it may be a challenge to use for an extended writing session. For those who love Peter Pan pens or pocket pens, I would highly recommend trying out this pen before committing your wallet to it. 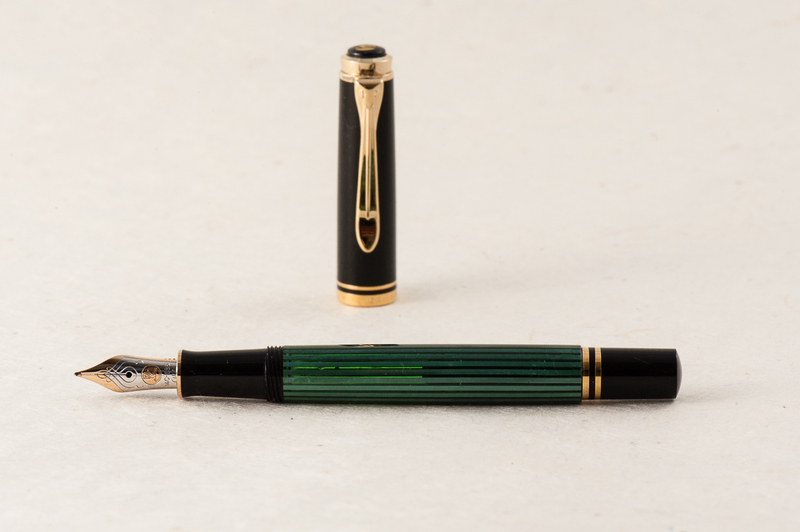 Franz: Clearly, the Pelikan M300 is for people with smaller hands or for people who wants to have an elegant looking pocket pen. Also, it’s a great pen for a Pelikan pen addict (like myself). Have you guessed who owns this pen yet? =) For my large hands, the M300 is a novelty. I love it but I don’t see myself using this pen comfortably on a daily basis. My hand is definitely happier writing with a M800 or M1000. 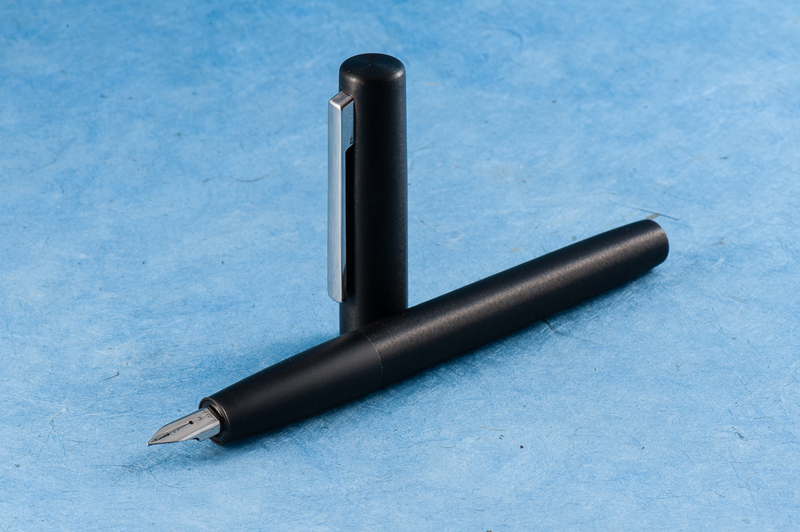 The M300’s Souverän styling gives it a serious and classic look but it’s tininess makes it a “cute” pen.